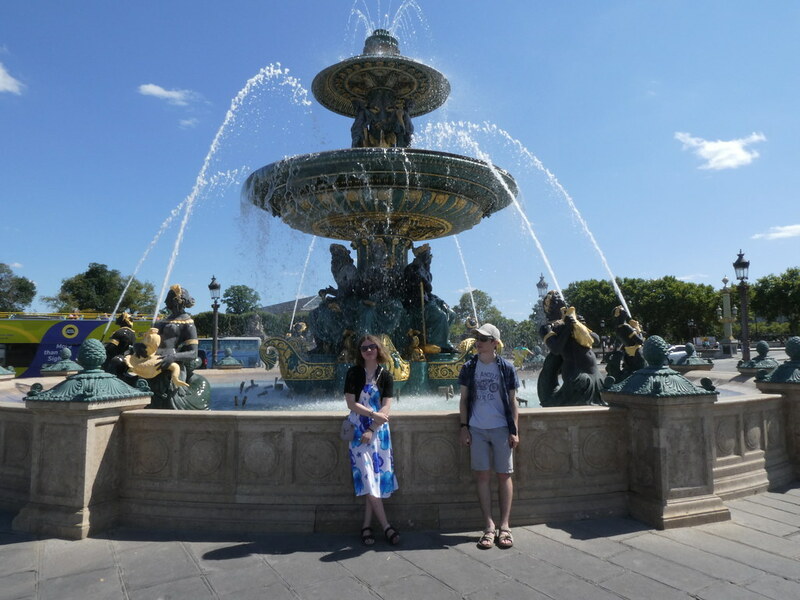 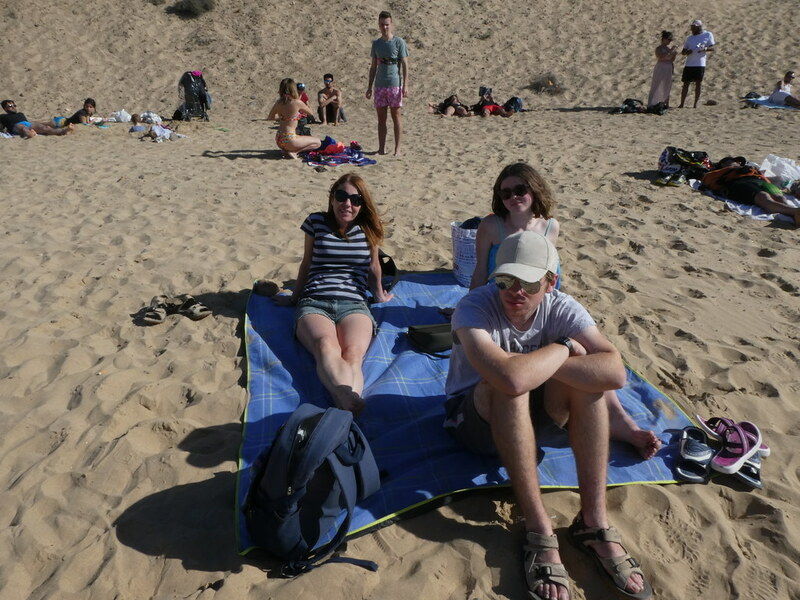 Second day of our Easter adventures was a total contrast. 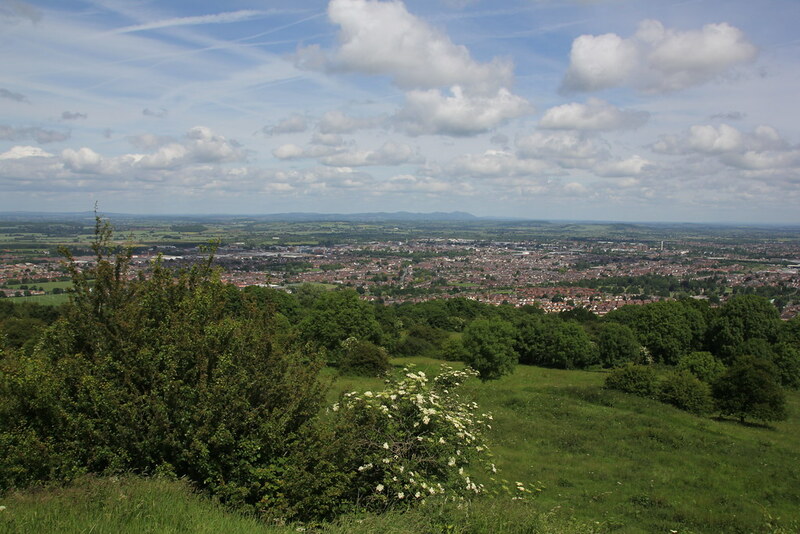 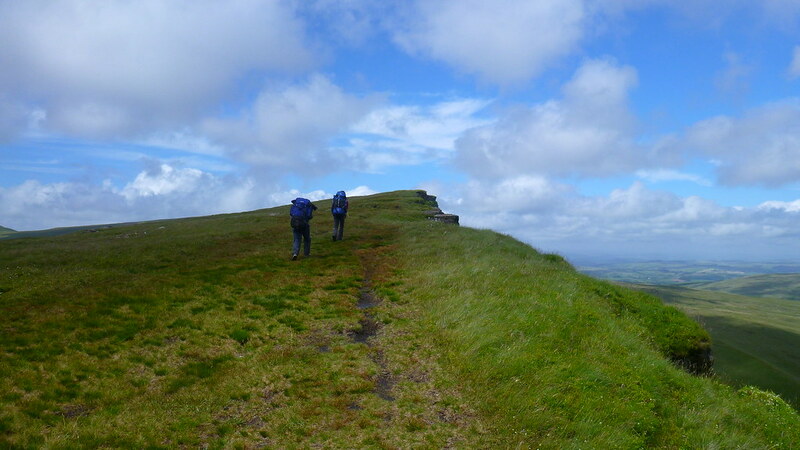 Blue skies and clear bold sunshine was replaced with leaden grey skies and a persistent rain. 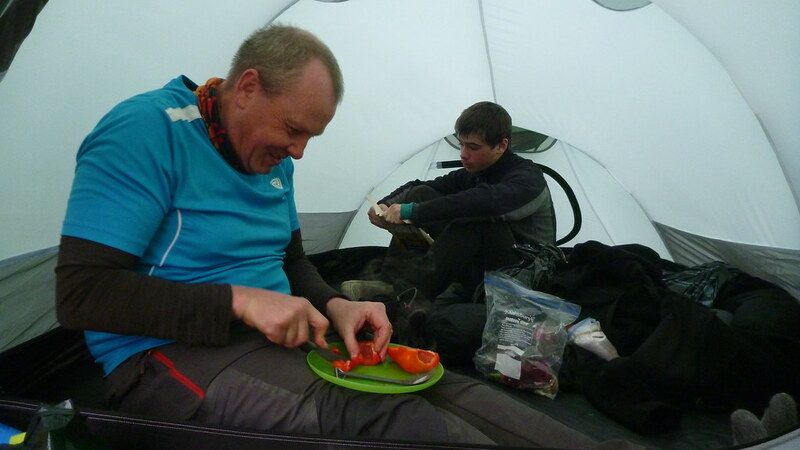 It had rained all night and a continuation led to an indoor breakfast. 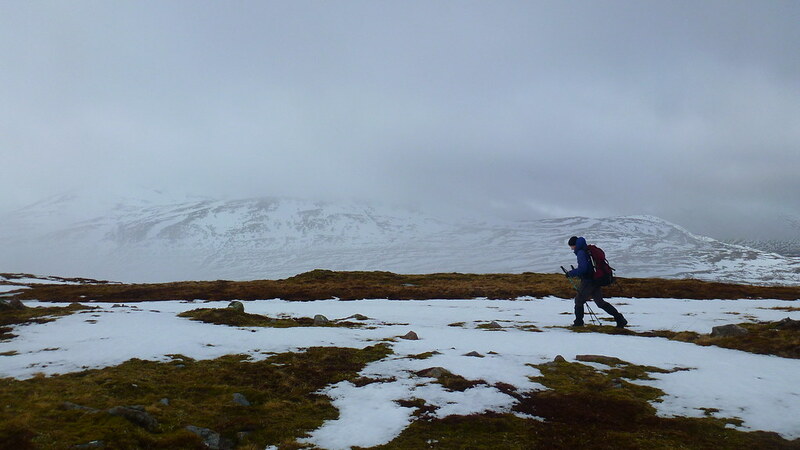 We finally emerged late morning as the rain stopped into a landscape drained of colour. 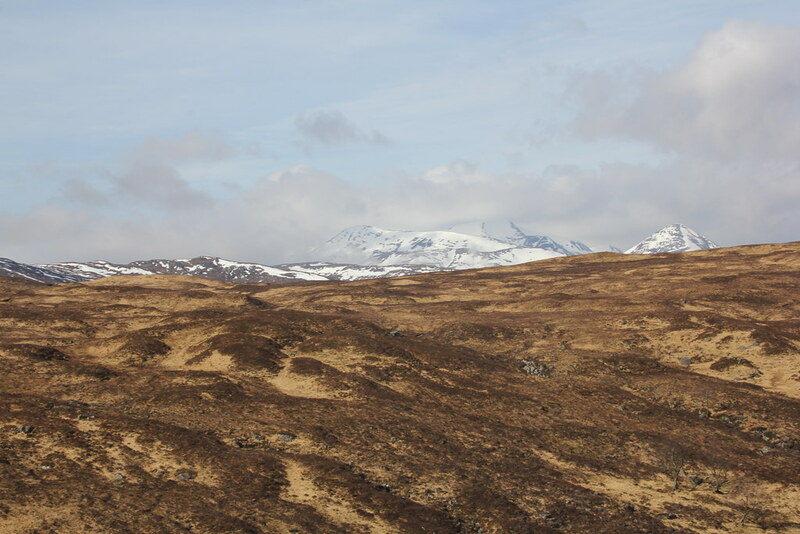 We pithered and pottered about the vicinity unsure what to do. 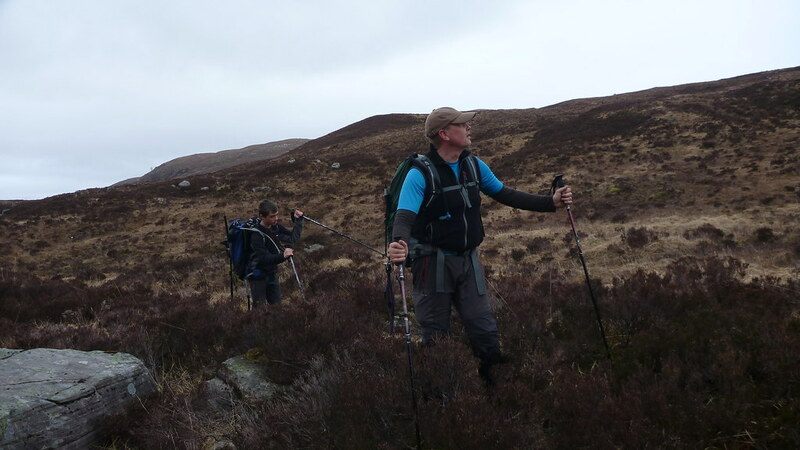 We were still a little tired after the previous days exploits and as even the lower summits were smothered there seemed little point in any kind of hill climb. 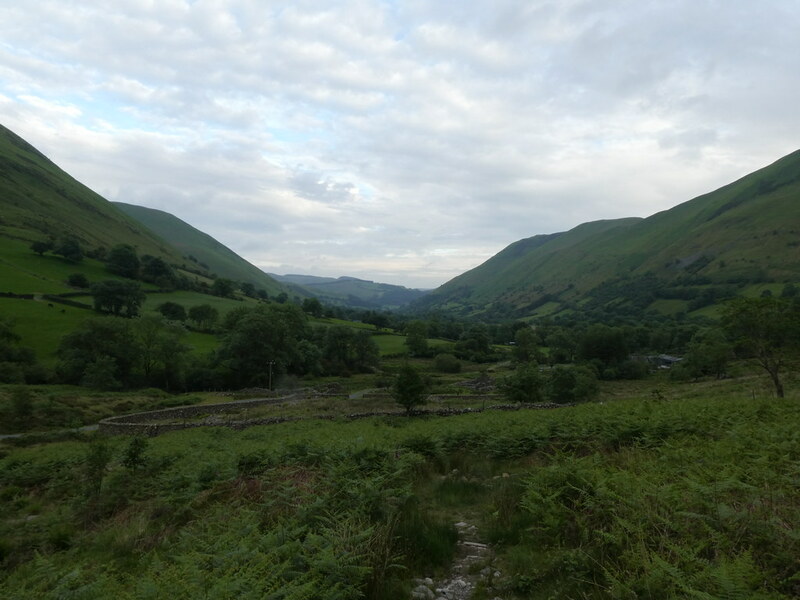 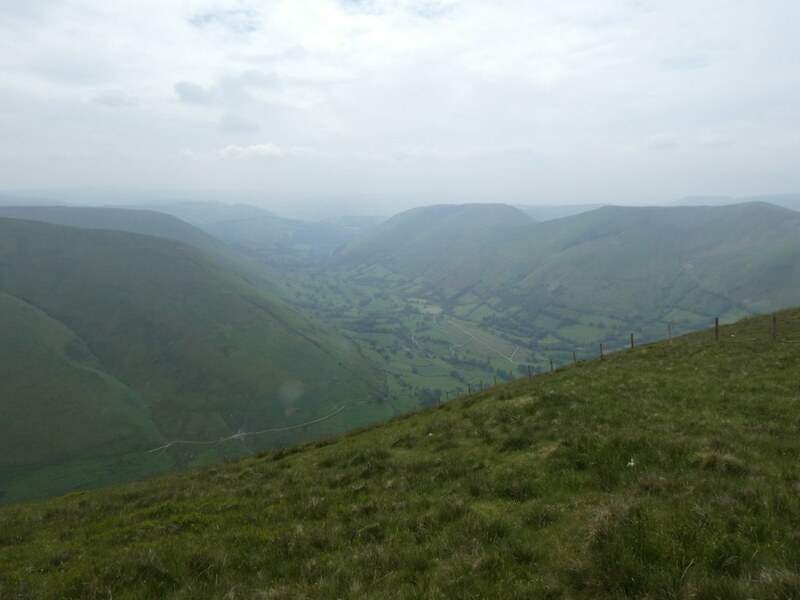 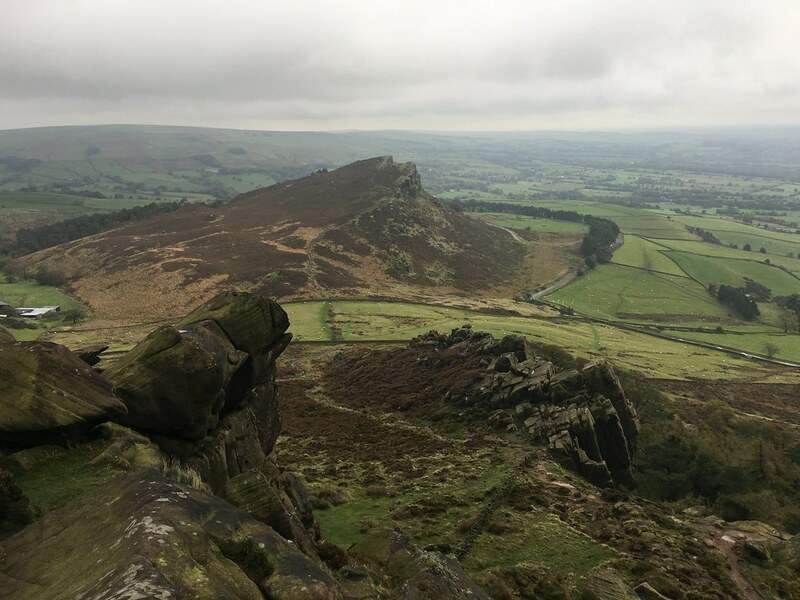 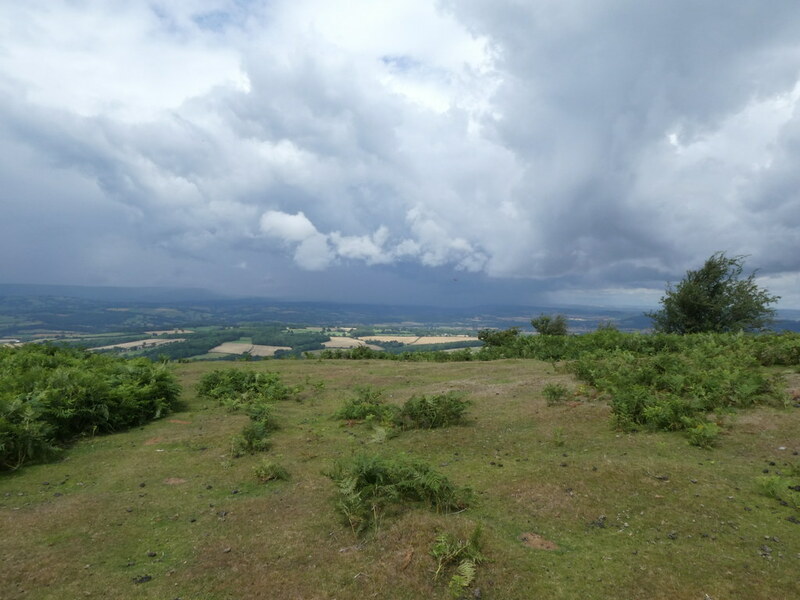 It’s only a short walk with no climbing but it was still hard work, not helped by the intermittent drizzle that kept falling. 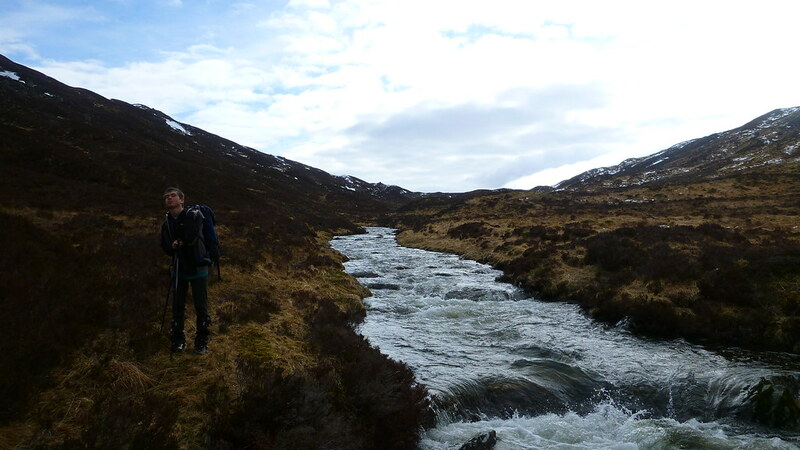 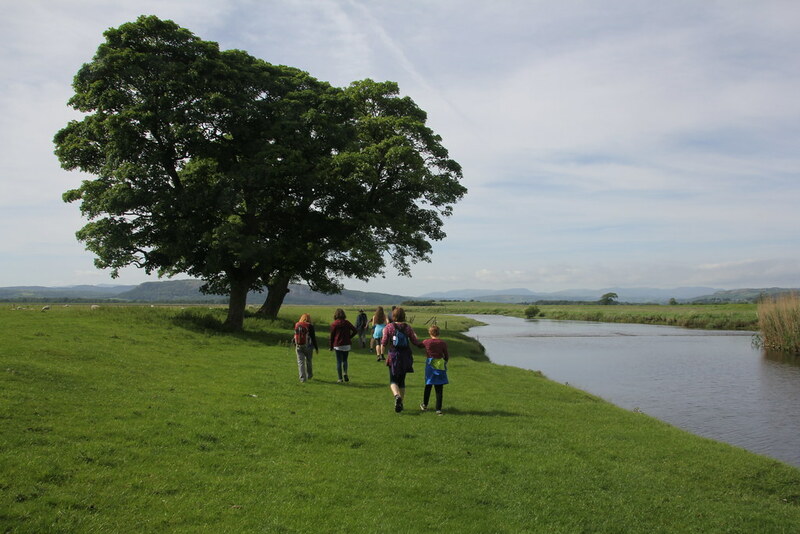 We decided on the path along the south side of the Abhainn Rath, a fairly mighty river. 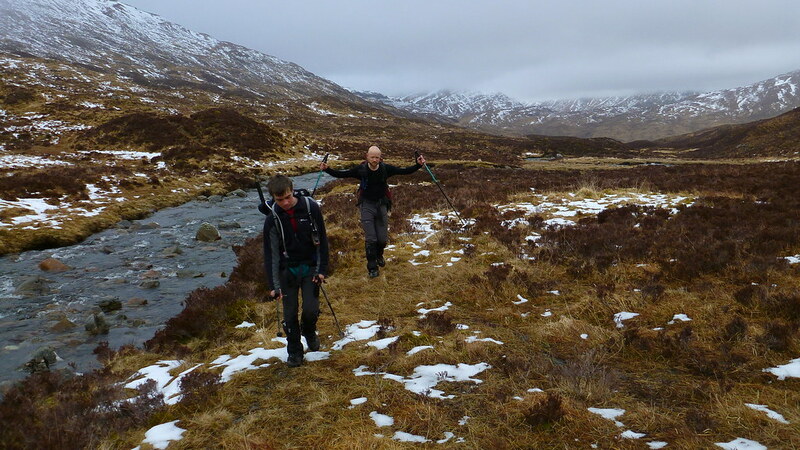 A somewhat sketchy and infuriating path but even on a grey day a fine stretch of Scottish valley. 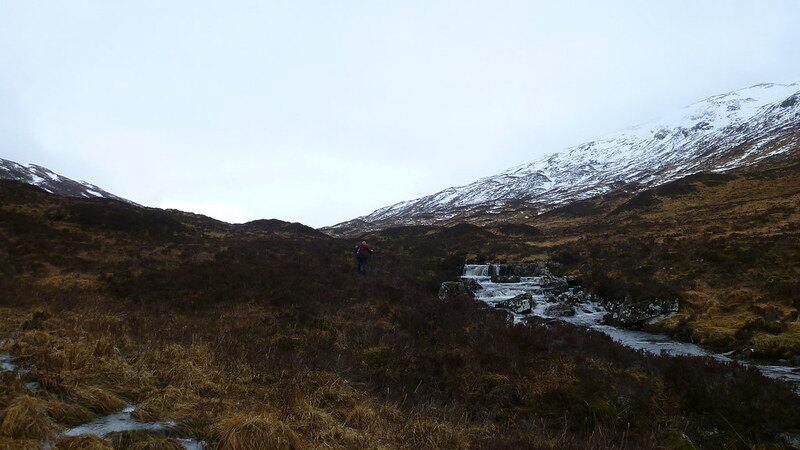 We passed by the deserted bothy, quite a fine one, but no-one was around and no-one had made an entry in the book for a couple of weeks. 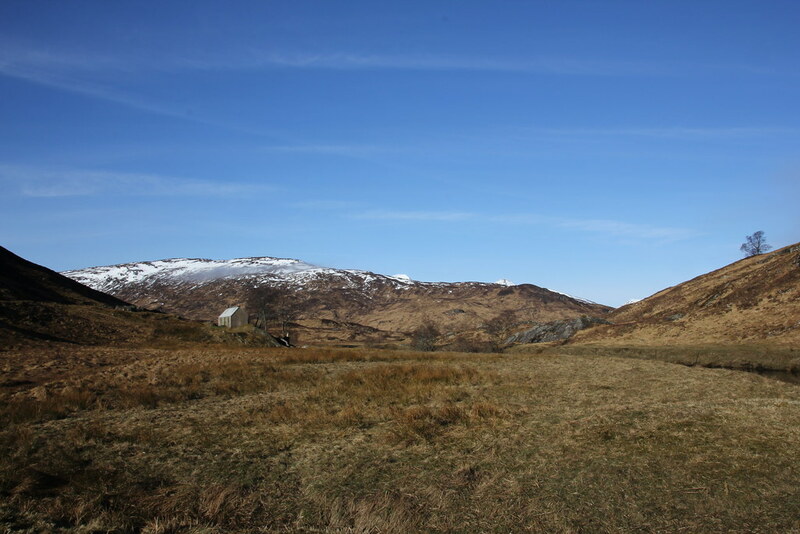 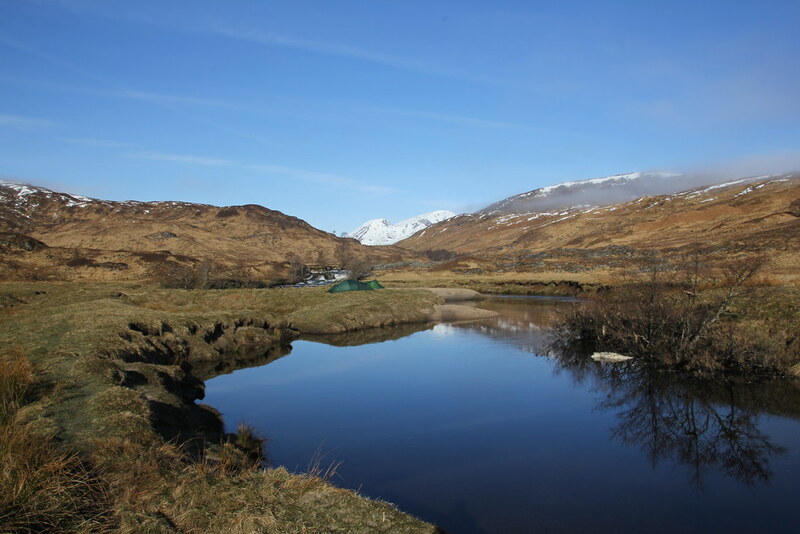 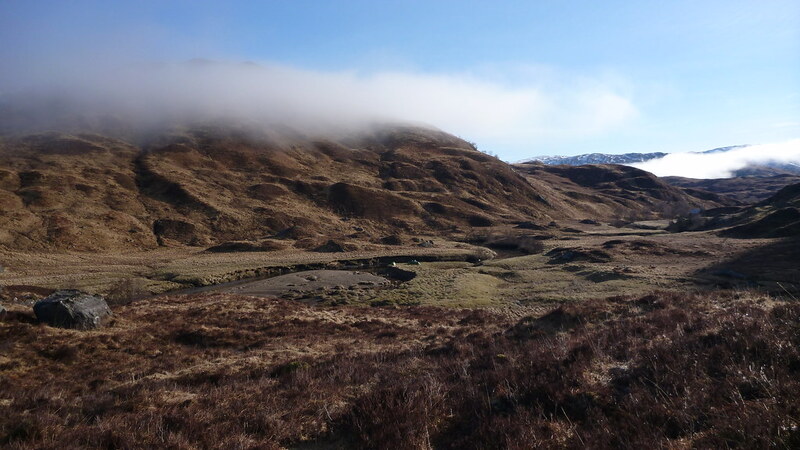 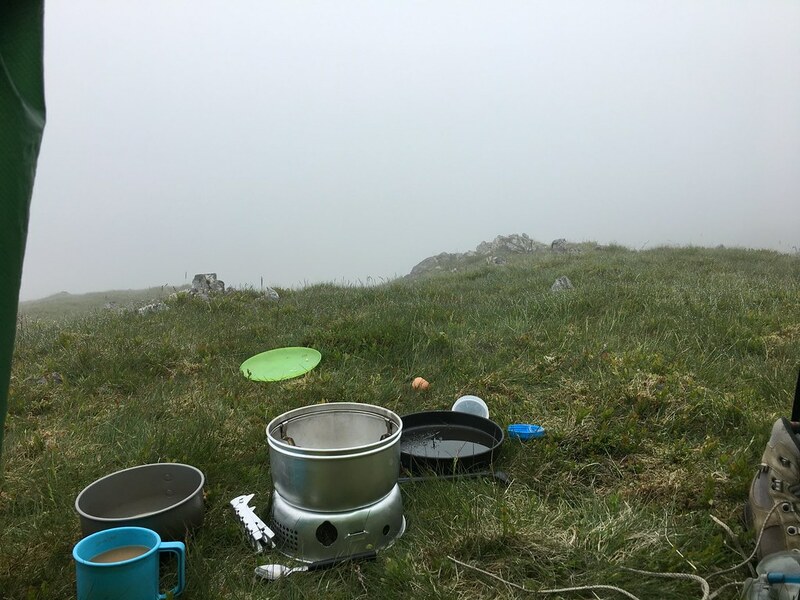 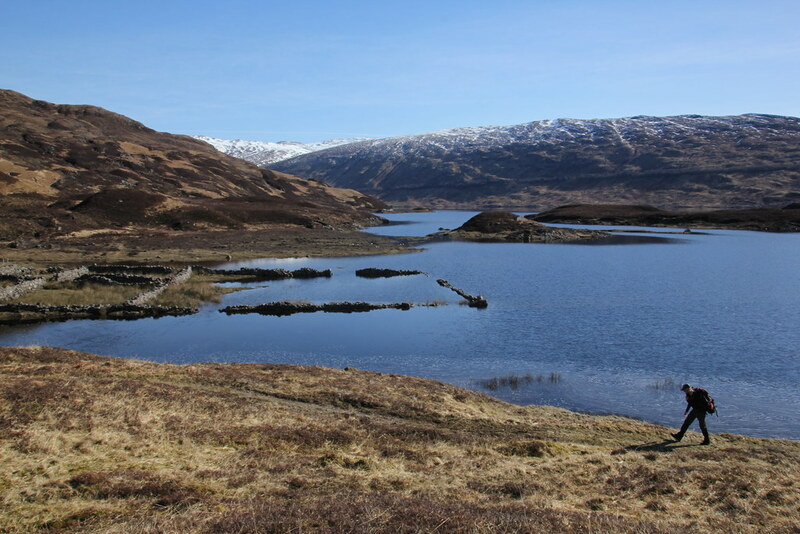 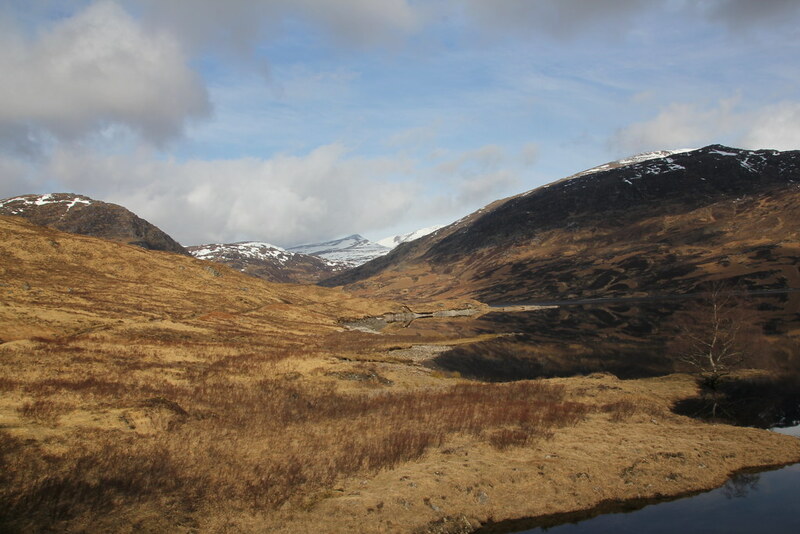 Despite its remoteness I was sure it was a well-known and popular bothy and was surprised that even on an Easter weekend we saw no-one this day or any other indulging in its charms. 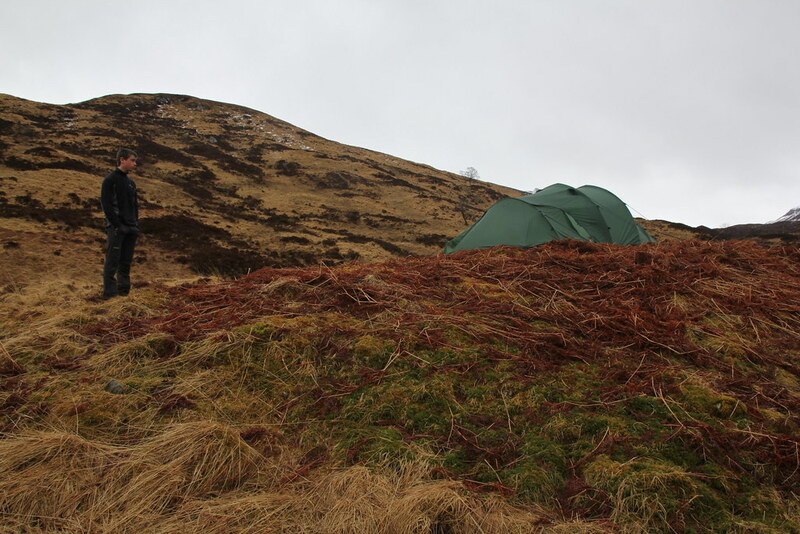 TJS was curious to see his first bothy up close and seemed to agree with me that they can appear rather gloomy and depressing. 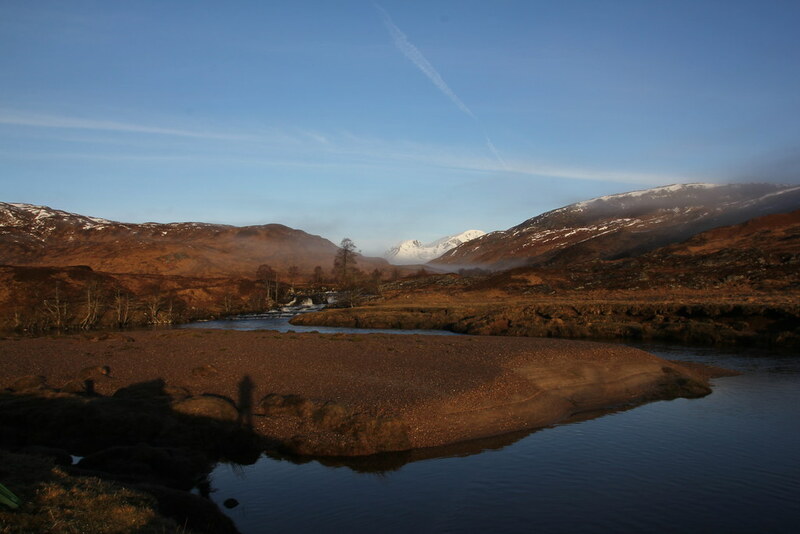 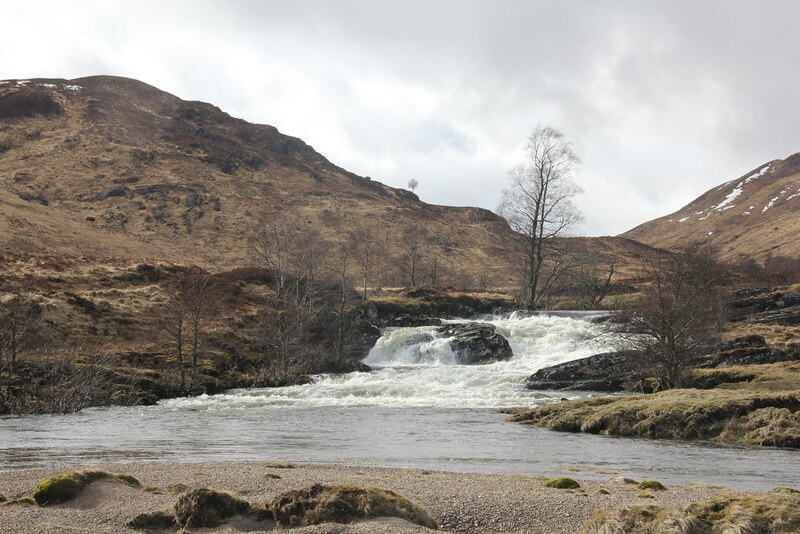 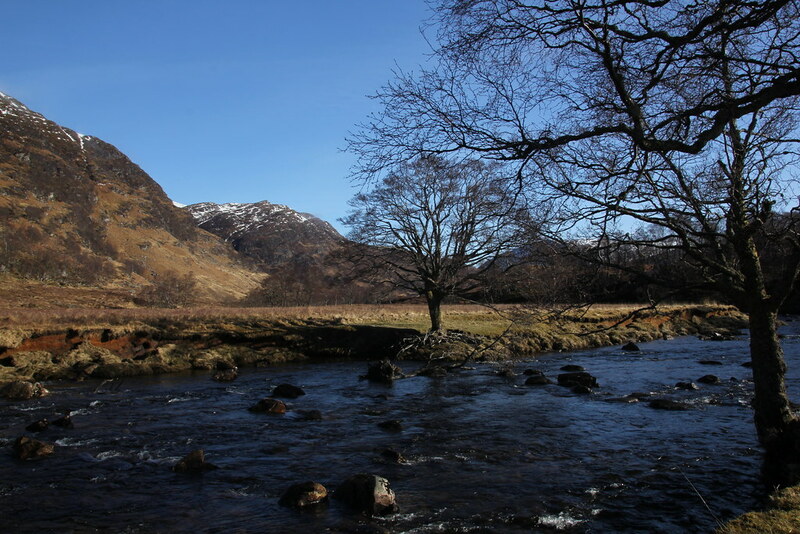 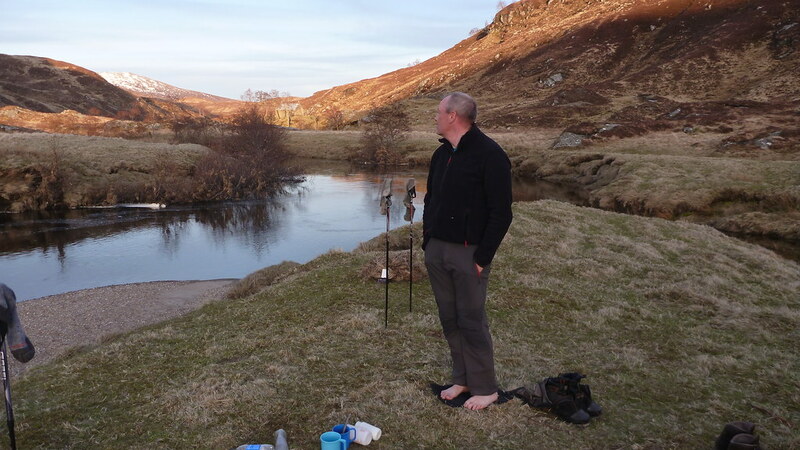 We had planned on walking a couple of km up-river from the bothy but a few hundred yards beyond seemed far enough and we found a rather splendid spot by the river. 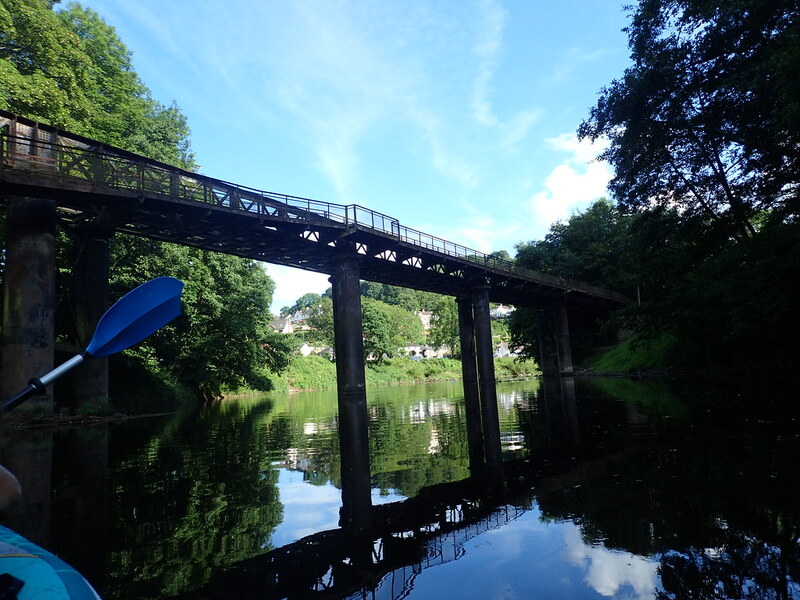 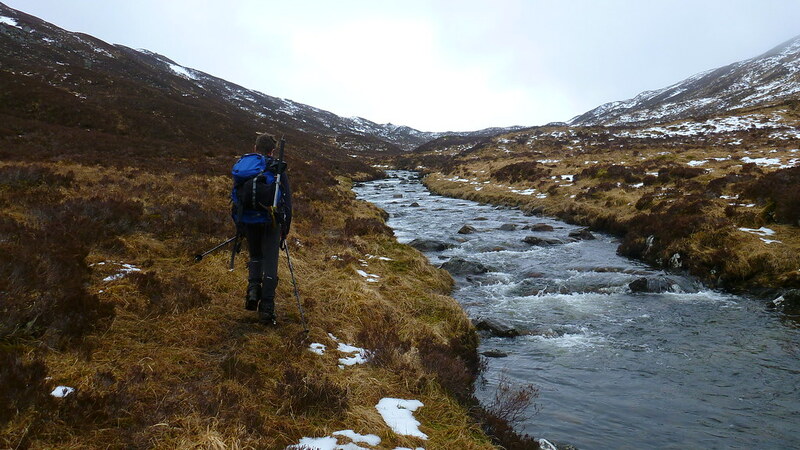 There are any number of cracking riverside spots along this stretch on both sides of the river but the one that allowed us to drop the packs at the earliest opportunity seemed the best one. 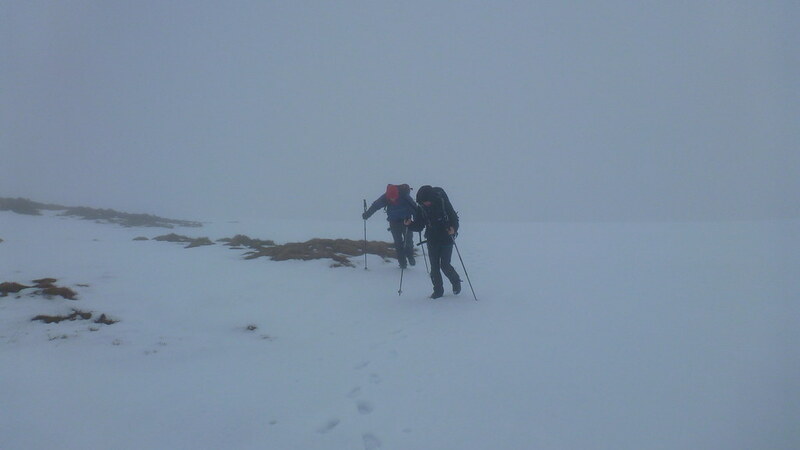 We’d only gone a few hundred meters when we hit our first problem. 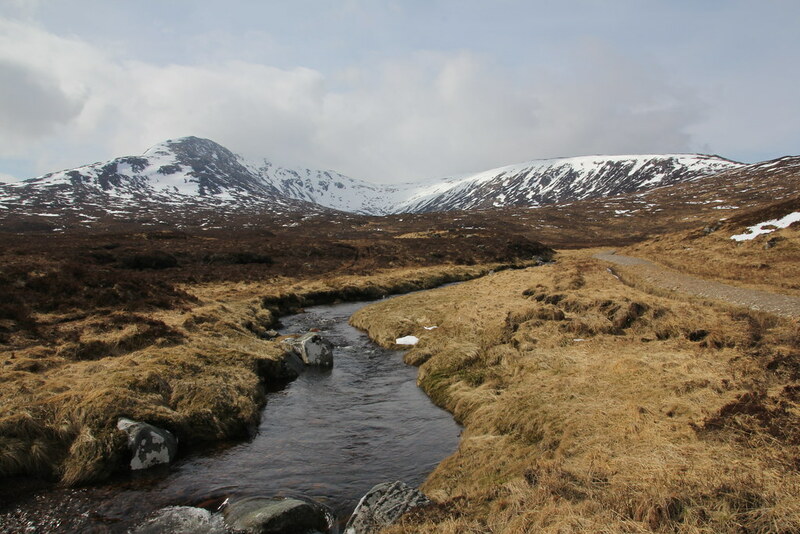 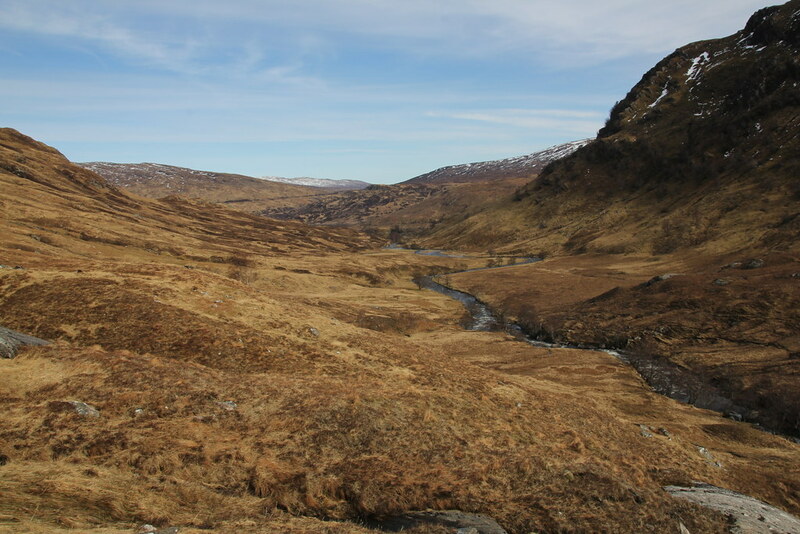 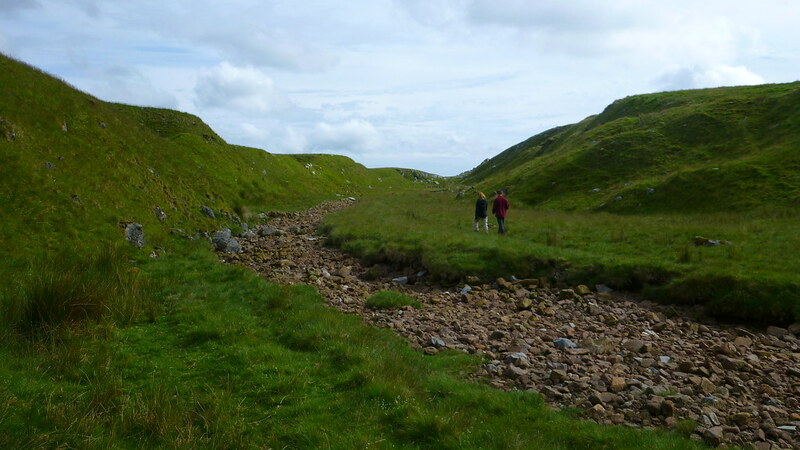 The Allt Gleann na Giubhsachan doesn’t look like much on the map but it was wide and deep enough to need a substantial wade which none of us fancied. 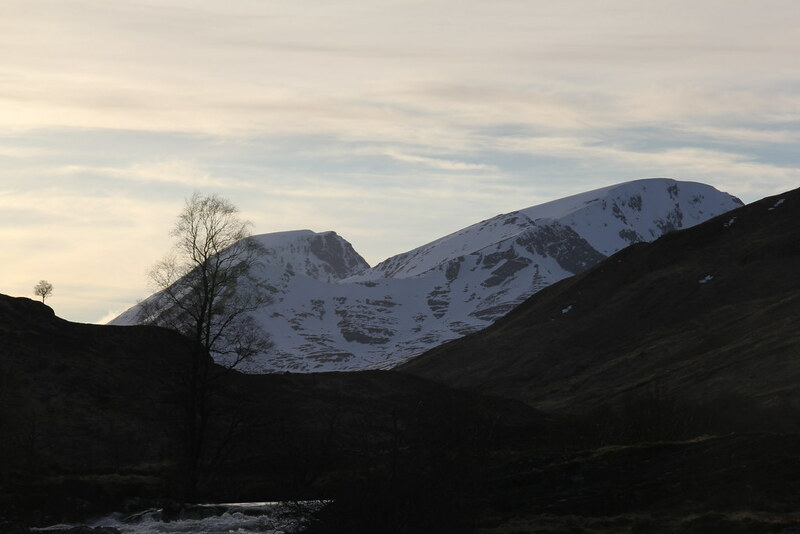 One look up at the hills that were white 2 days ago and now merely streaked white highlighted the blindingly obvious point that there was a thaw in progress and the rivers were full of snowmelt. 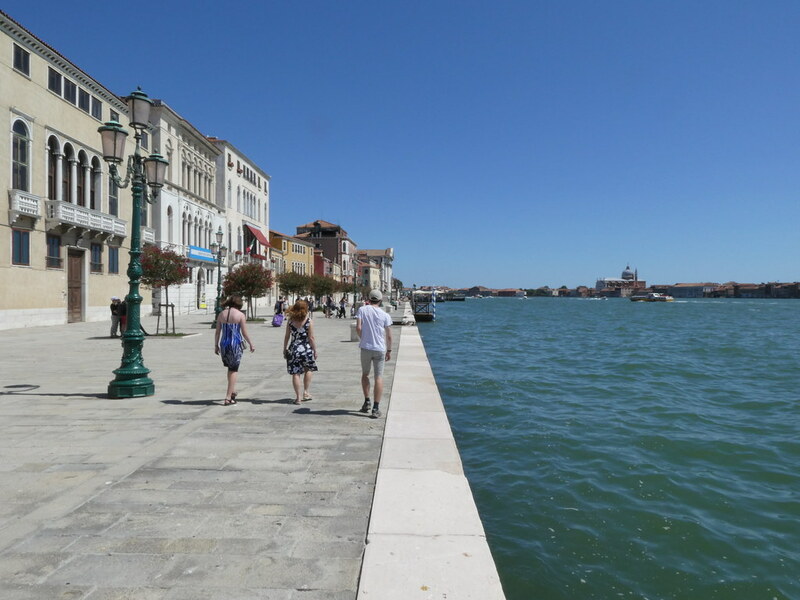 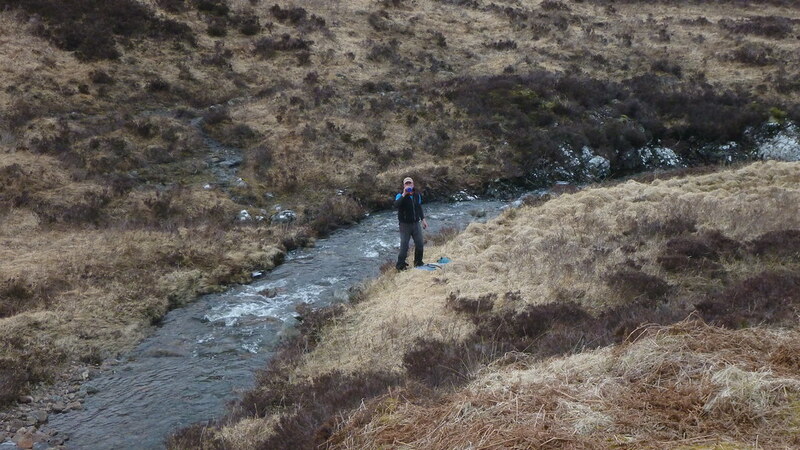 We wandered up the eastern bank looking for somewhere to cross but it became obvious we weren’t going to cross it. 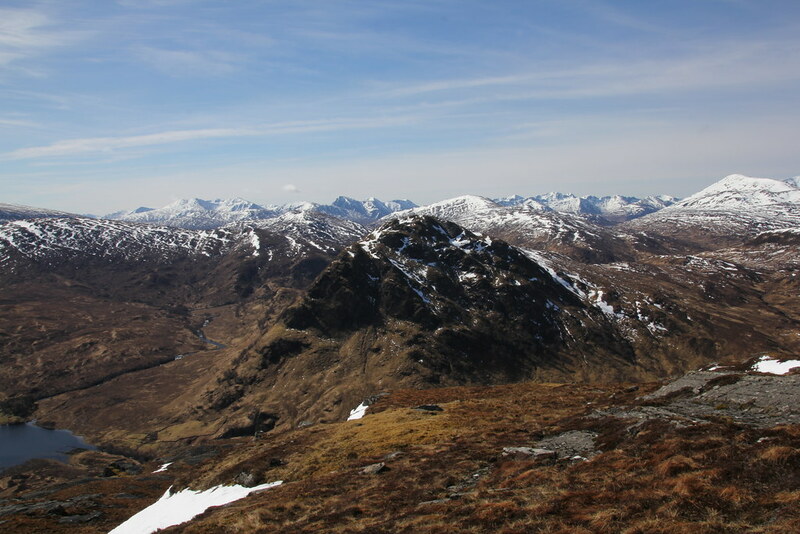 Luckily there was a Corbett within reach, the remote and lofty Glas Bheinn. 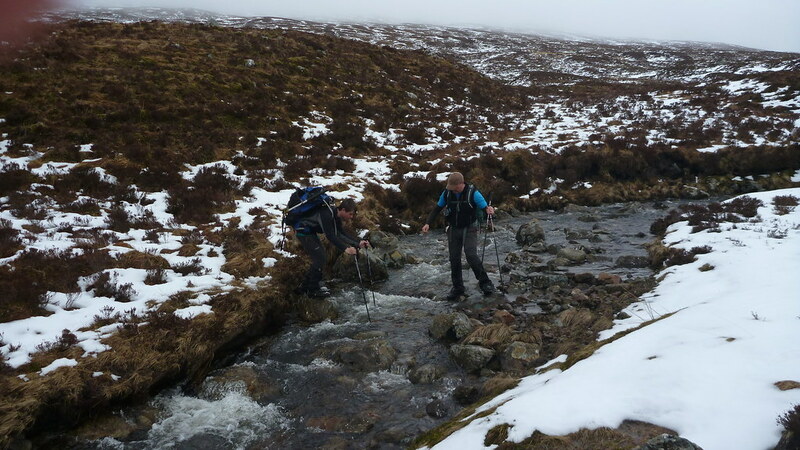 Even so we still had travel pretty much to the source of the river near the watershed before we could cross it, GM daringly, me and TJS a little more cautiously. 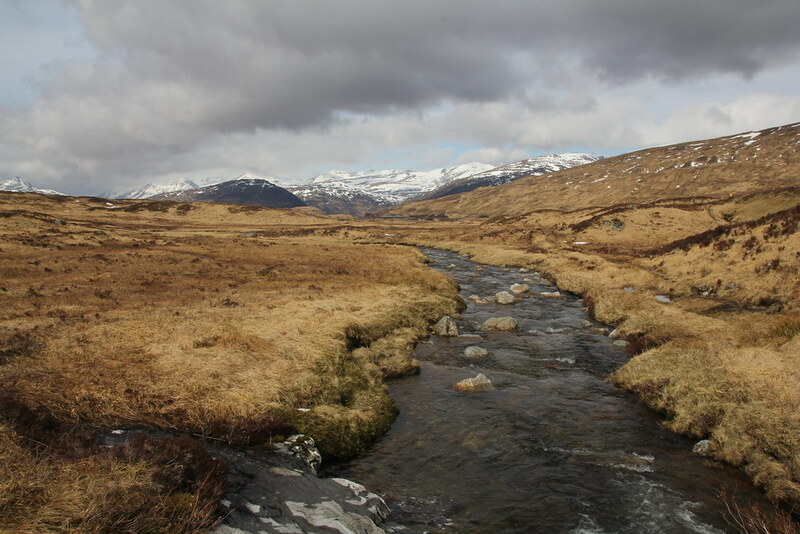 The higher corries appeared momentarily from the gloom giving a glimmer of hope for better weather and the river valley was wild, remote and rather splendid. 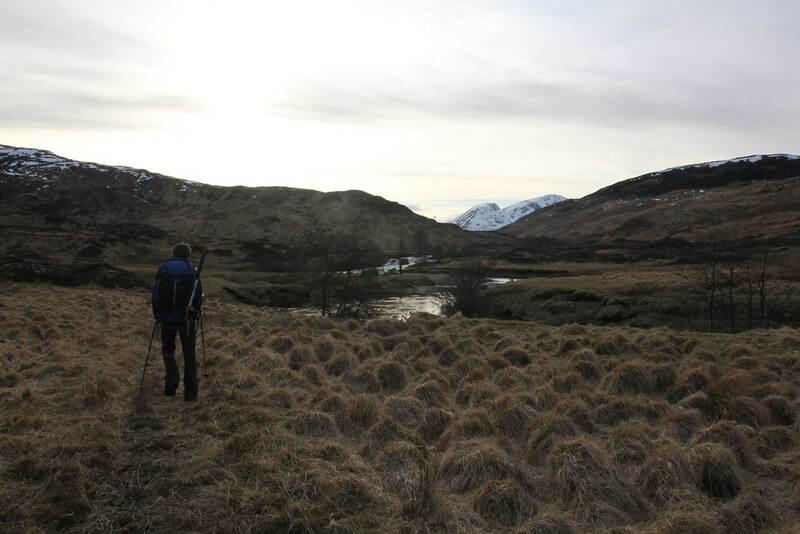 Sometimes you can extract enjoyment just exploring a valley the probably sees almost no human traffic. 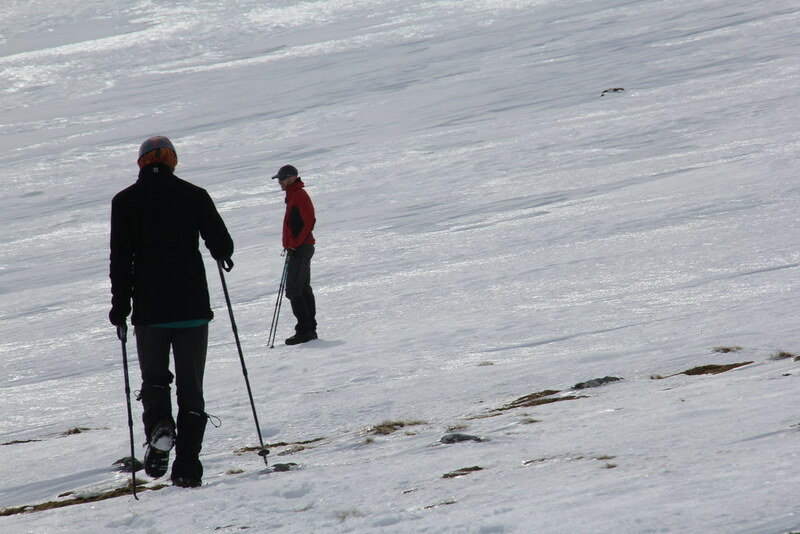 After a brief lunch we made a direct line up the slopes to the summit ridge and then pressed on to the top. 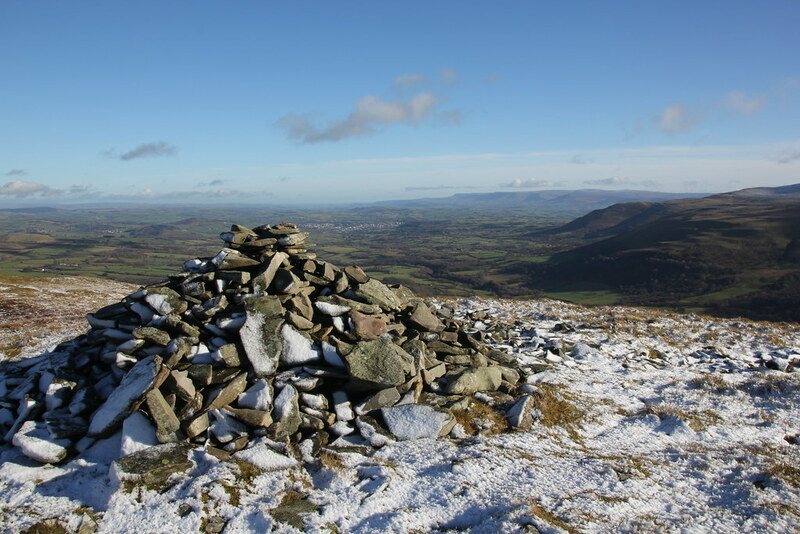 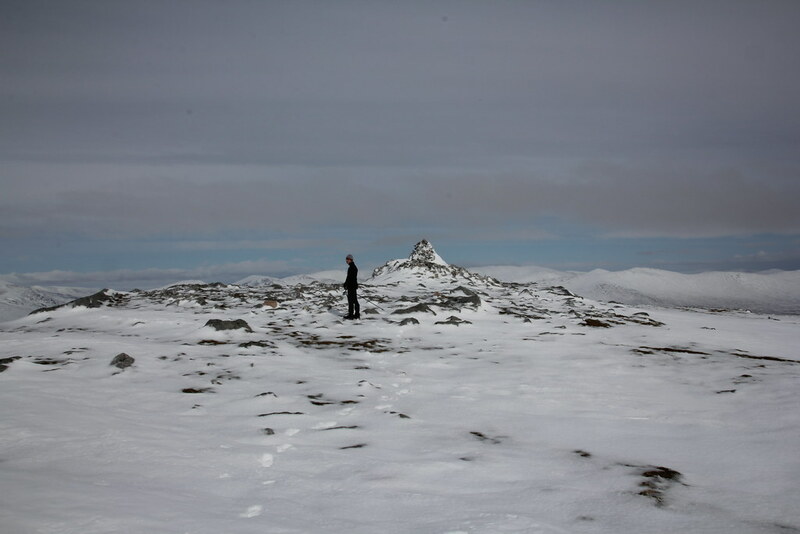 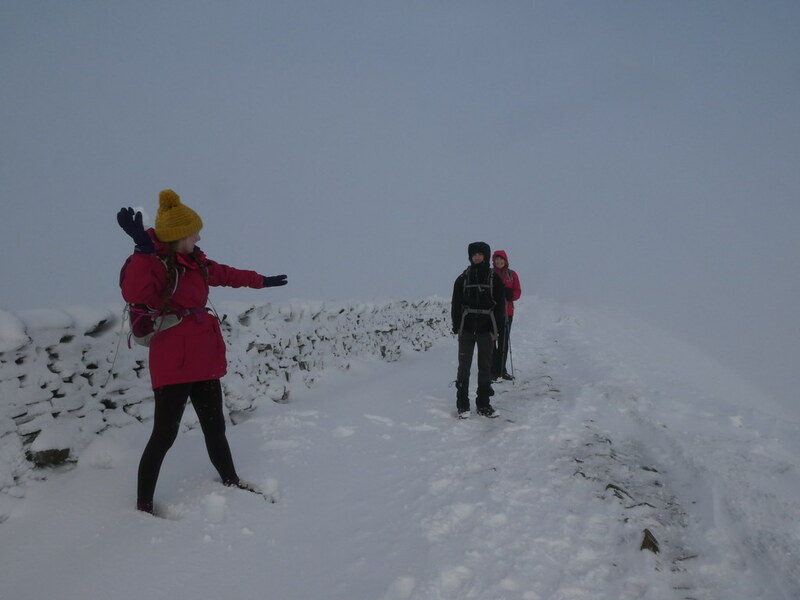 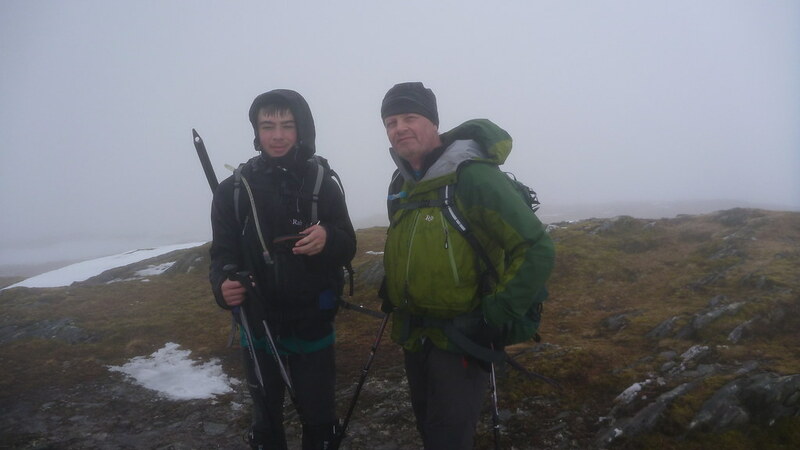 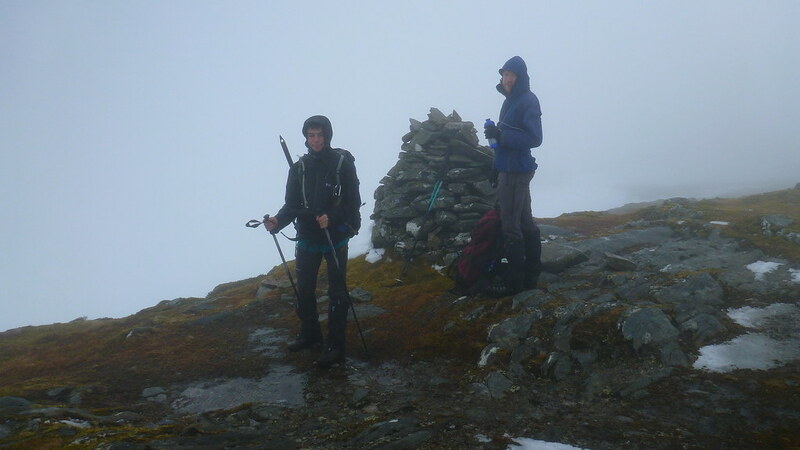 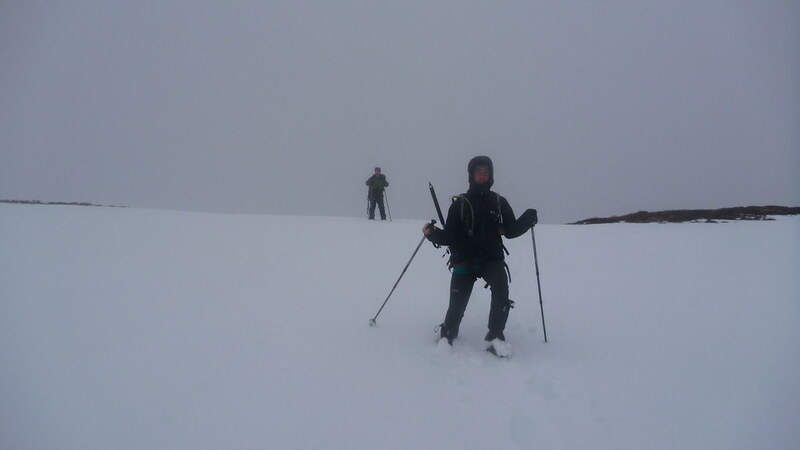 It was cold, damp and cloudy up there and the snow was deep, wet and tiresome. 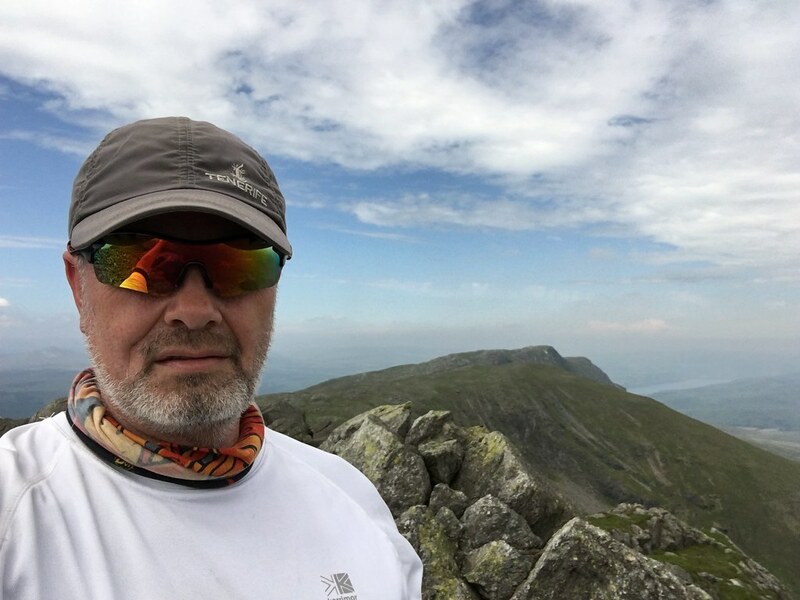 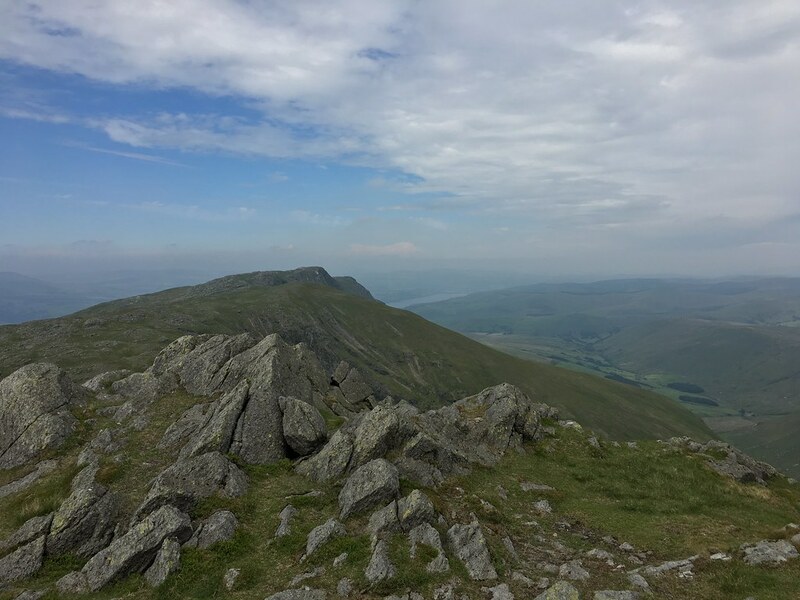 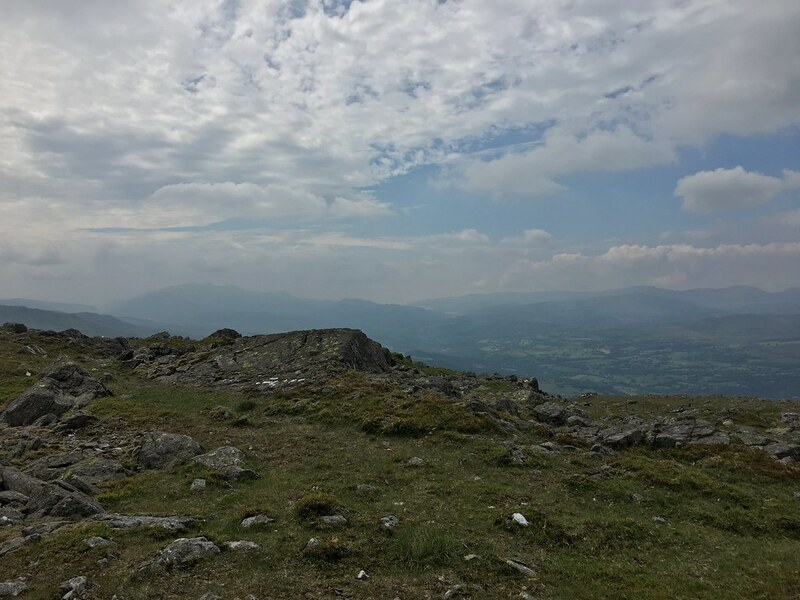 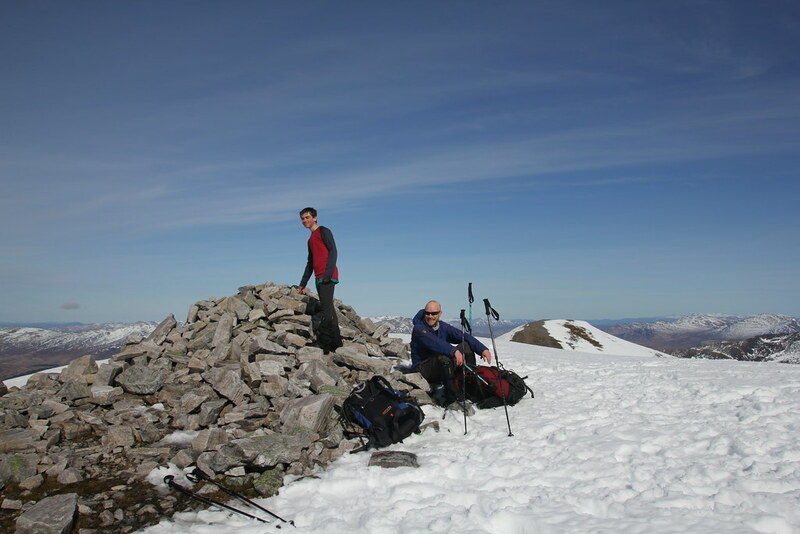 We lingered no more than a minute on the summit before heading straight back down, pleased to have made a decent summit on such a day. 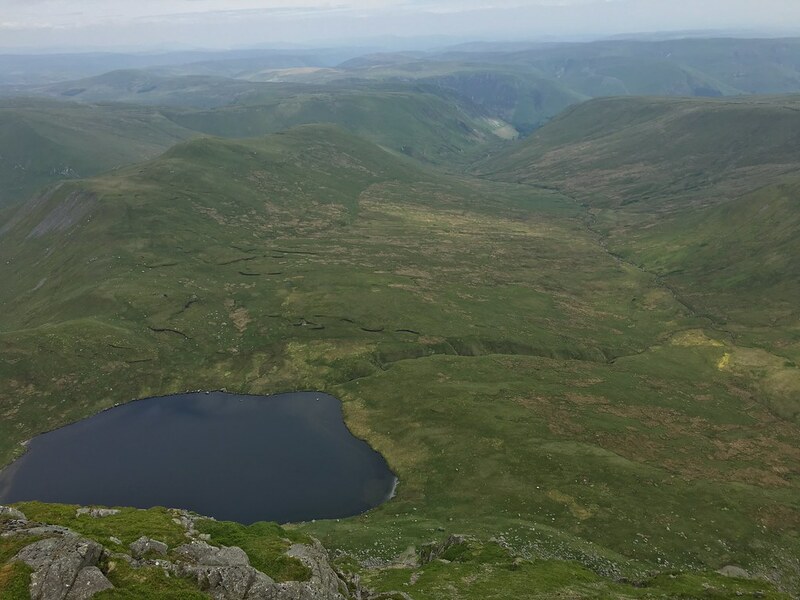 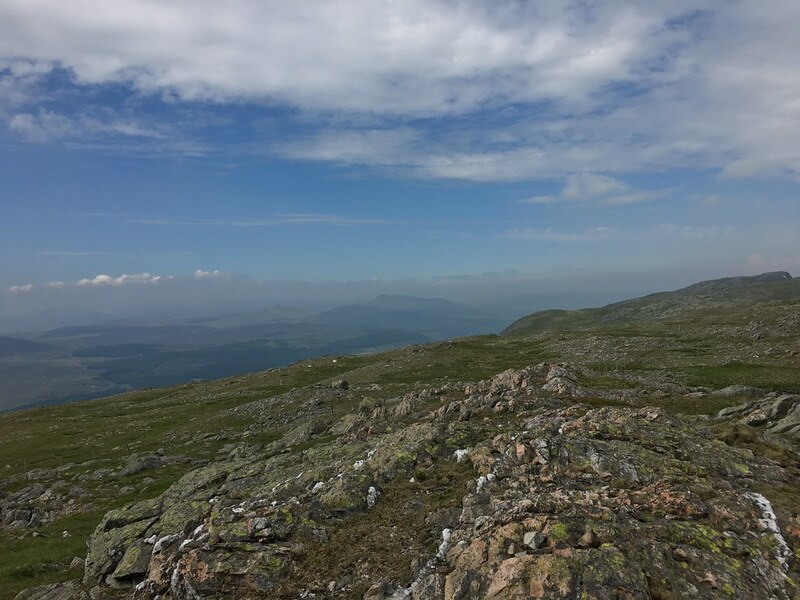 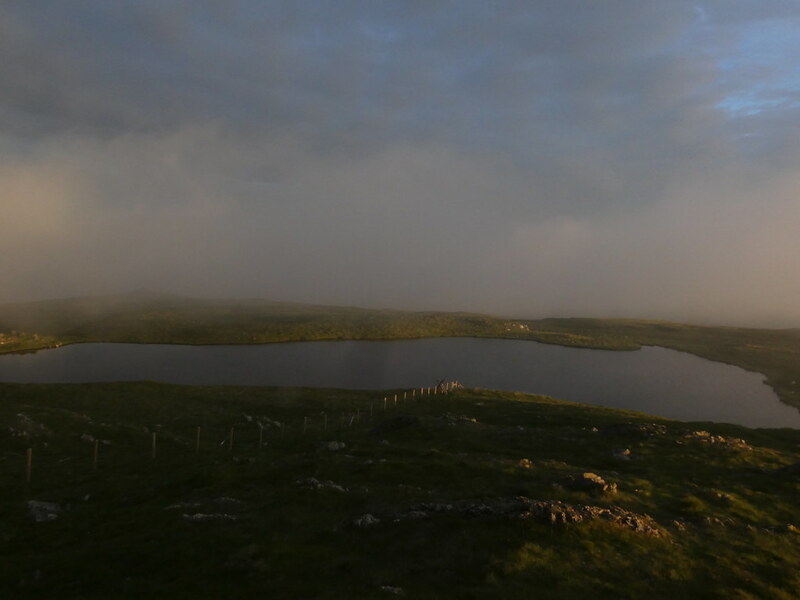 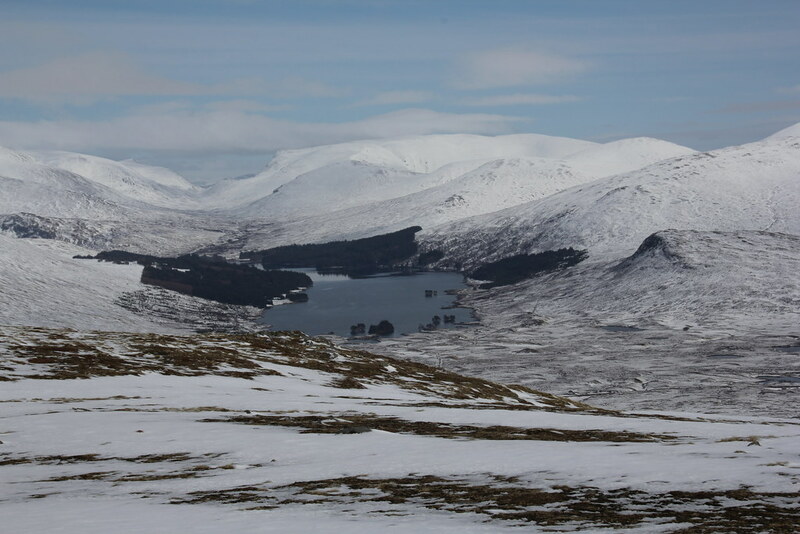 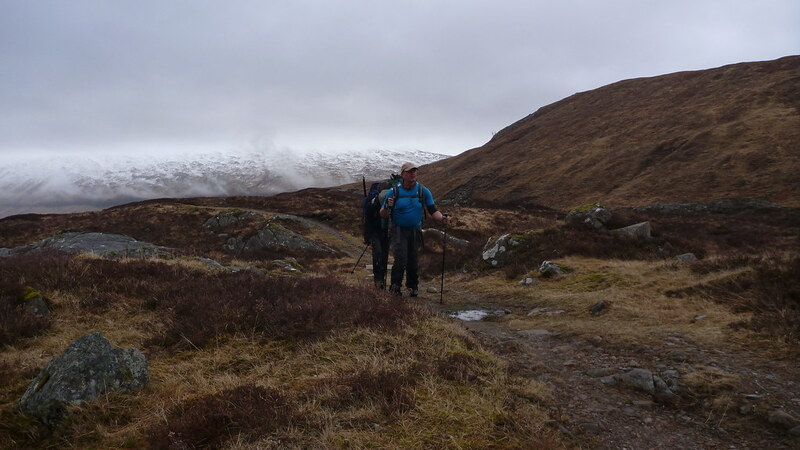 As we returned to our point of ascent the cloud started to break and we got some tantalising glimpses of mountains and the wild remote moors and lakes of Rannoch Moor and Blackwater Reservoir. 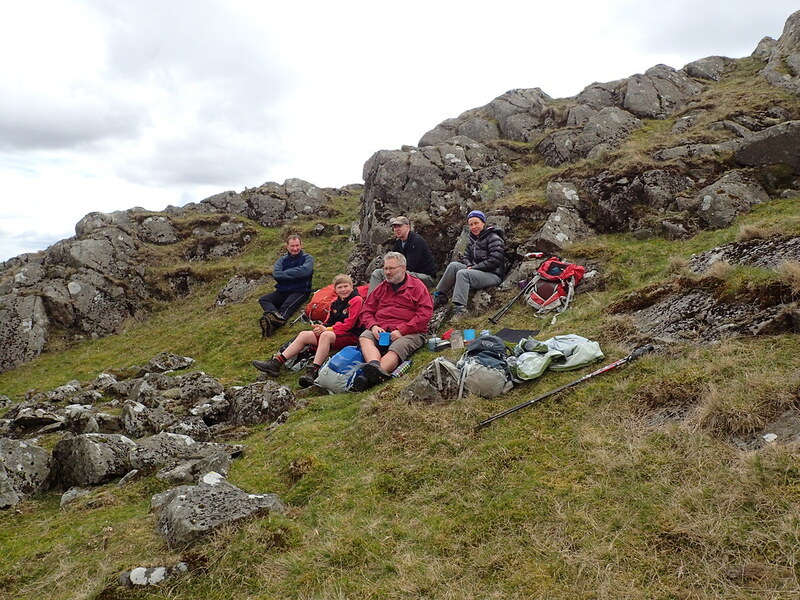 There was even some sunshine and the air seemed to dry out while we watched. 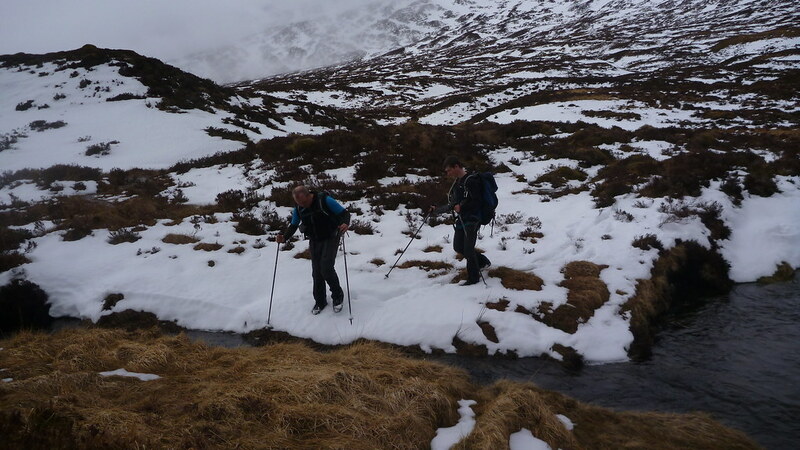 The snow was even worse on the descent and snow melt was filling every gully with water. 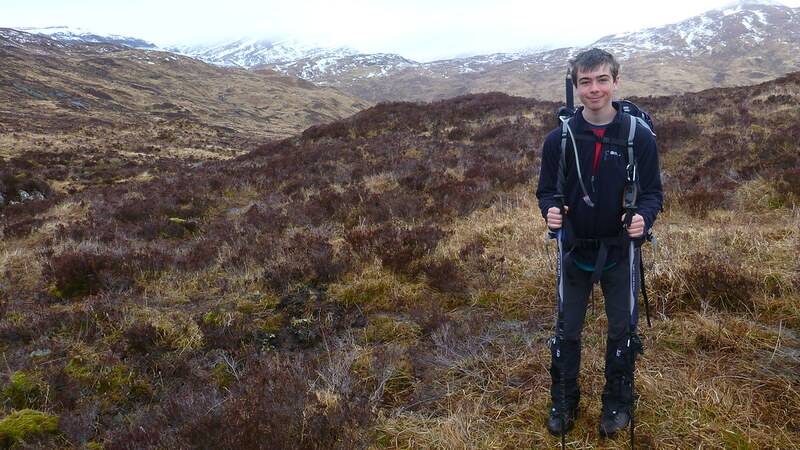 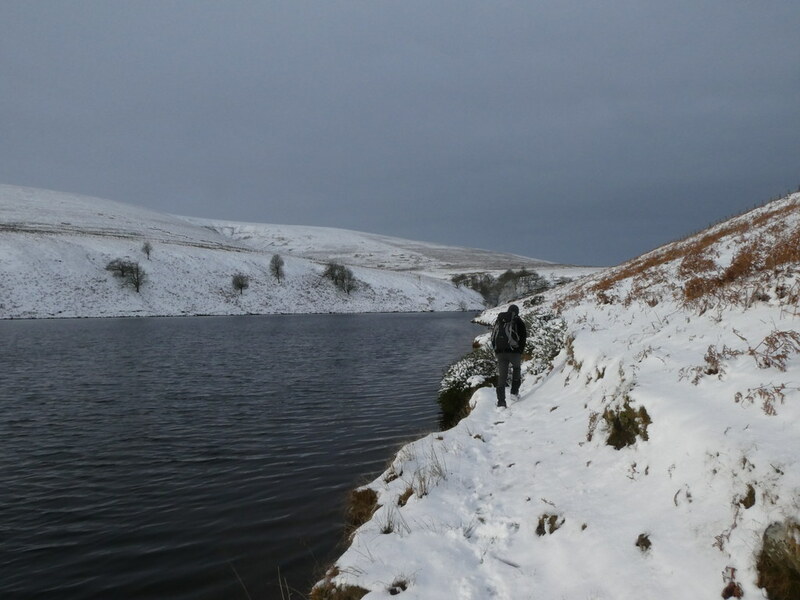 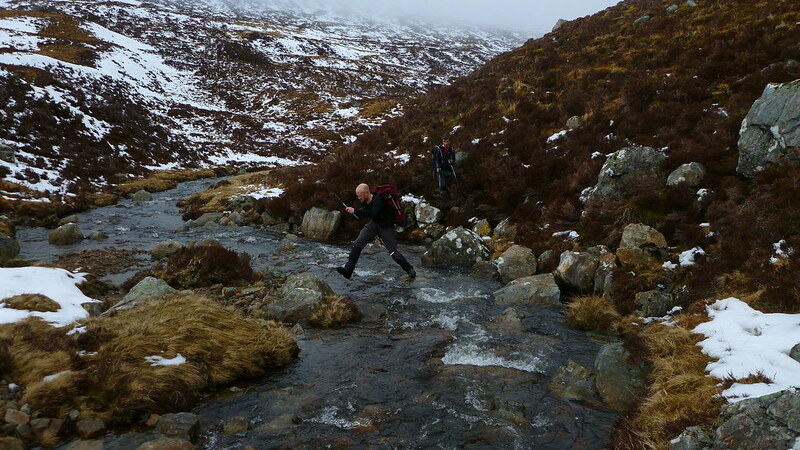 TJS was getting his first experience of truly wet feet, anything he’d experienced before but a mere damp rag compared to the proper slosh of a boot exposed to Scottish bog and melting snow. 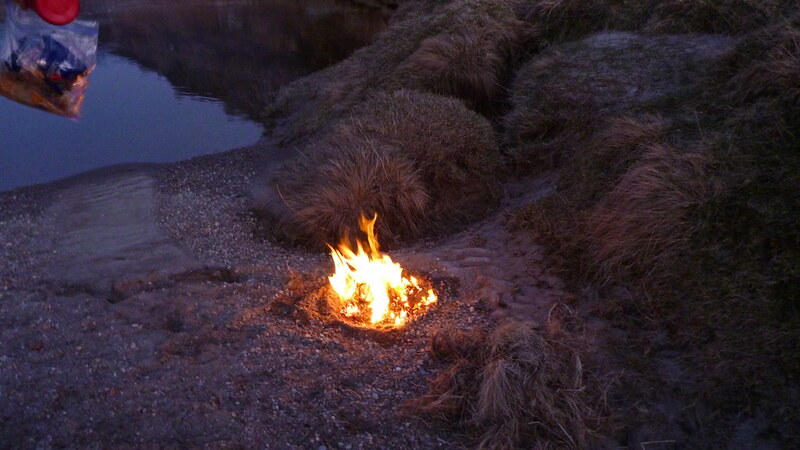 It had been a pretty good day. 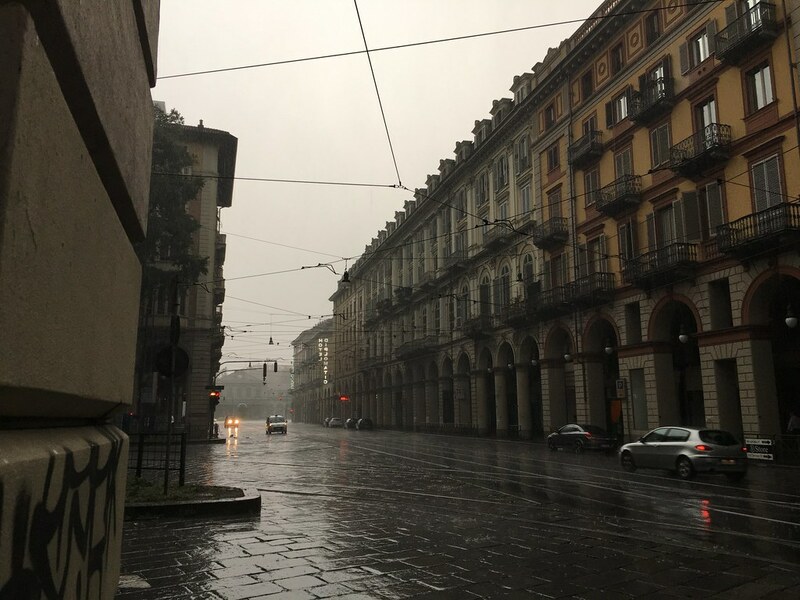 Now here’s a first. 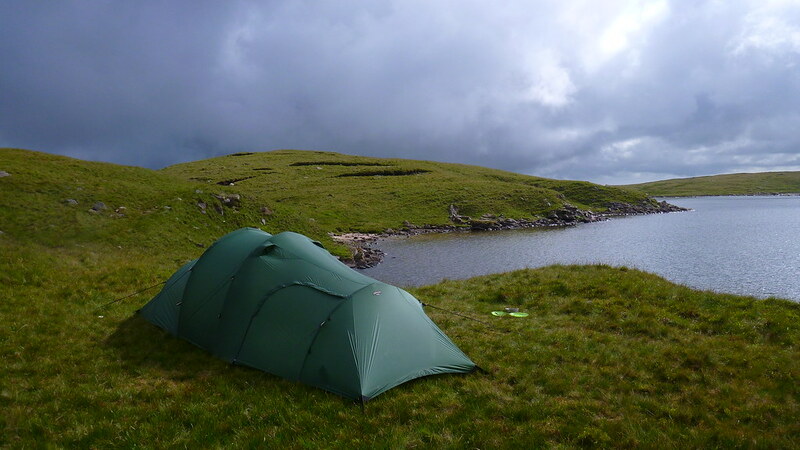 Writing up a trip within a few days of completing it! 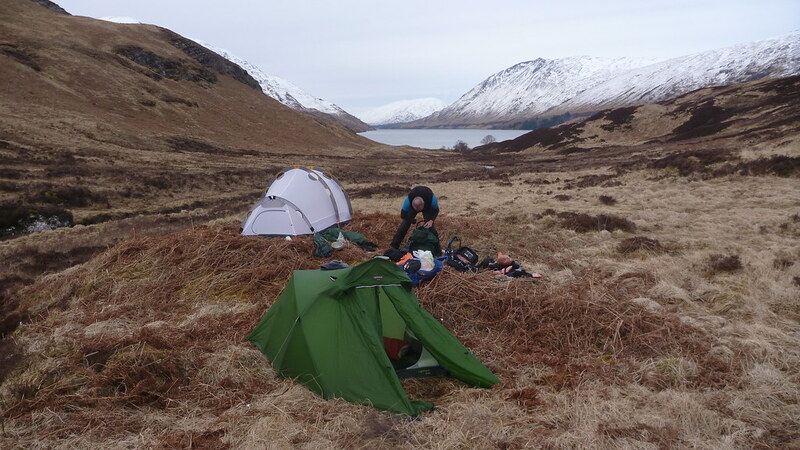 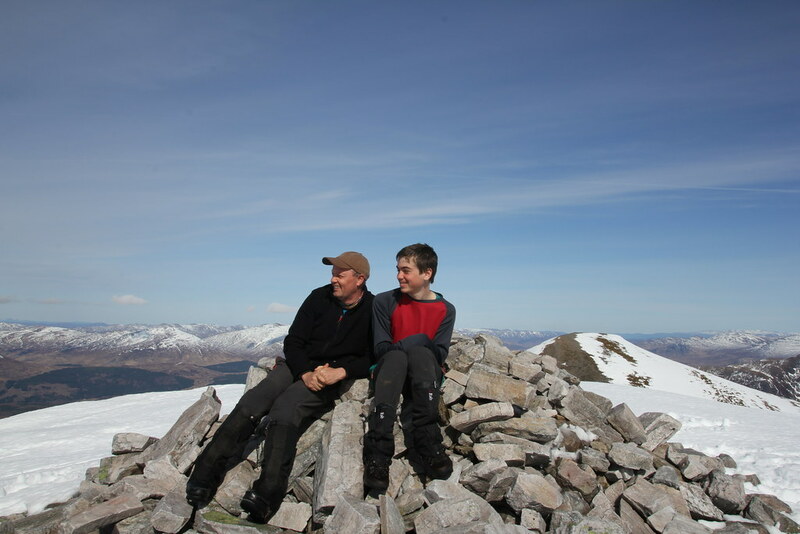 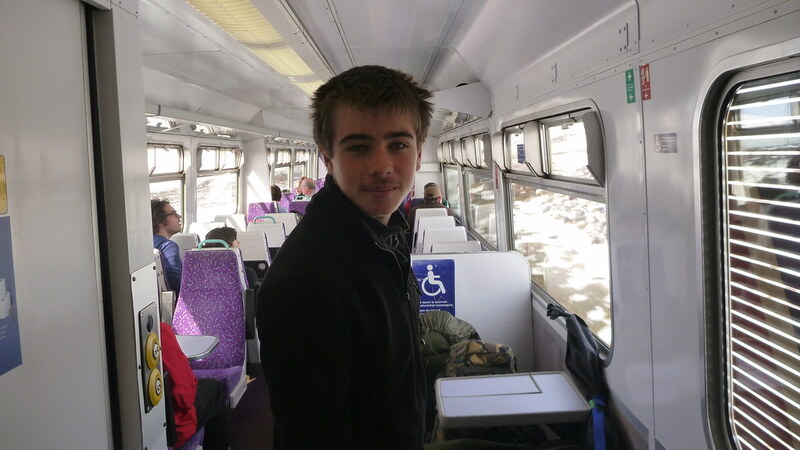 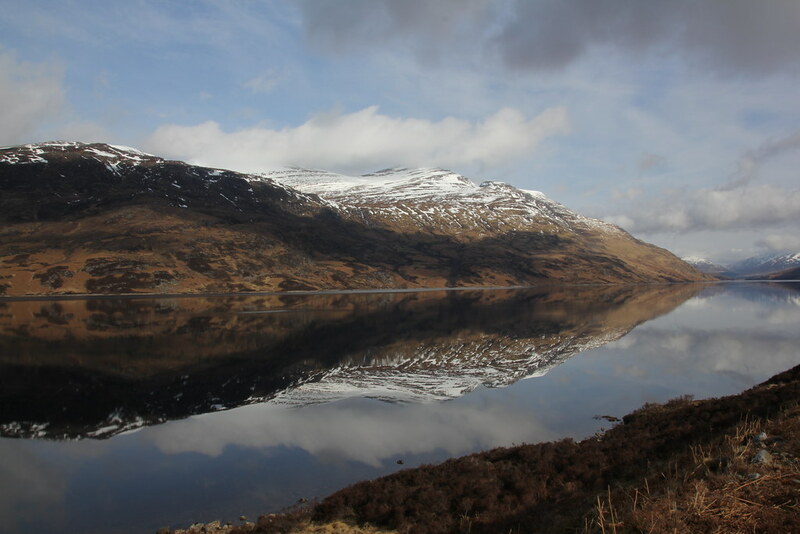 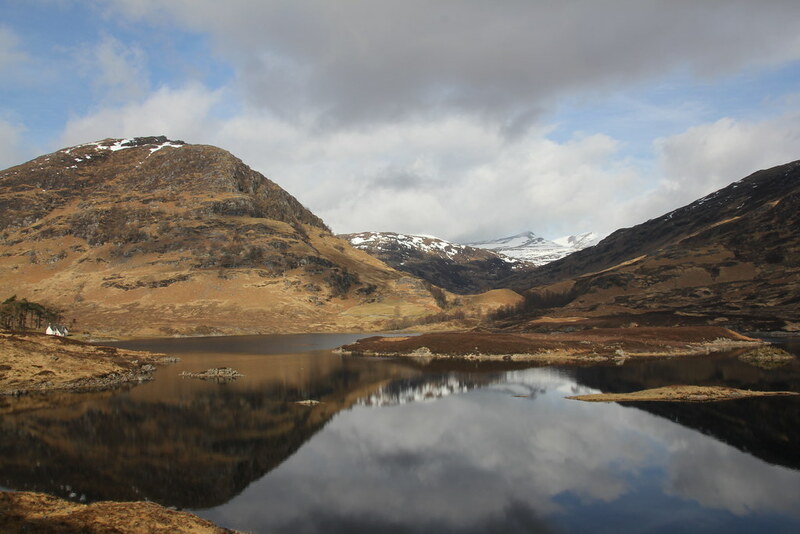 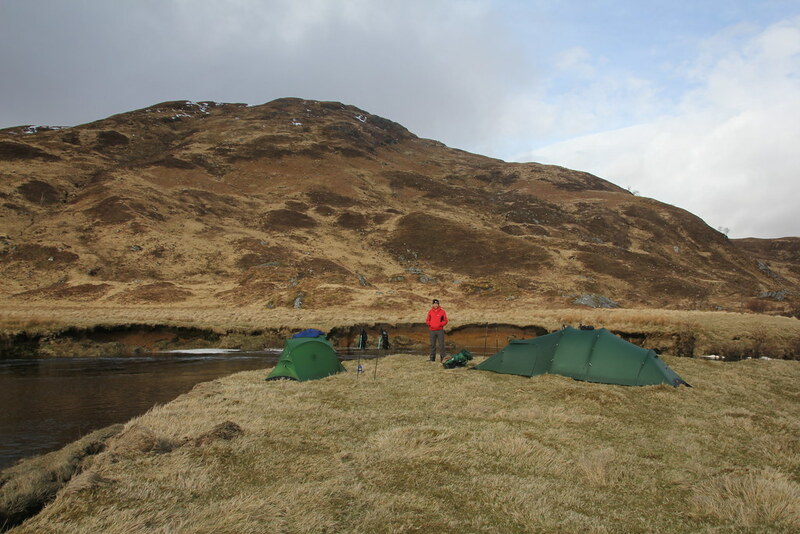 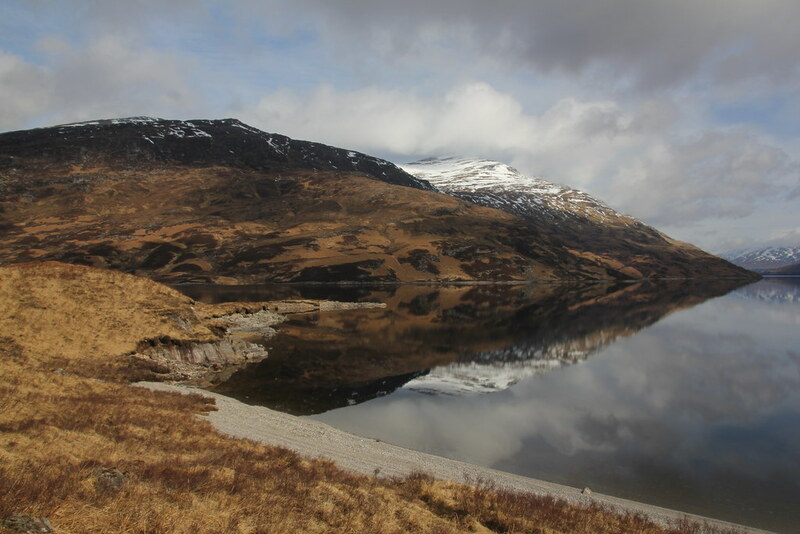 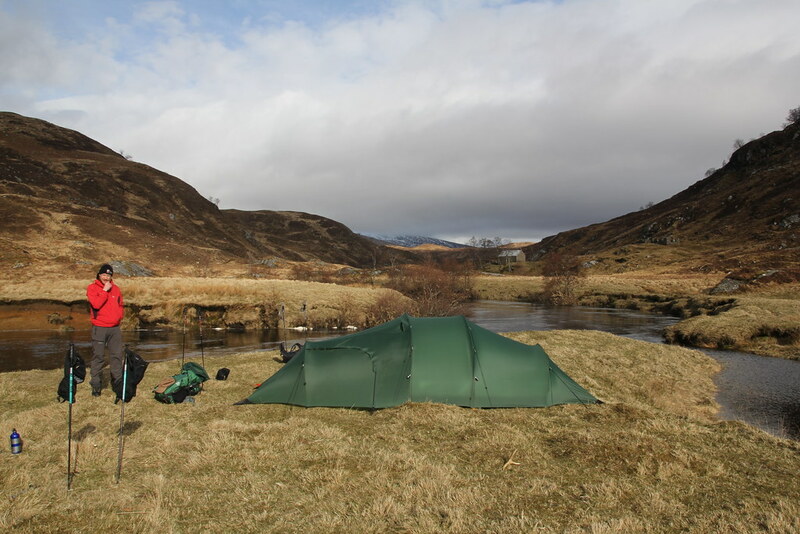 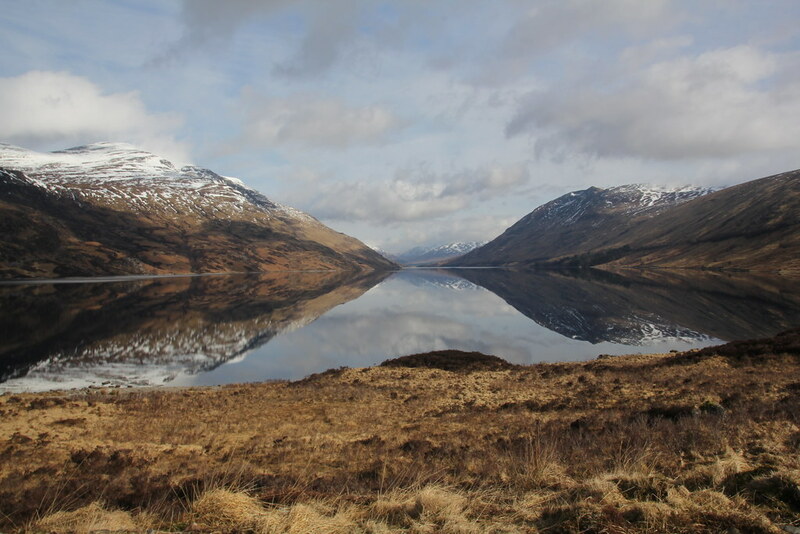 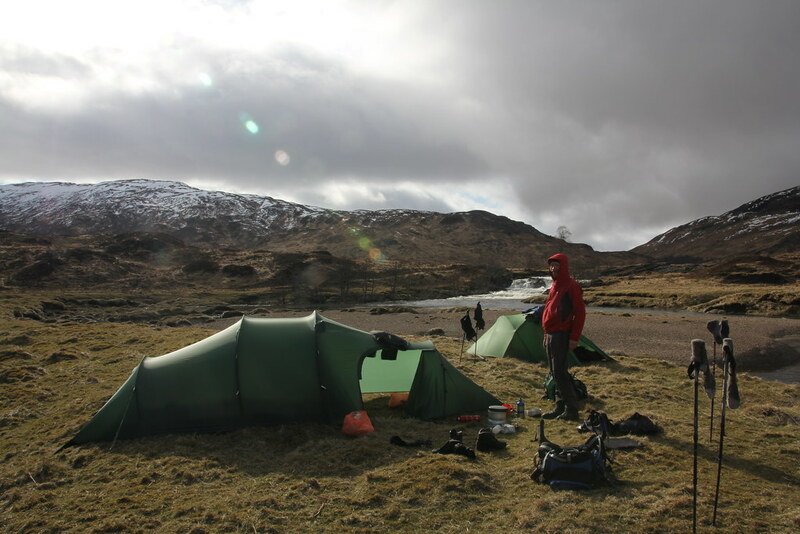 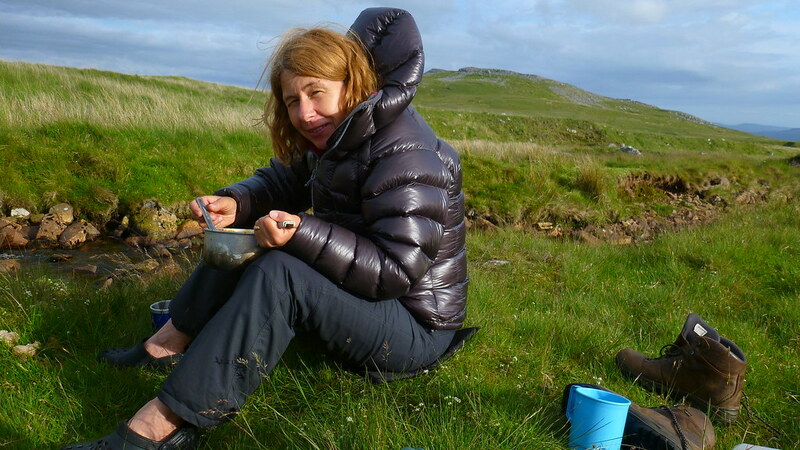 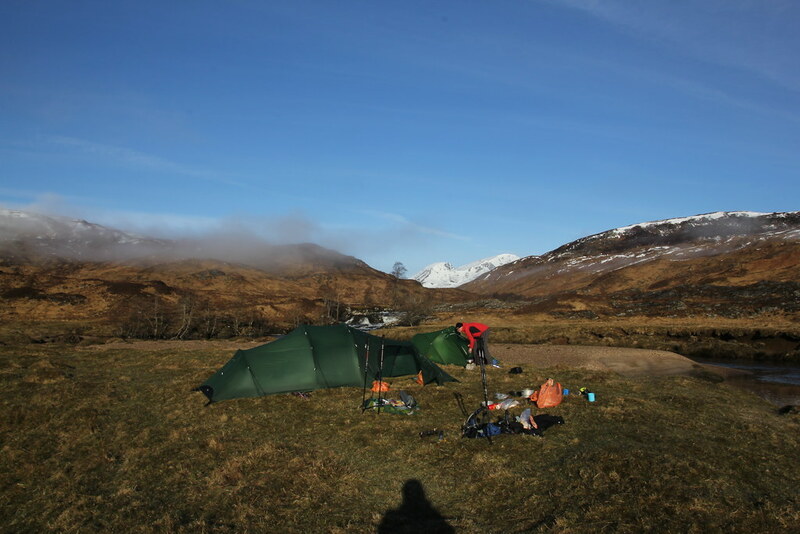 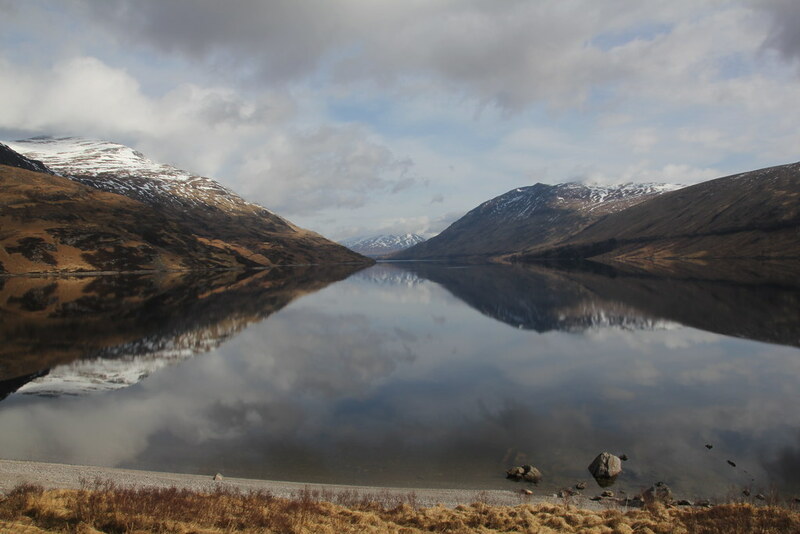 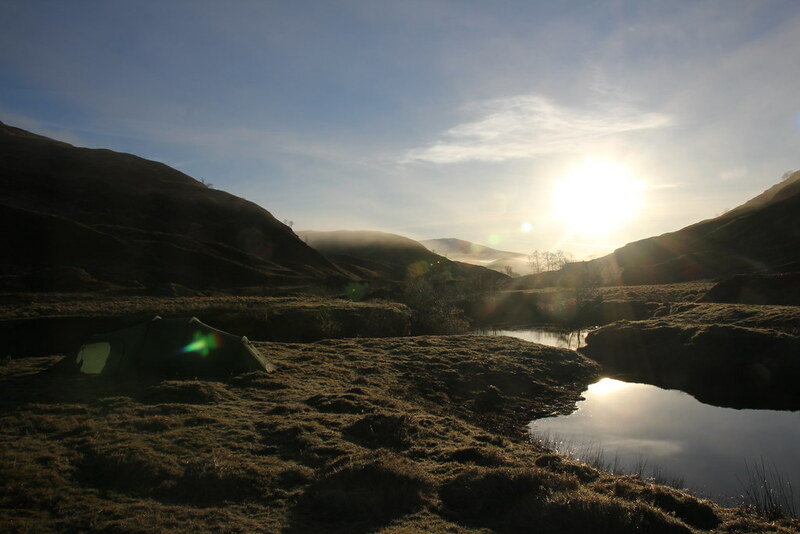 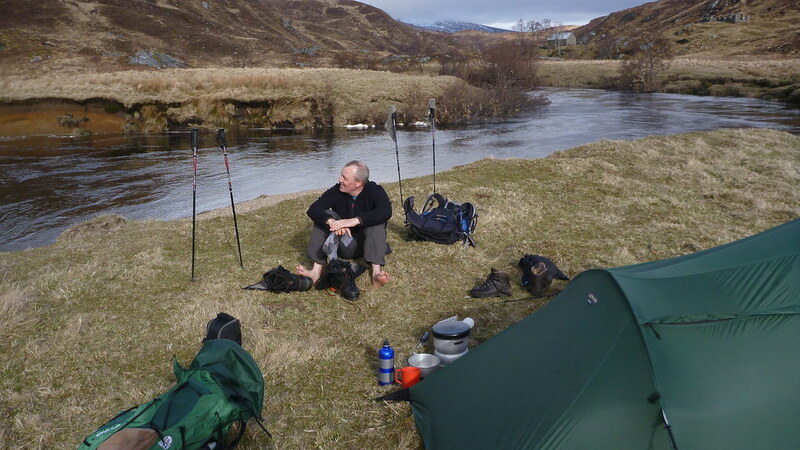 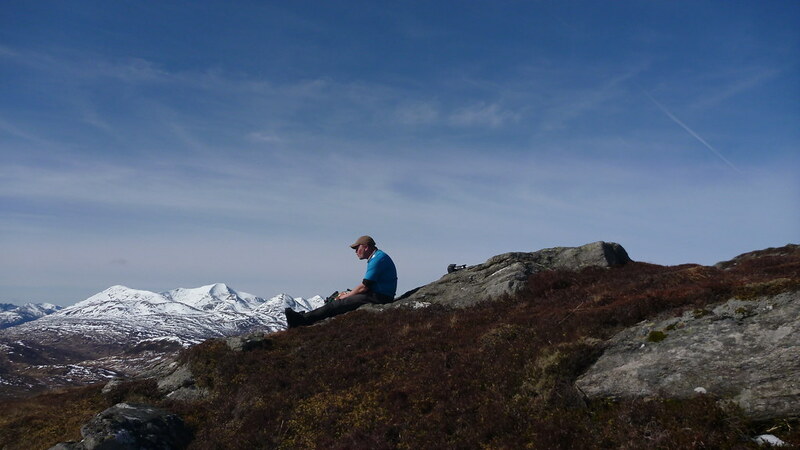 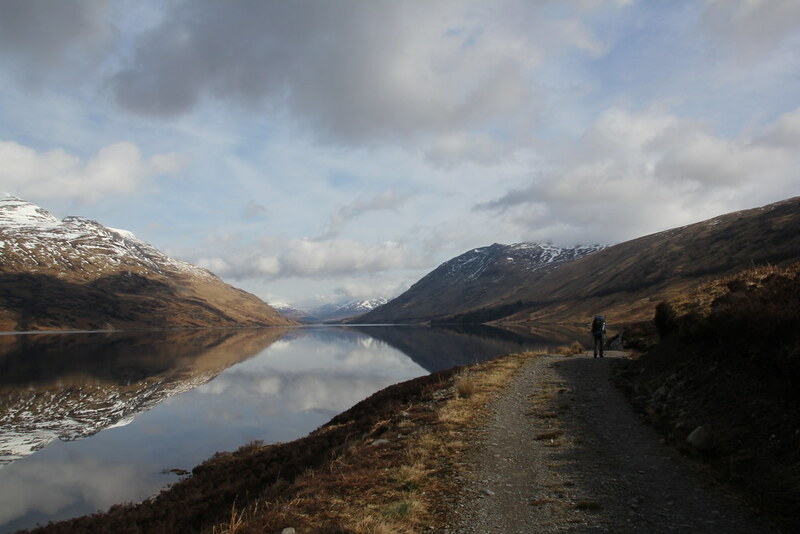 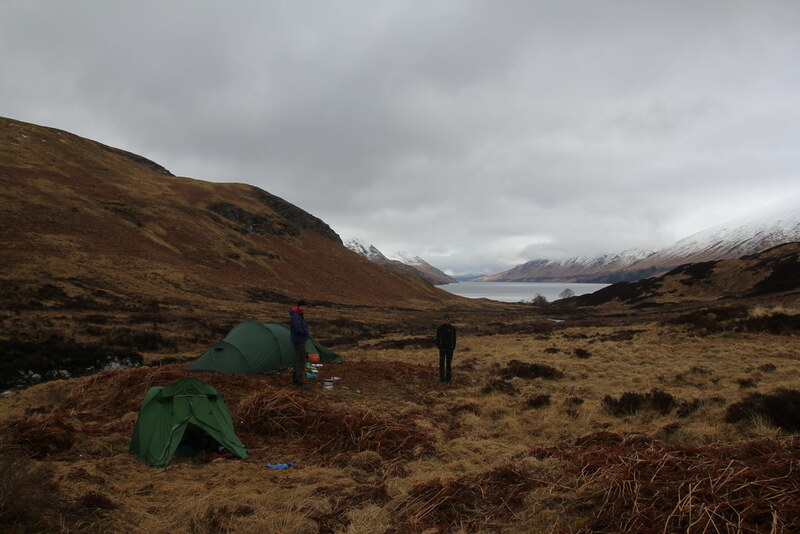 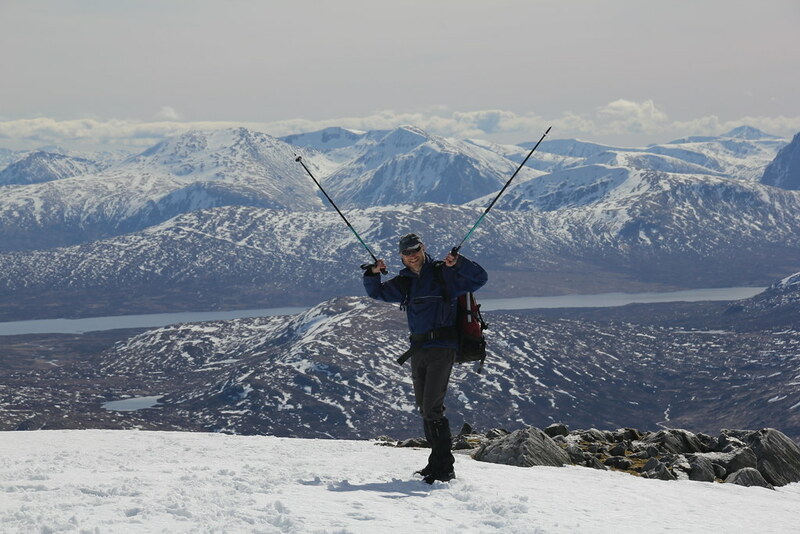 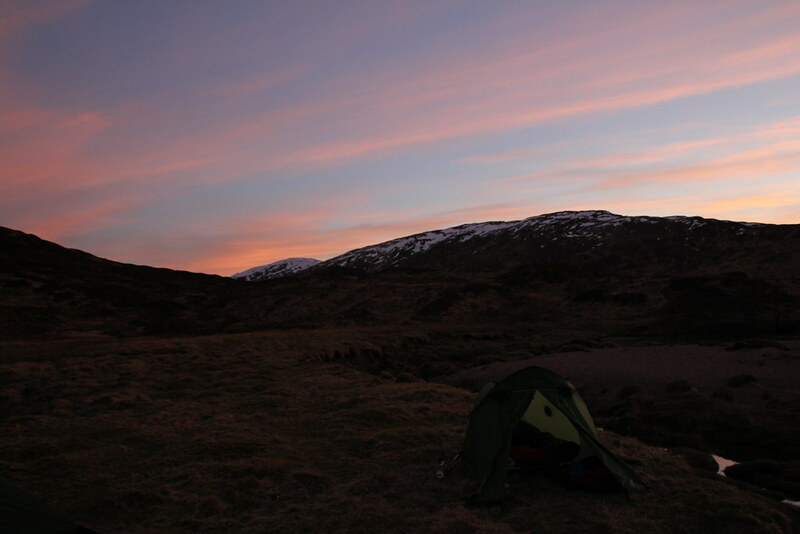 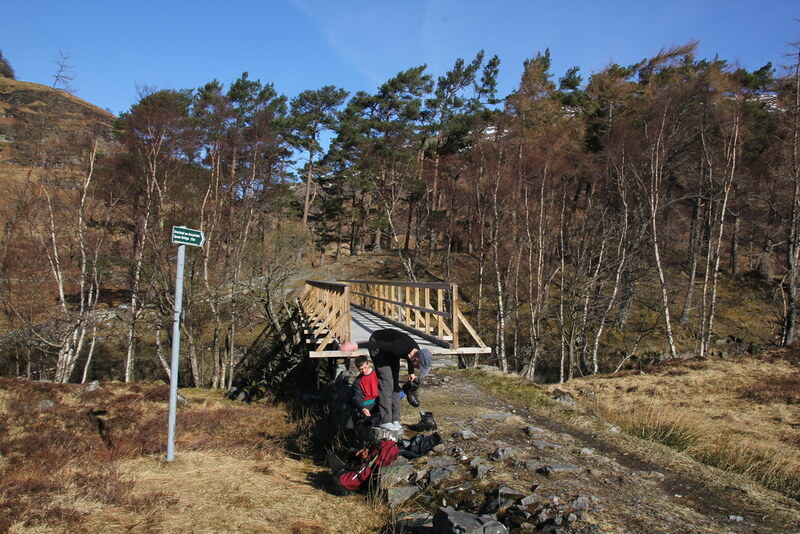 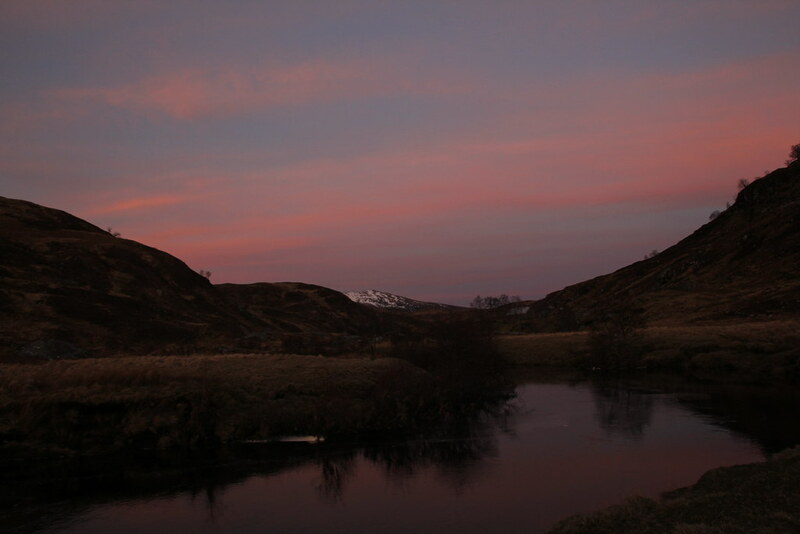 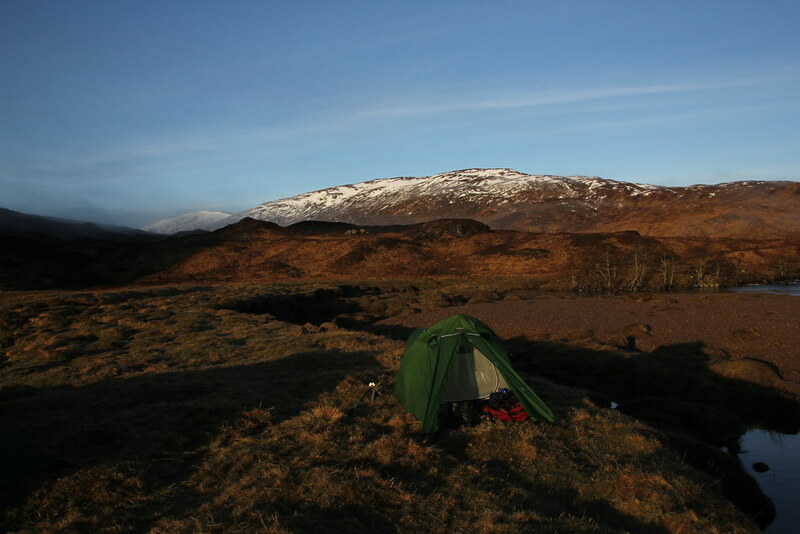 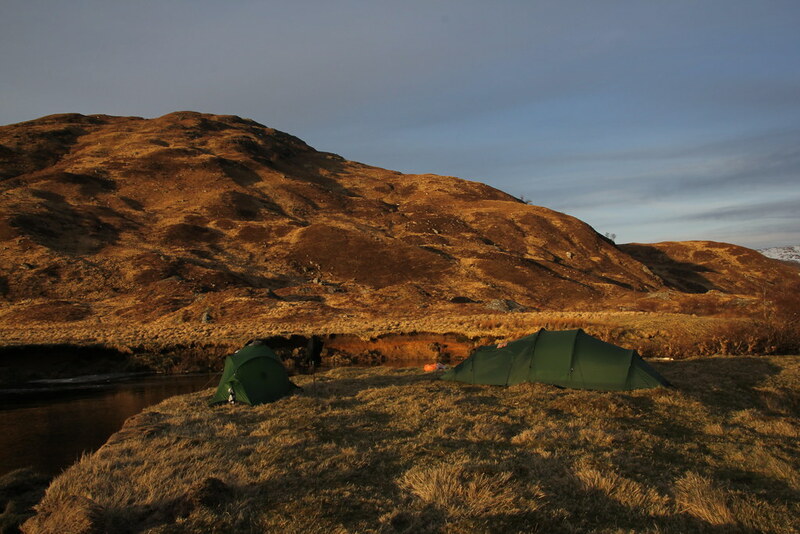 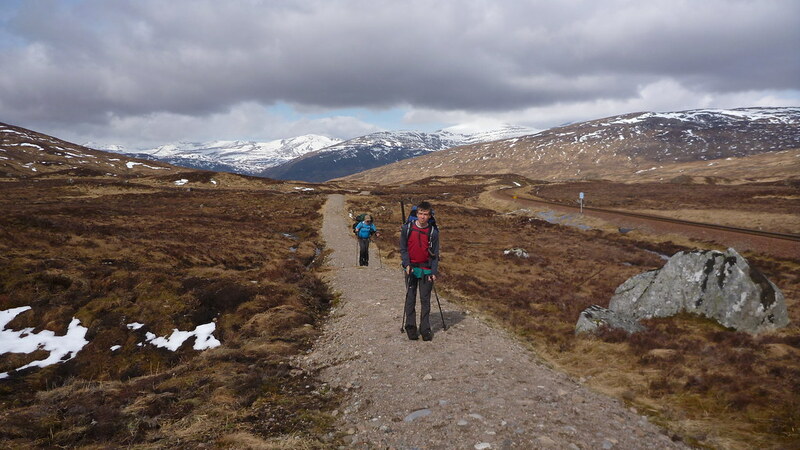 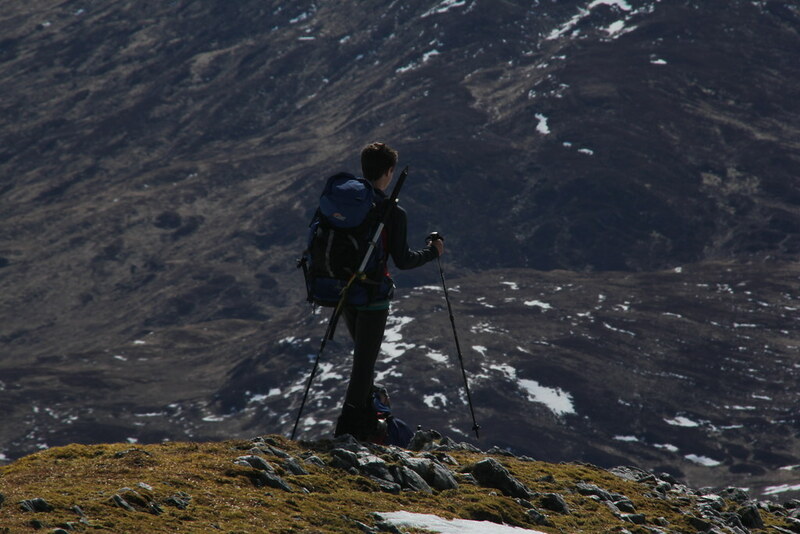 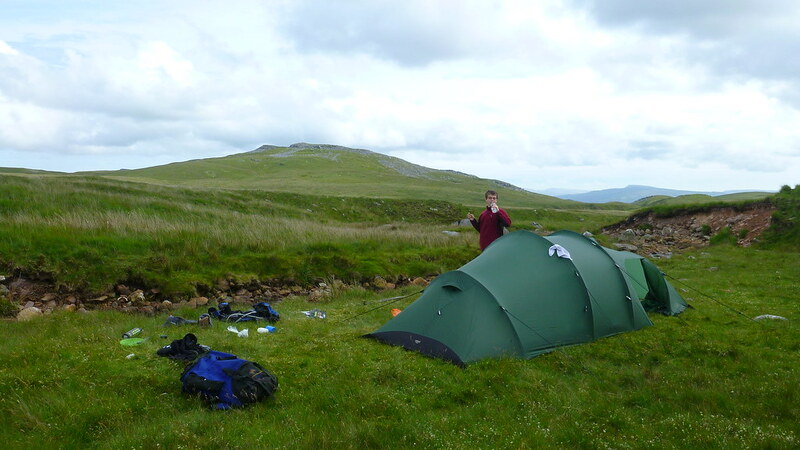 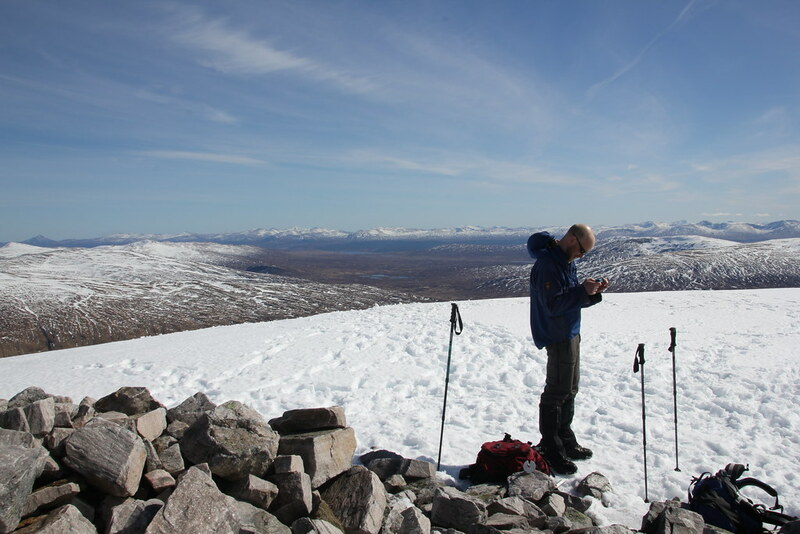 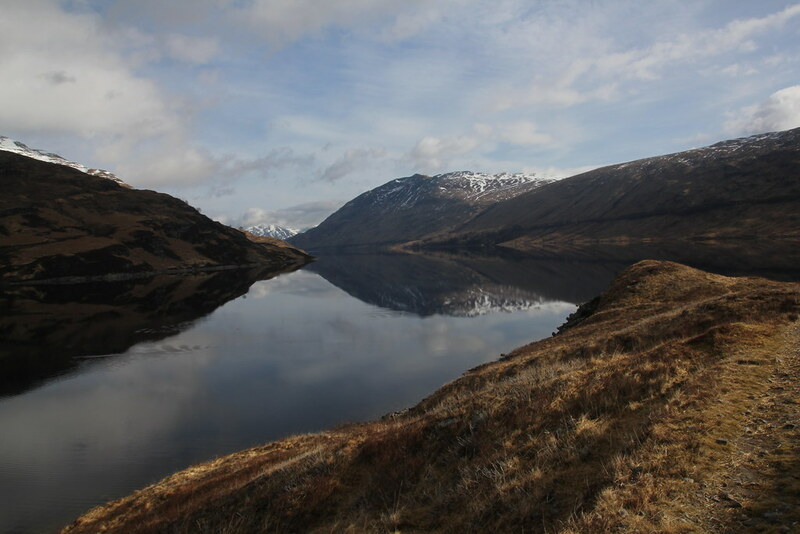 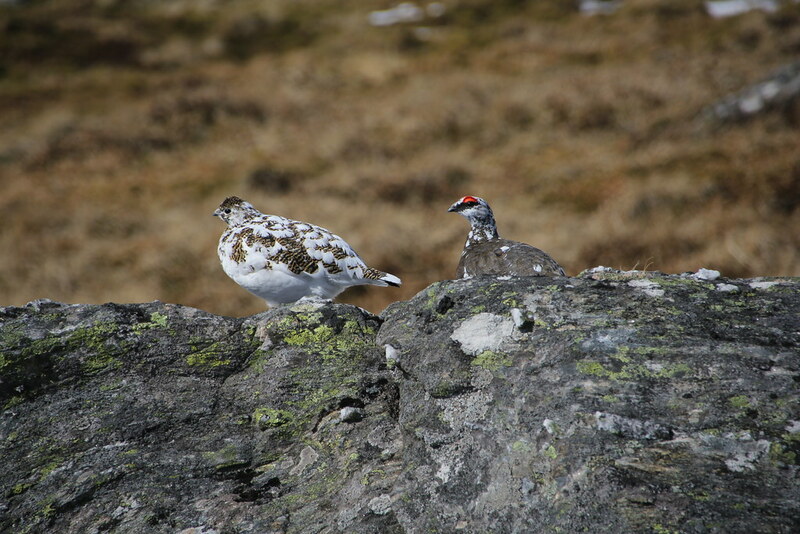 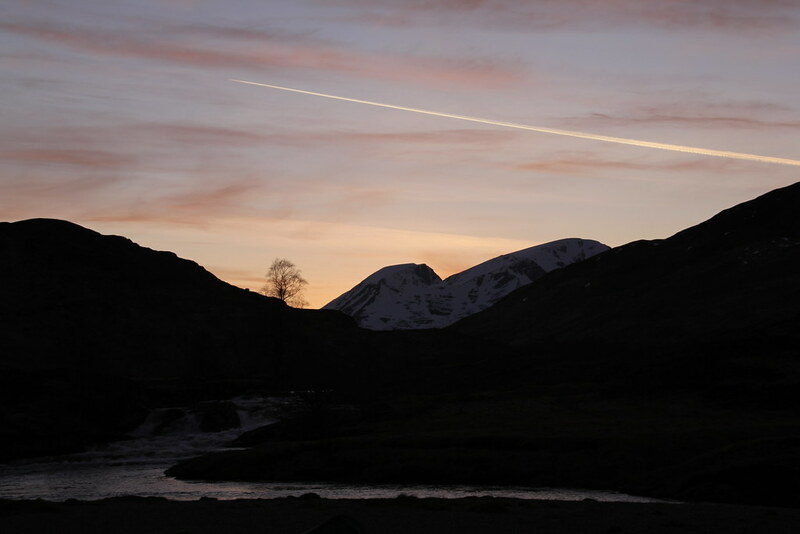 Our backpacking trip to Scotland over the Easter weekend has become a regular and much planned outing since 2009. 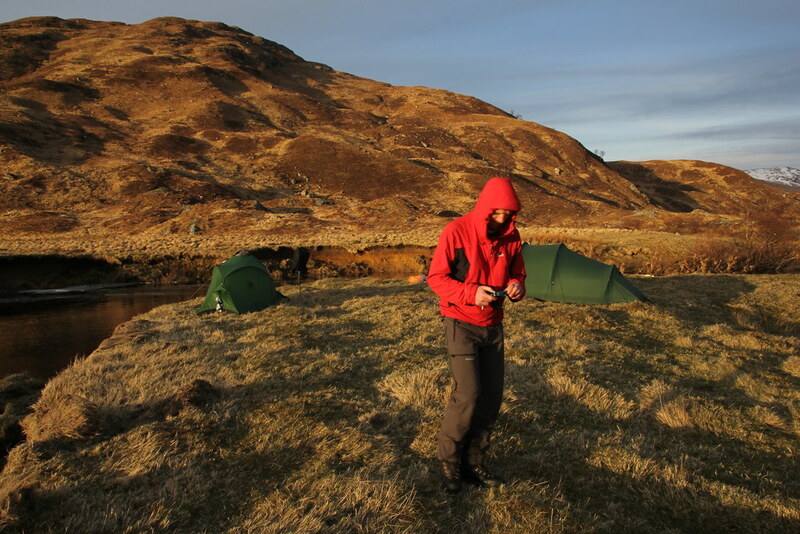 Thanks to GM and his photos you also have the pleasure of seeing me in action over the next few posts! 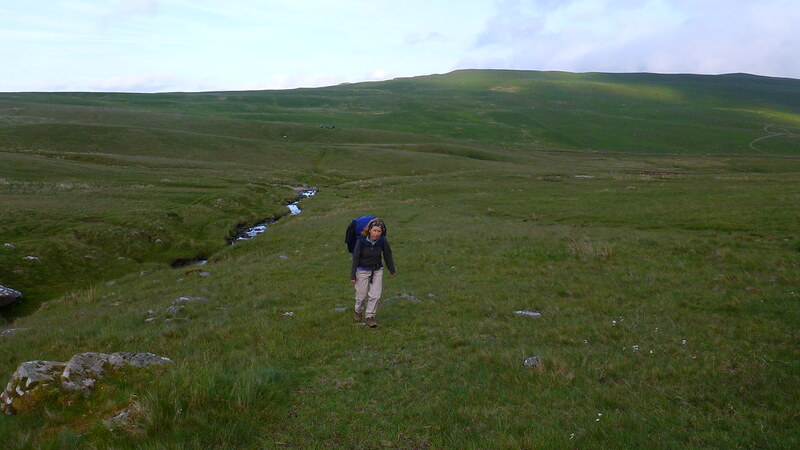 TJS is pretty experienced now in terms of his walks in Wales. 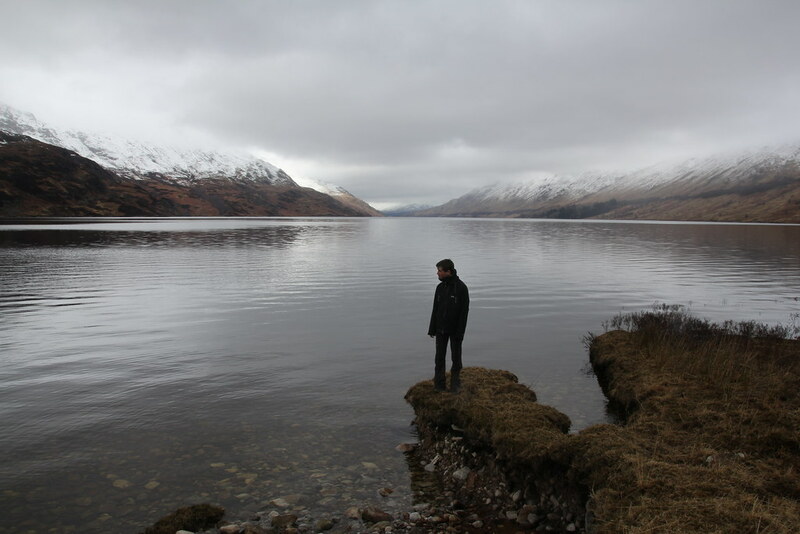 However he has never been to Scotland and I’ve been promising to take him. 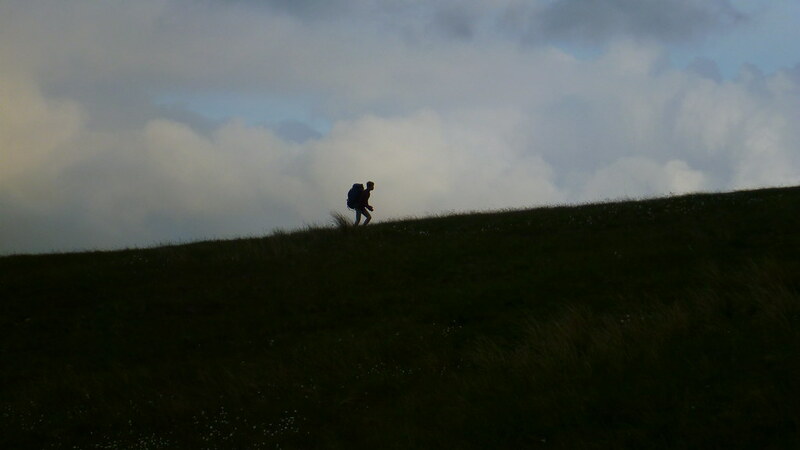 This year seemed like a good time to move him on to the next level. 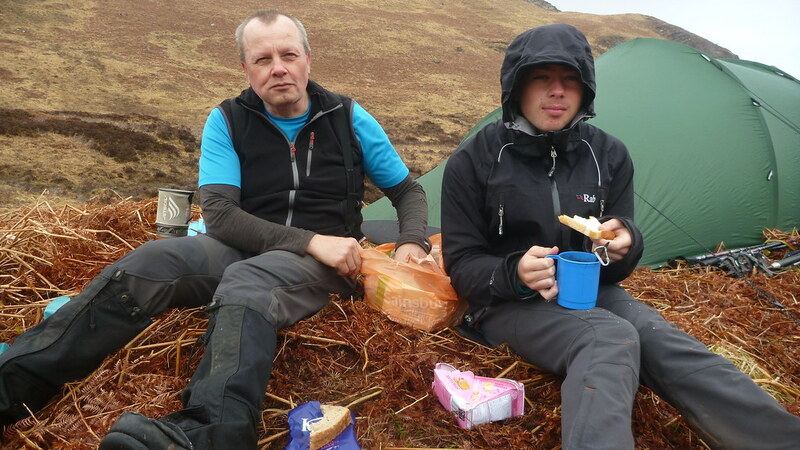 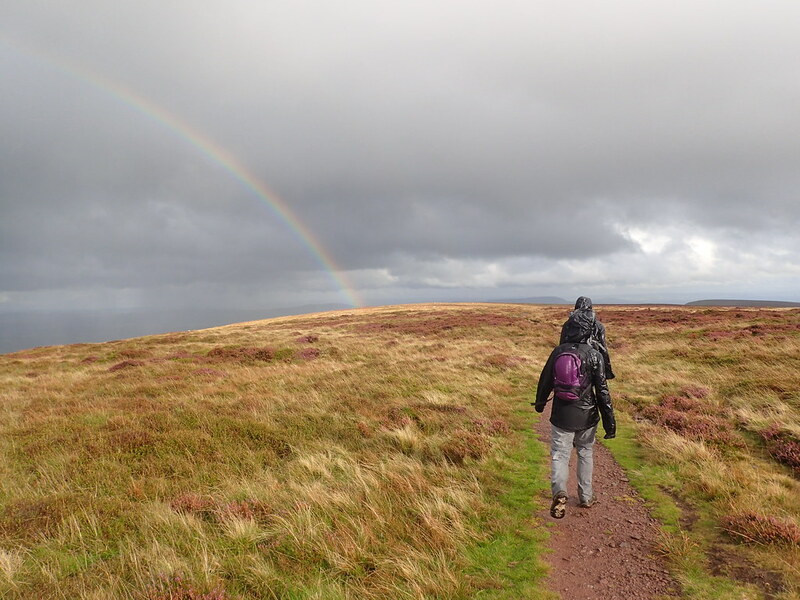 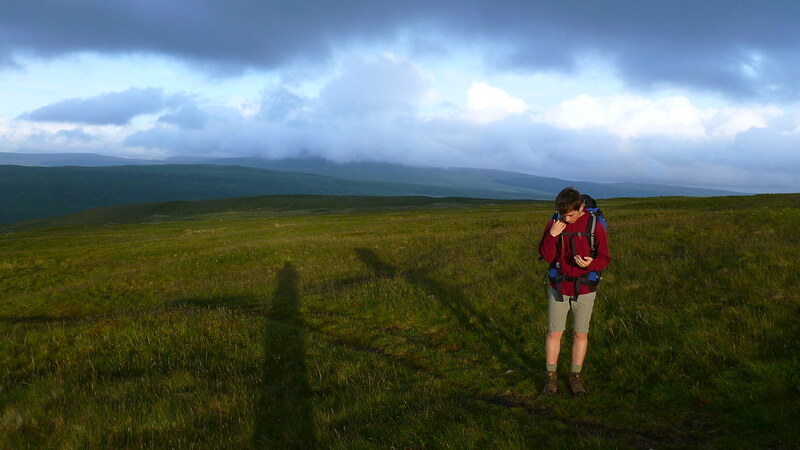 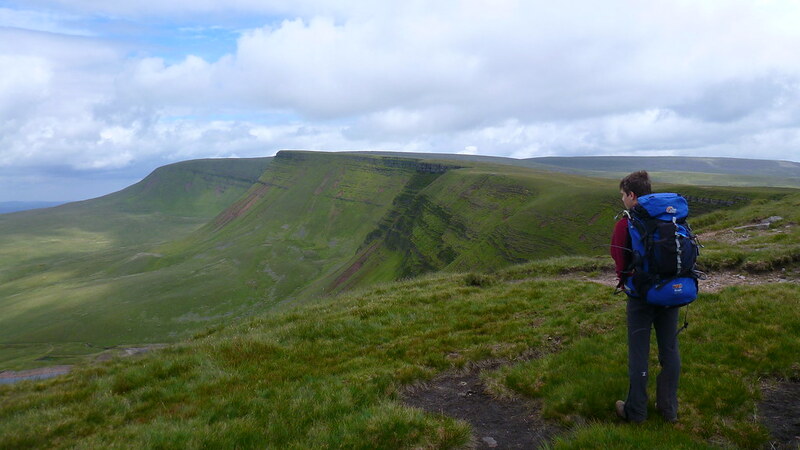 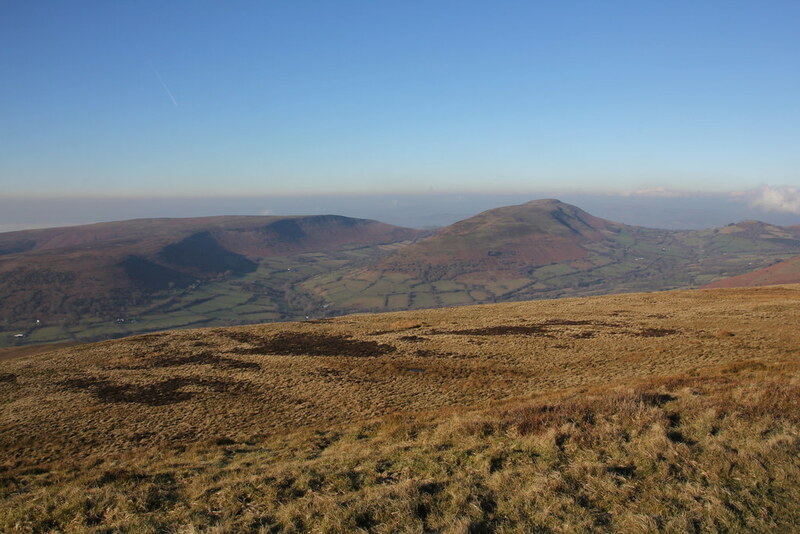 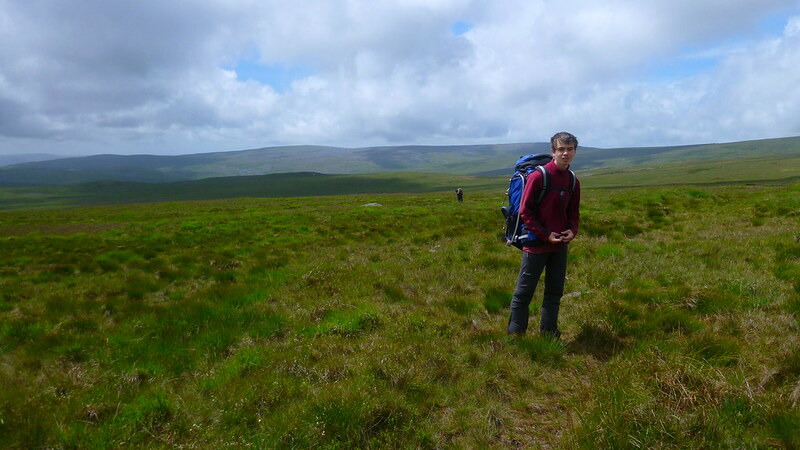 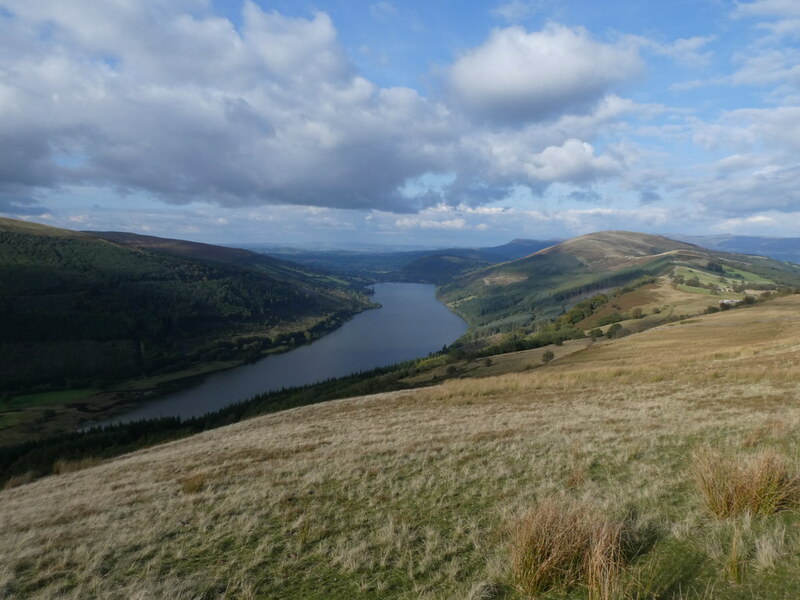 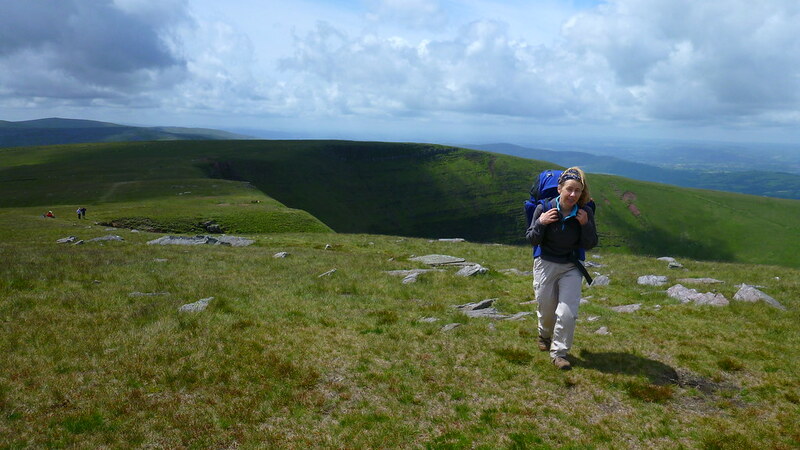 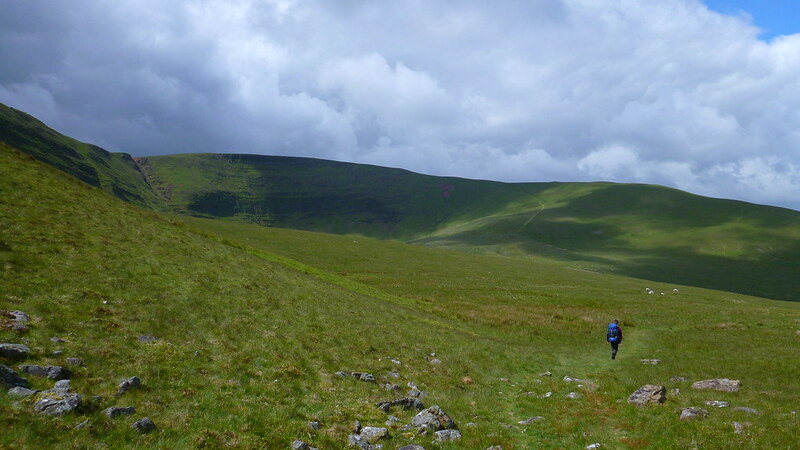 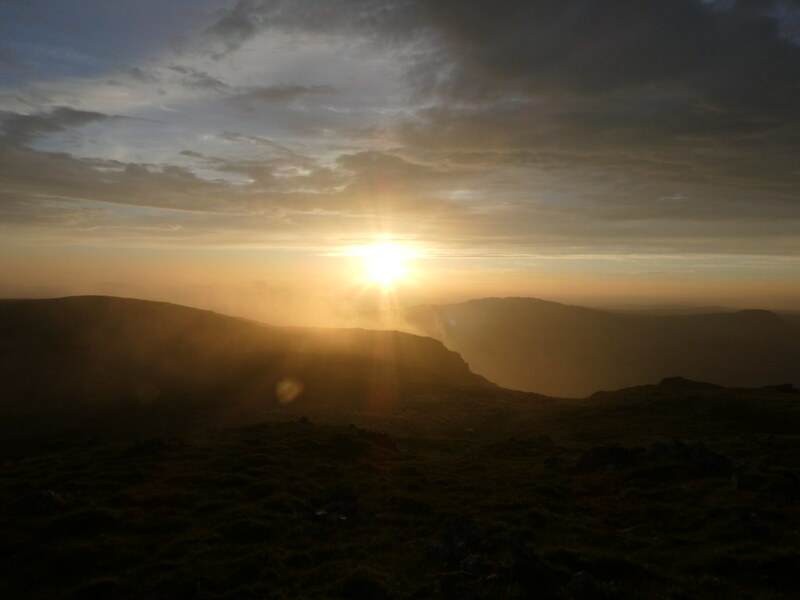 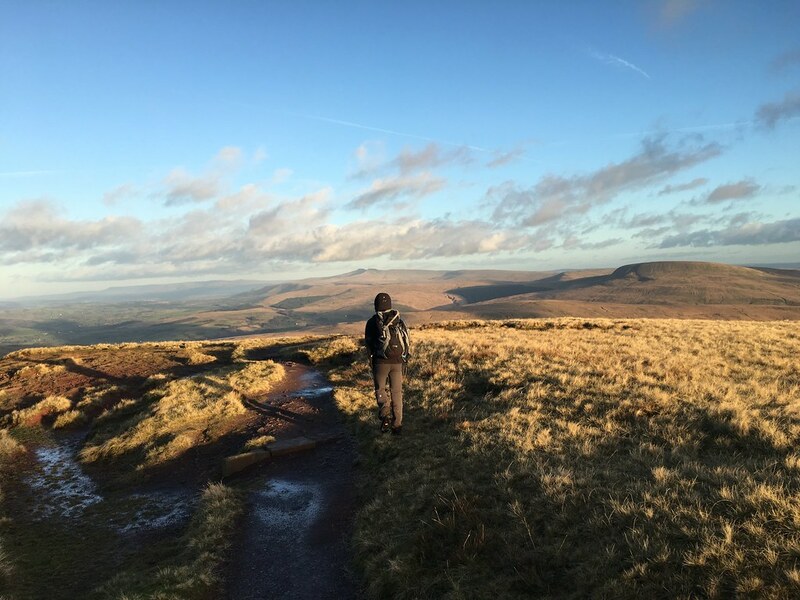 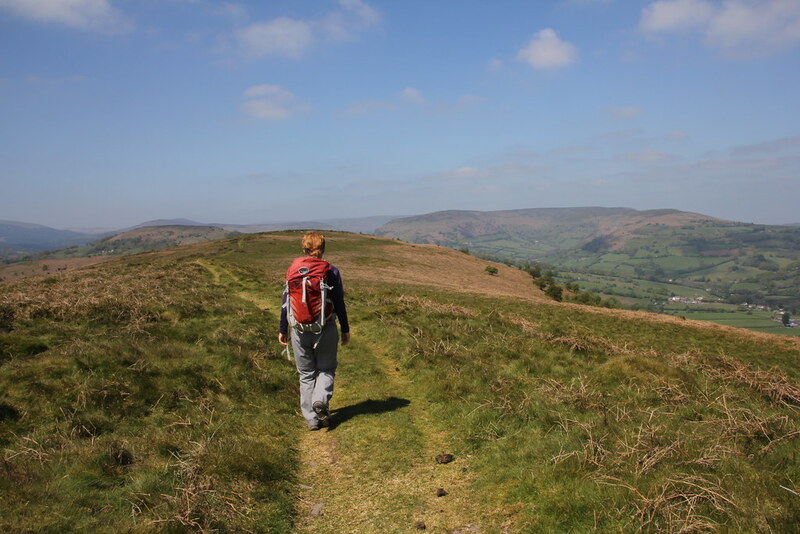 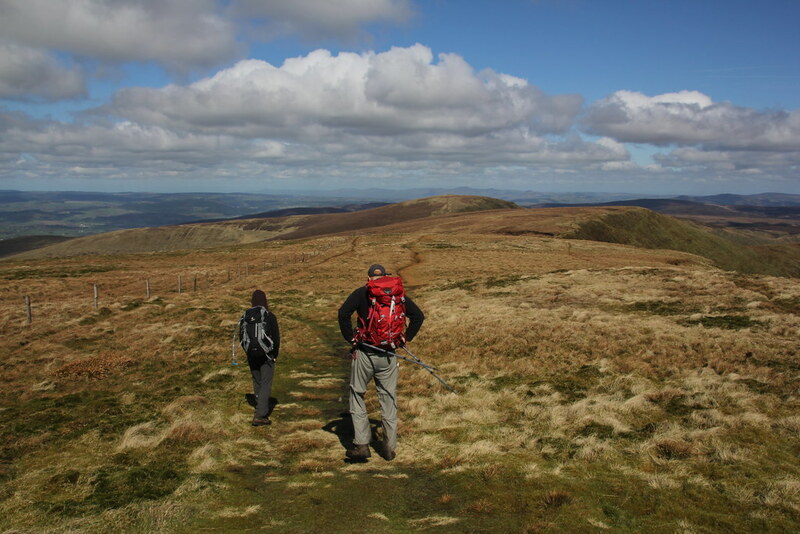 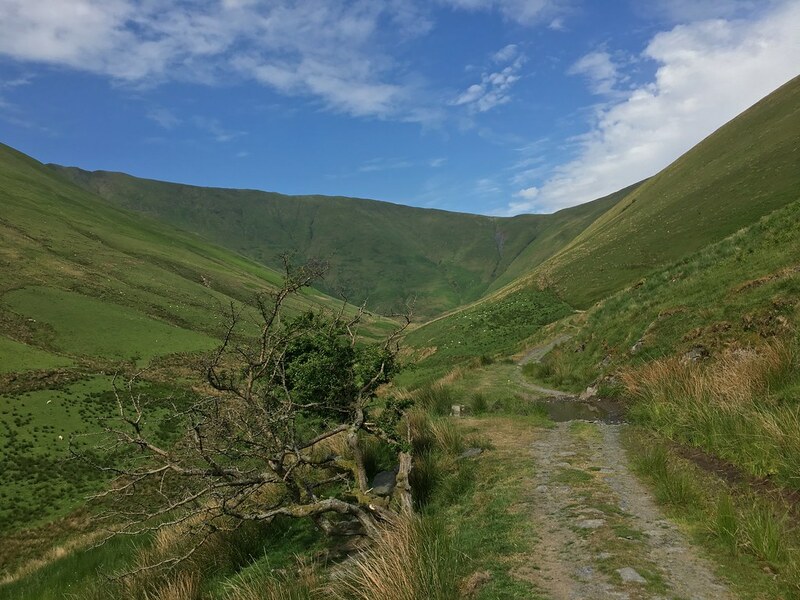 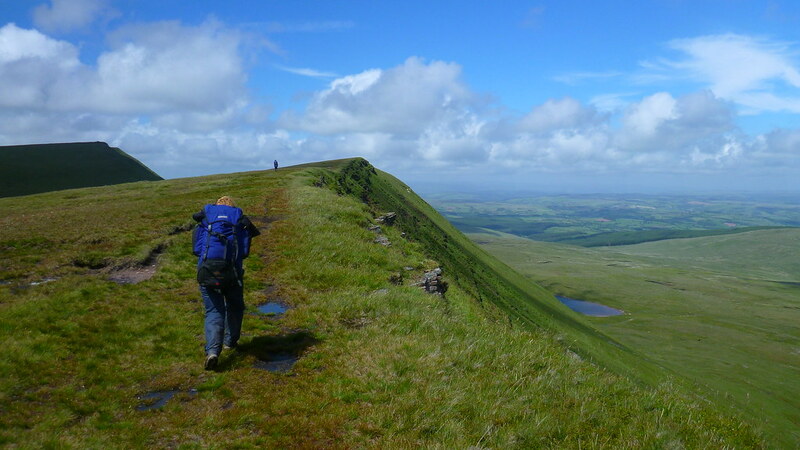 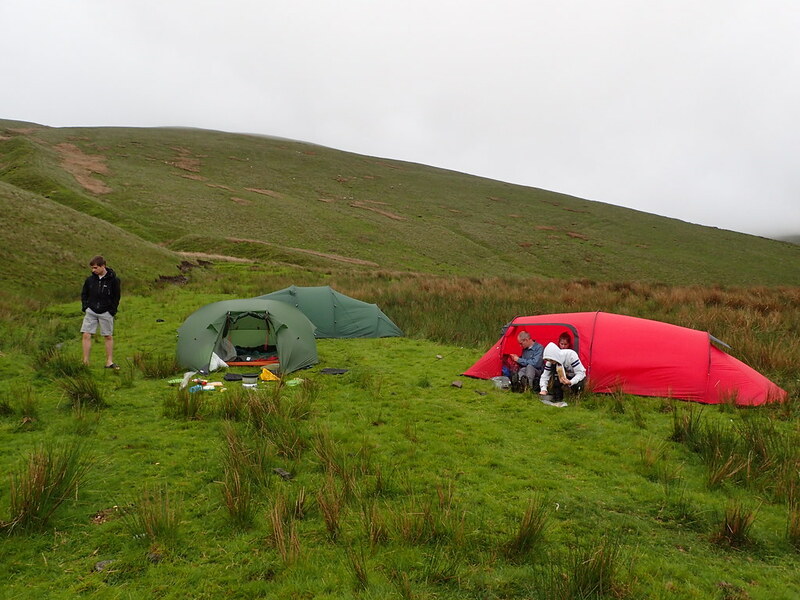 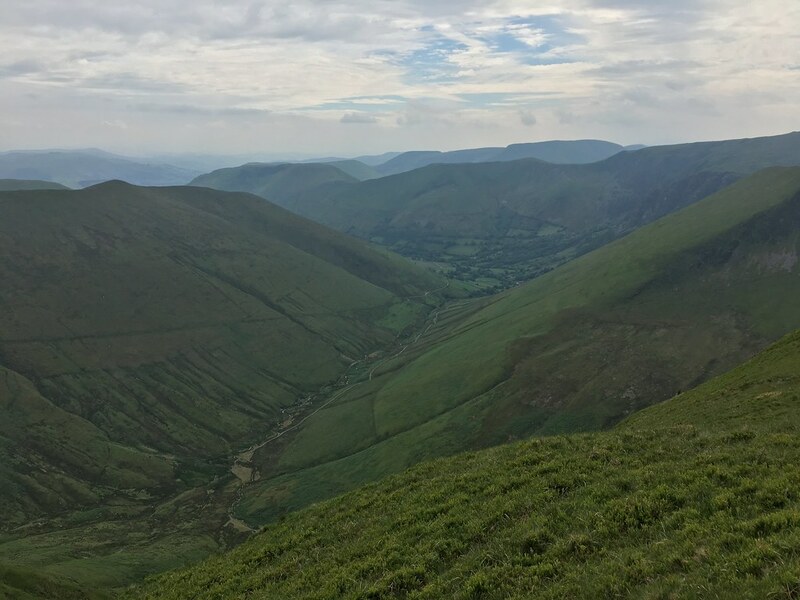 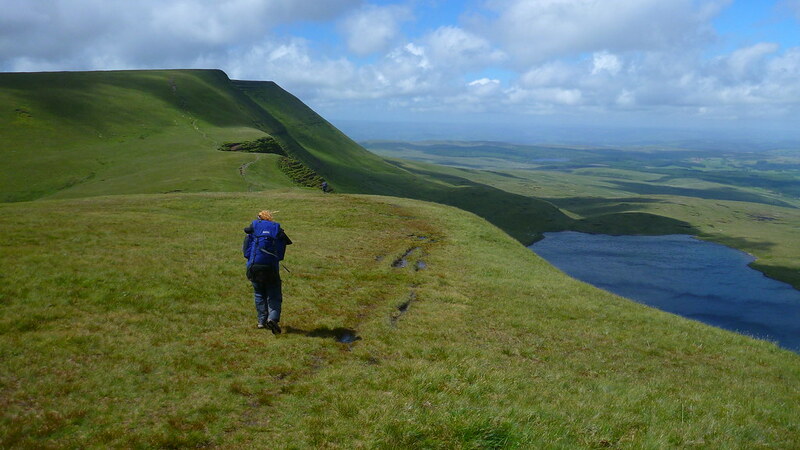 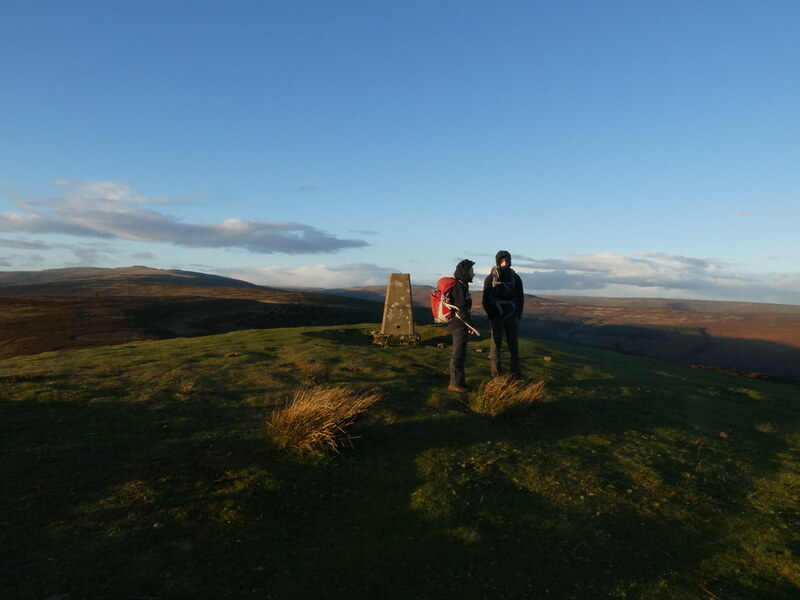 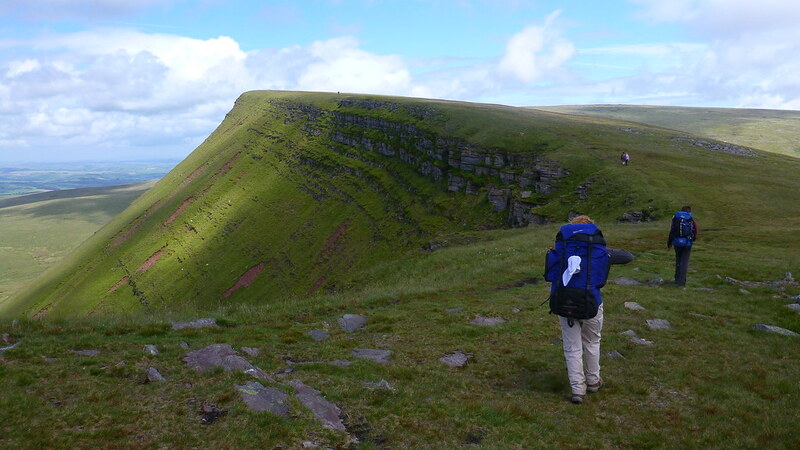 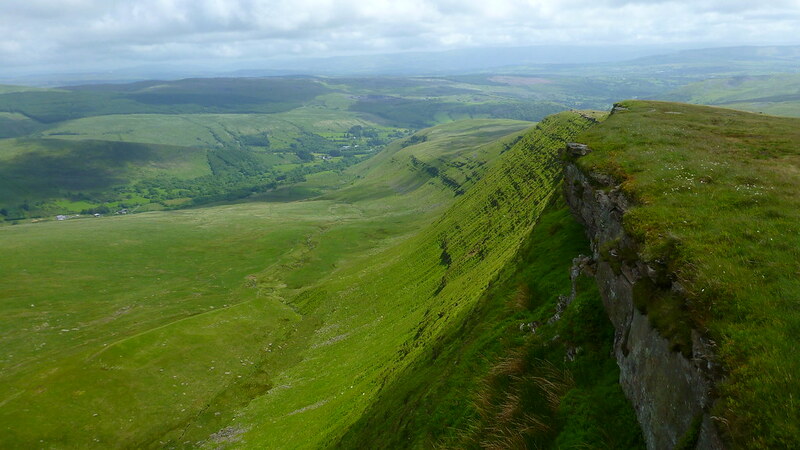 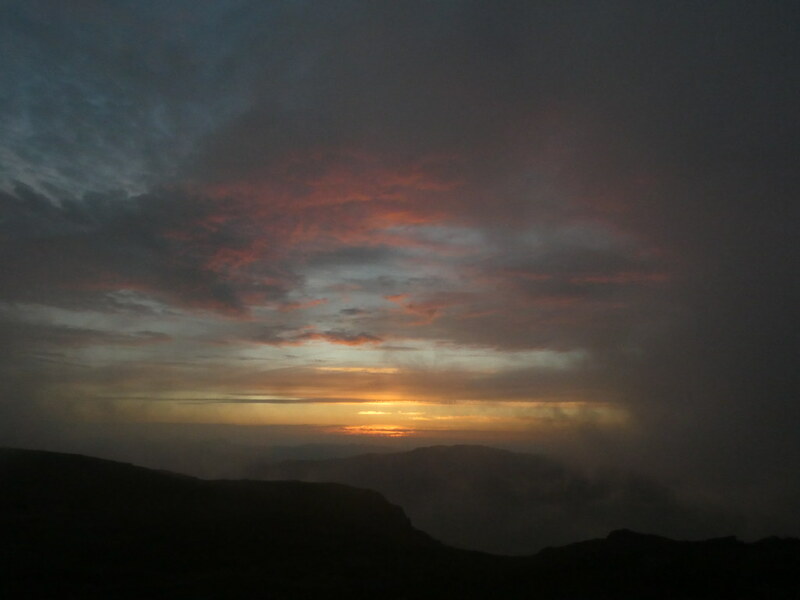 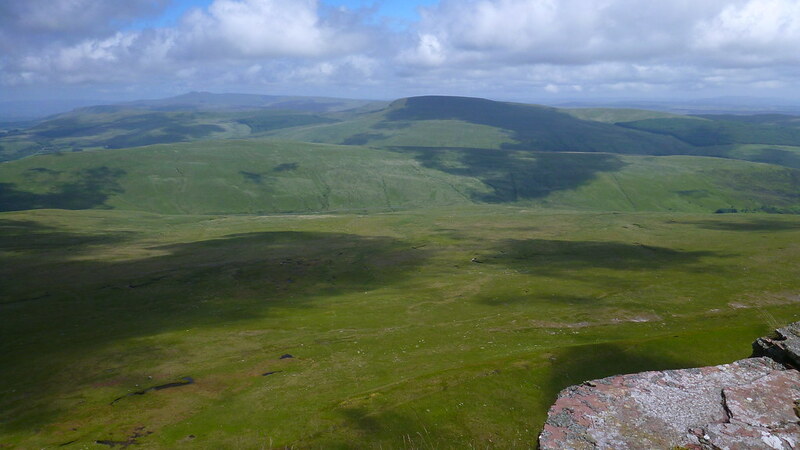 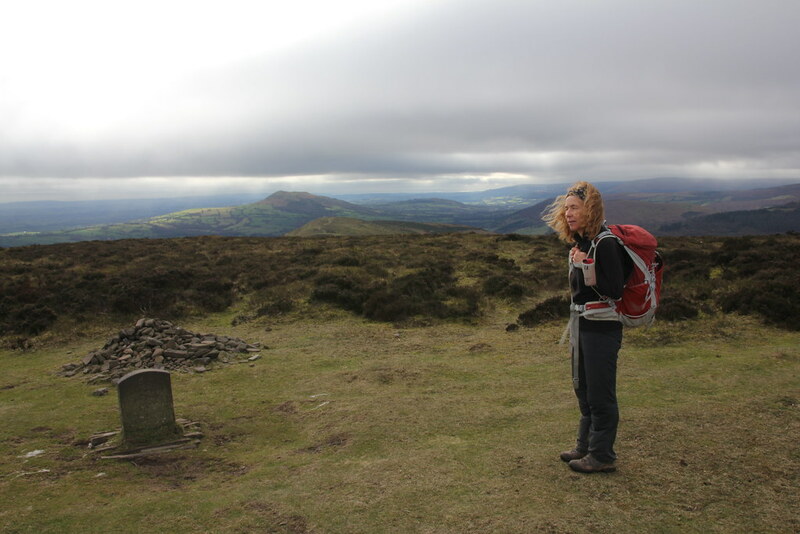 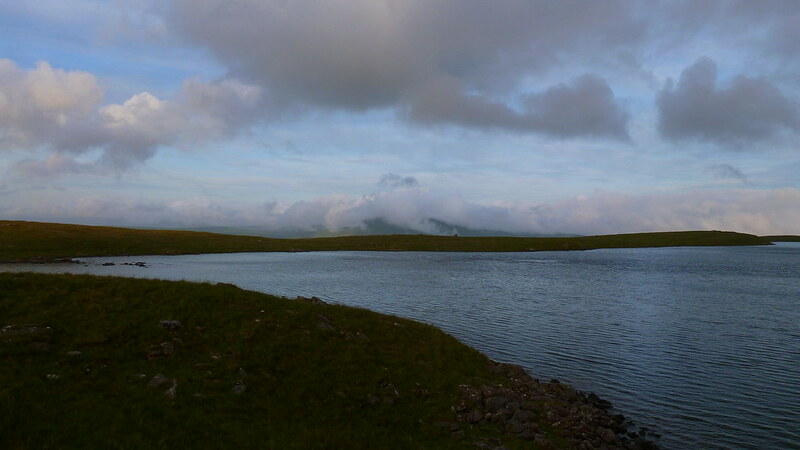 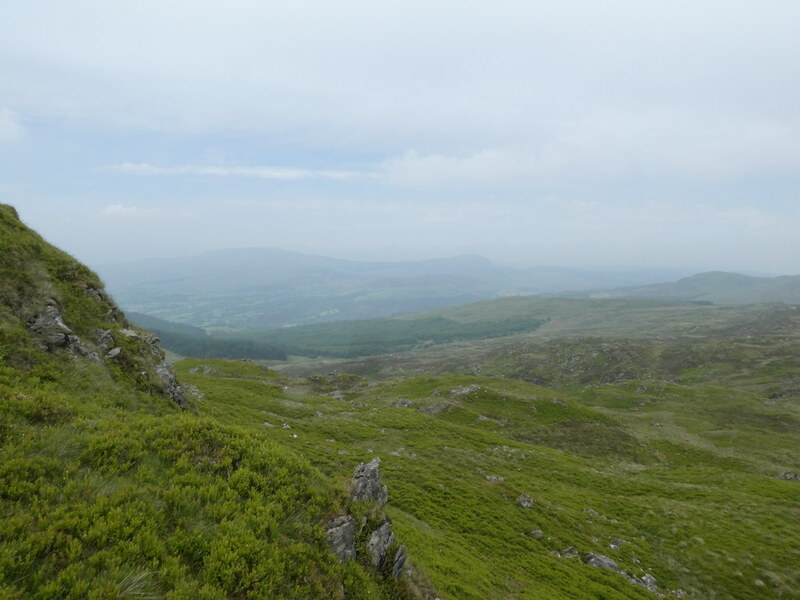 He was just back from a long weekend on the Brecon Beacons Way with TBF in some wild, wet and stormy weather. 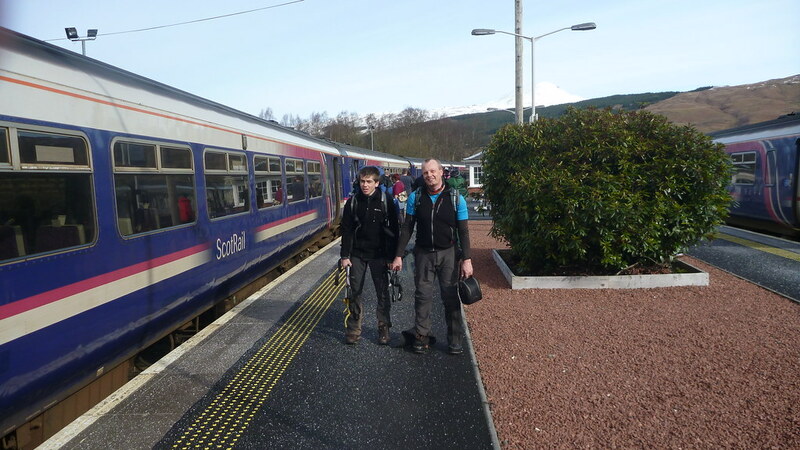 They did some long days and clocked up some decent miles. 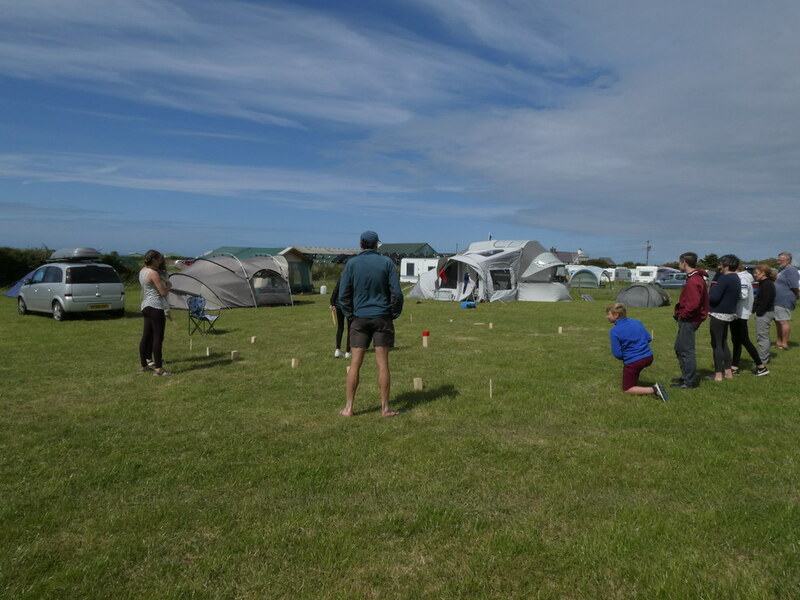 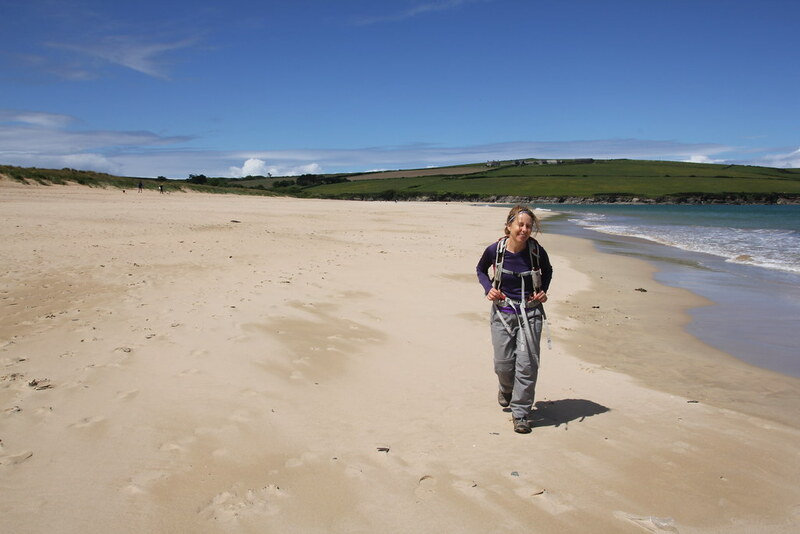 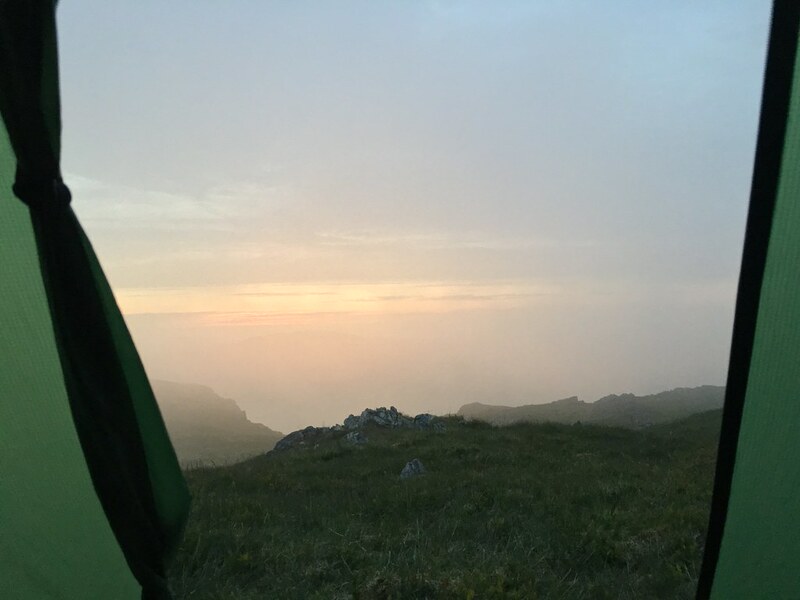 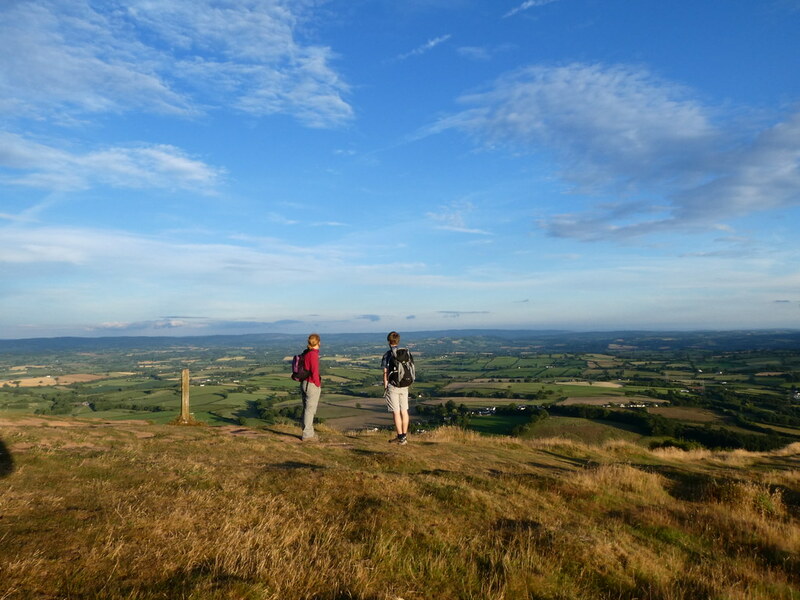 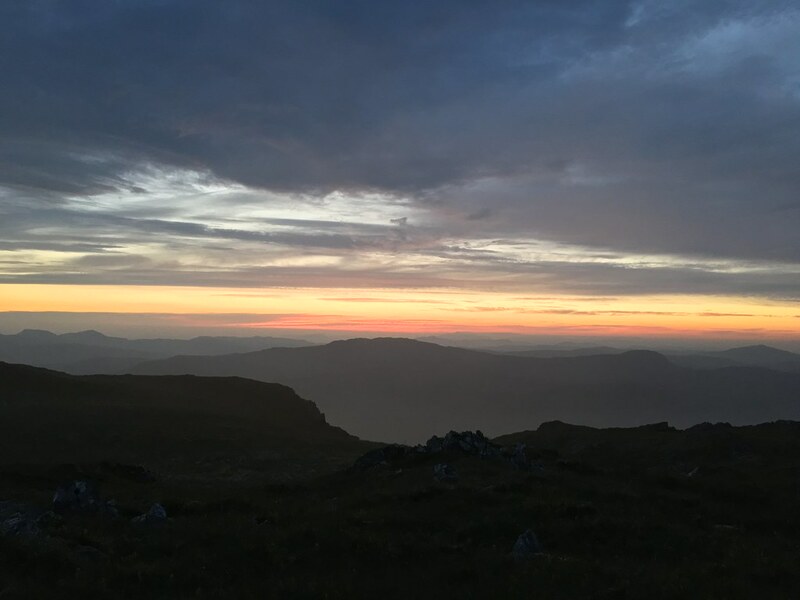 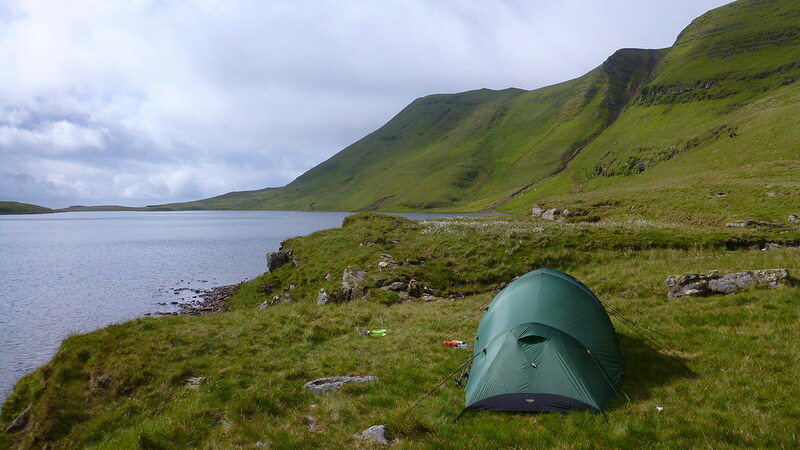 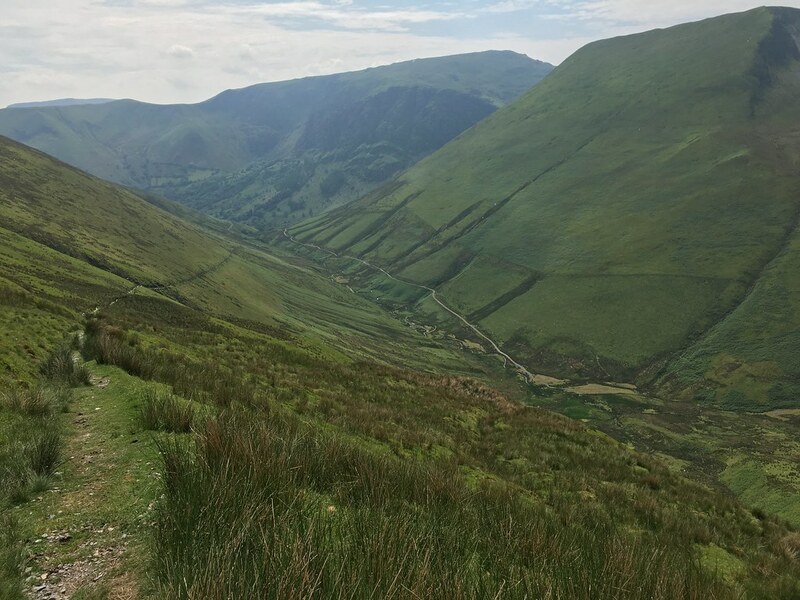 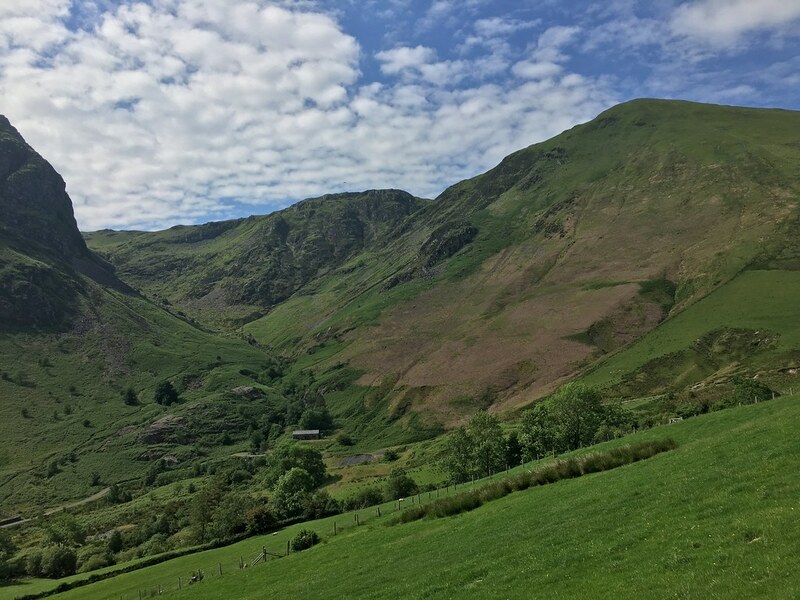 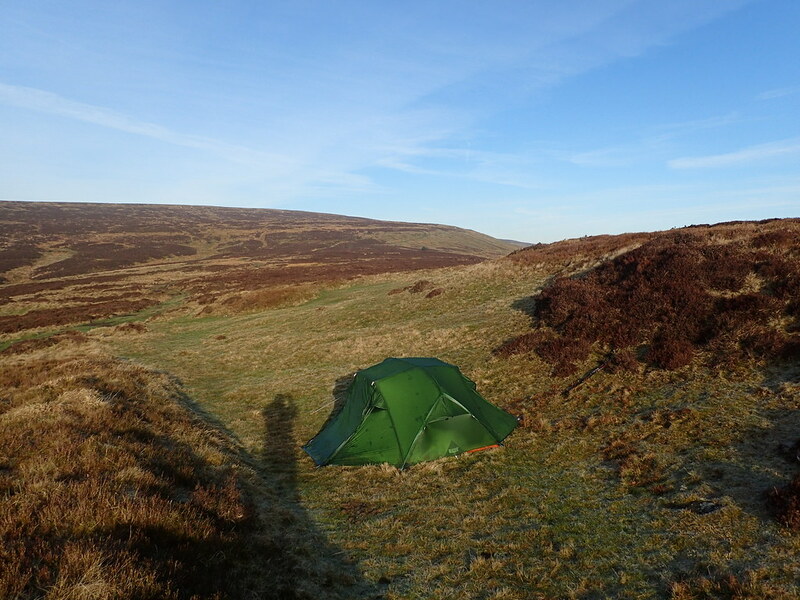 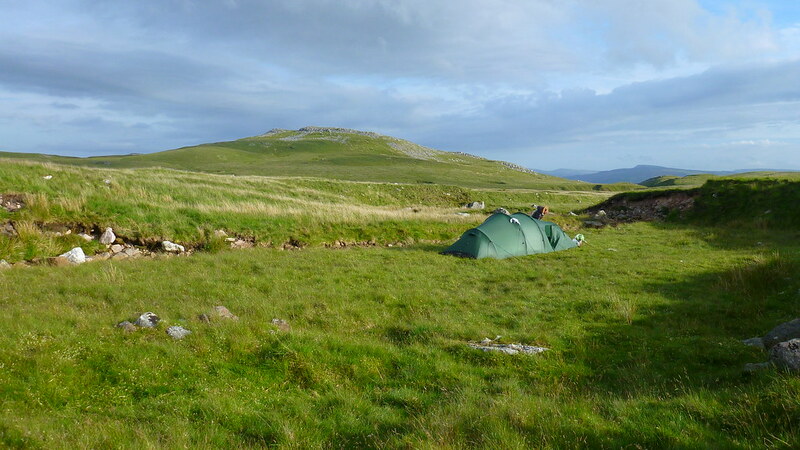 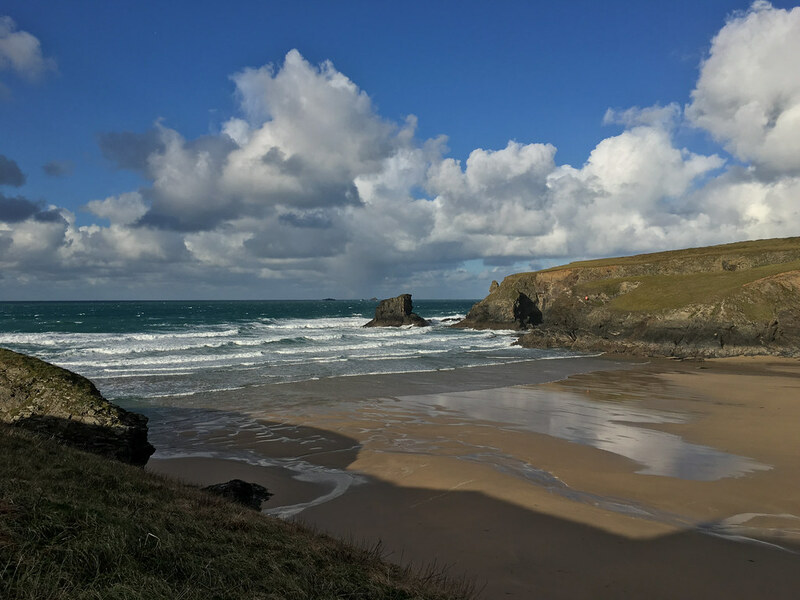 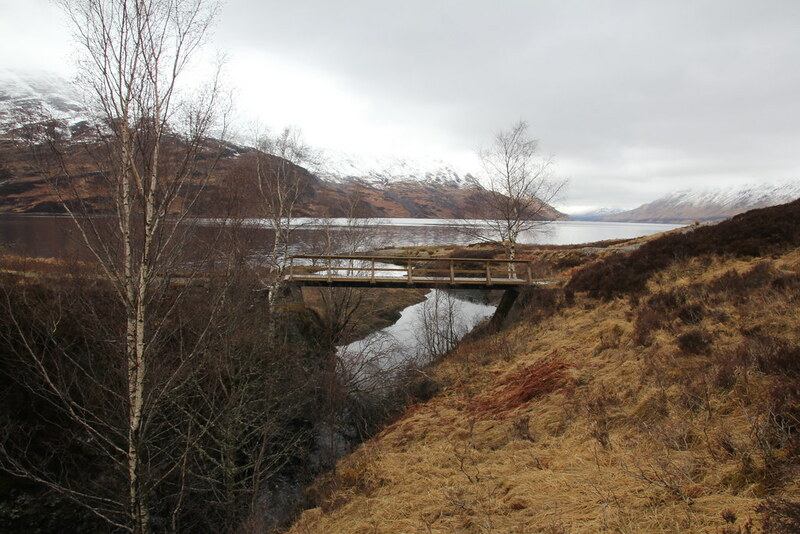 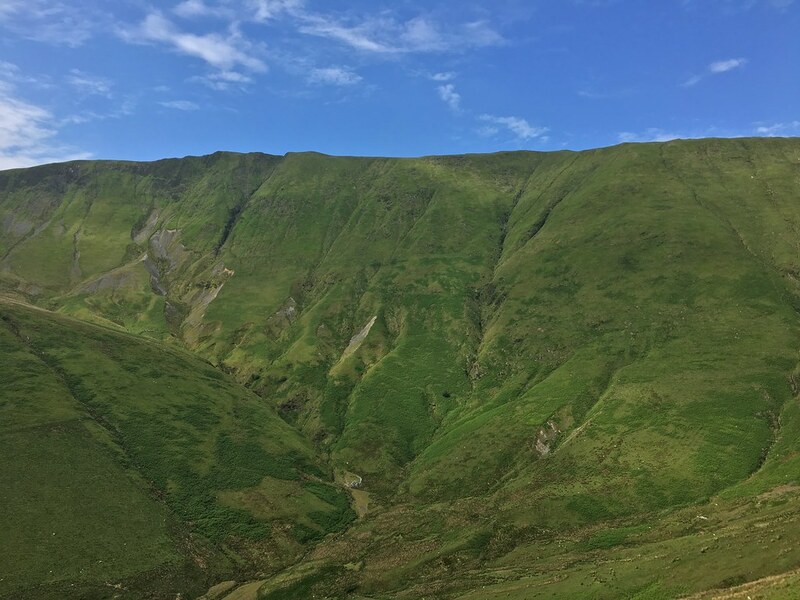 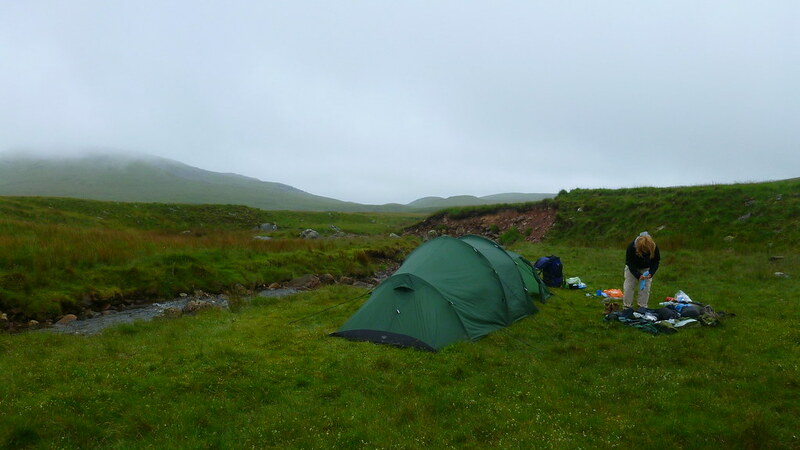 However walking on marked paths and staying in hotels, B&Bs and Bunkhouses is a world away from the Scottish Highlands in a tent. 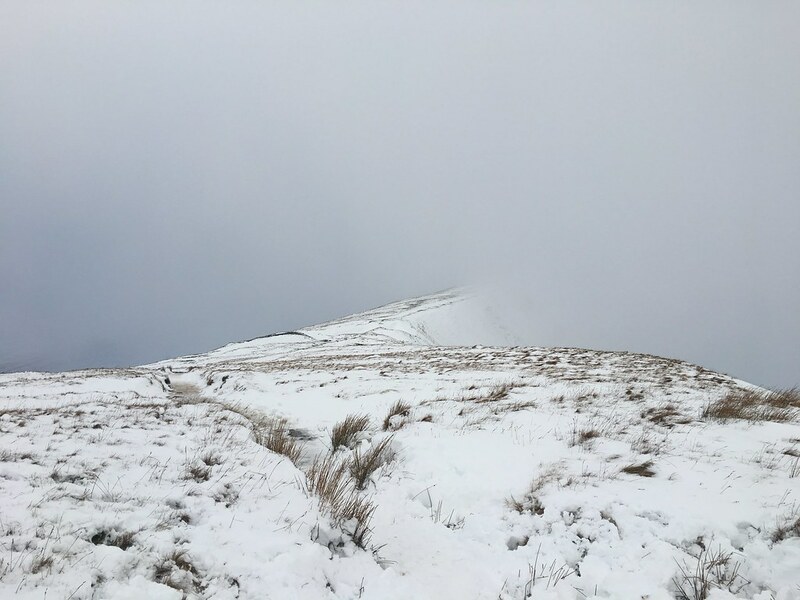 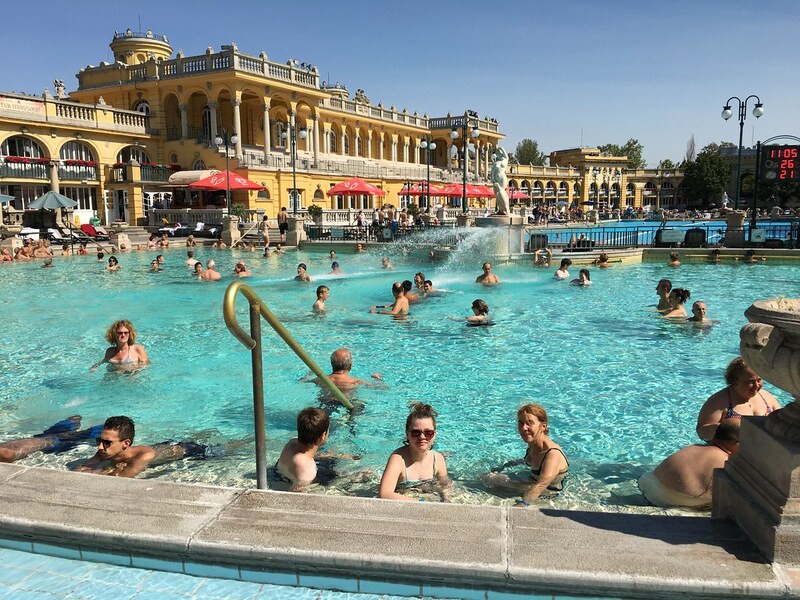 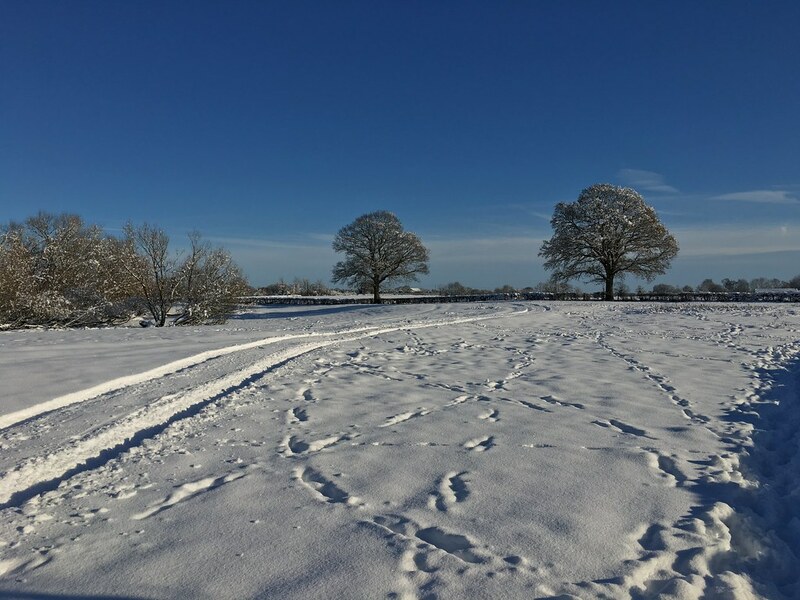 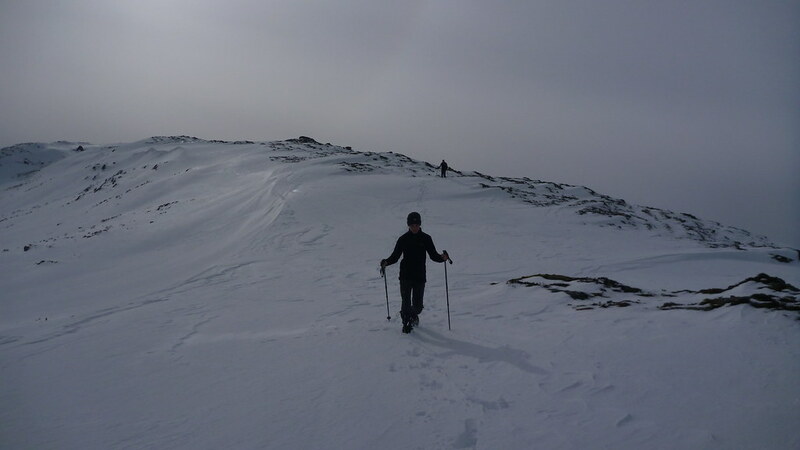 The challenge was added to by the fact that Scotland was still in the grip of winter so conditions would be even more challenging. 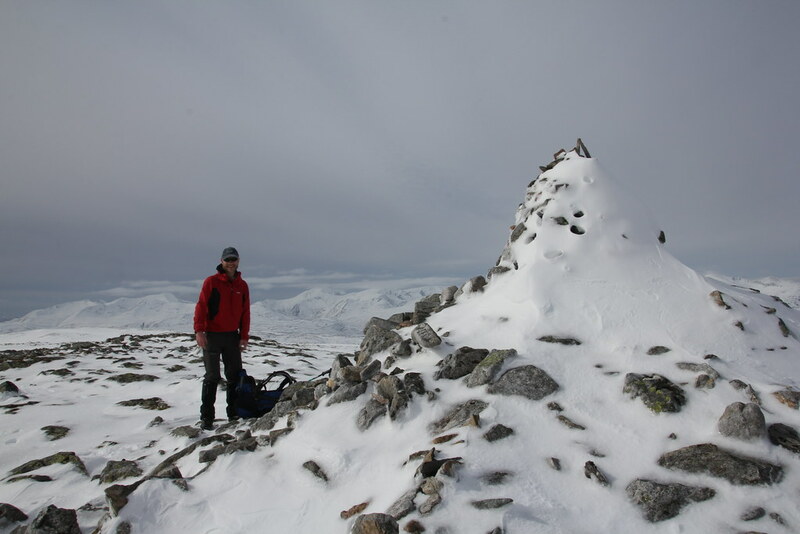 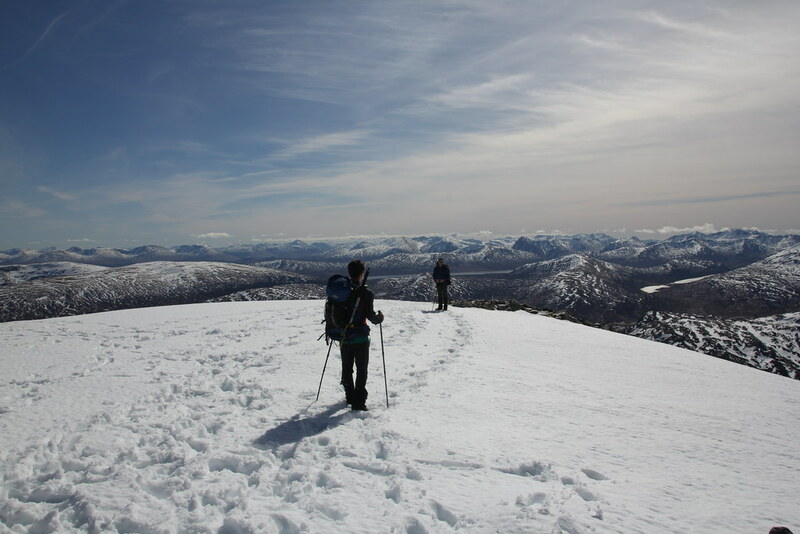 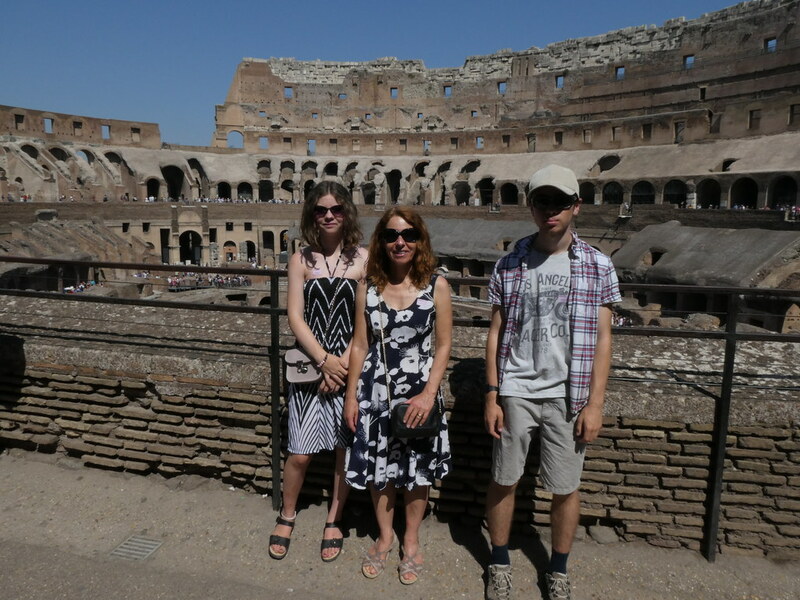 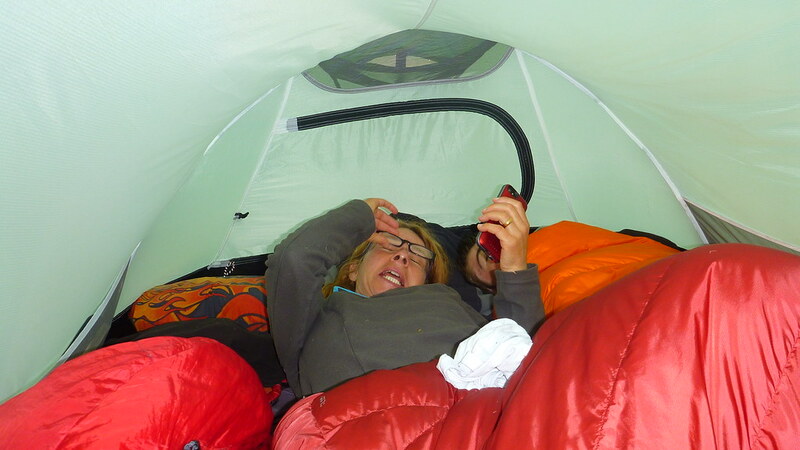 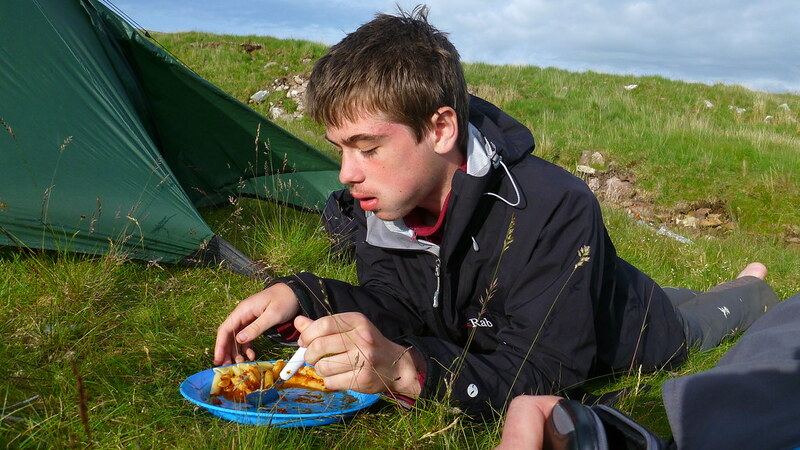 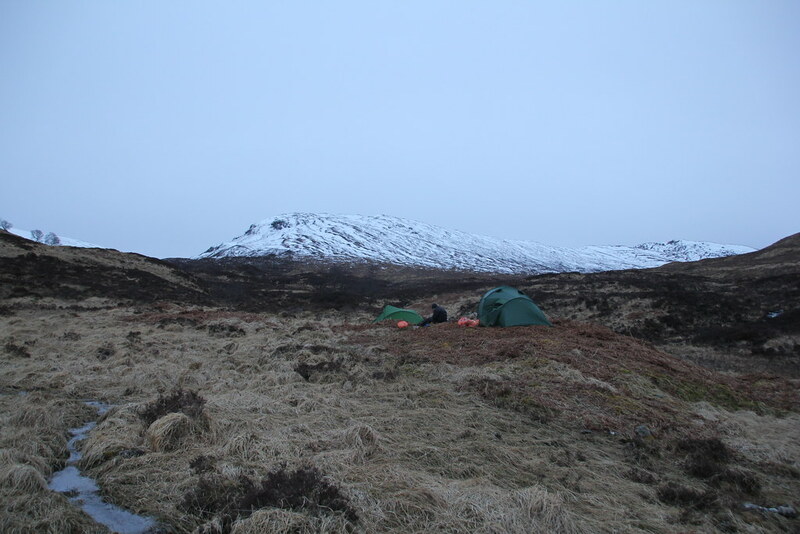 Added to that, we were out for 5 days and needing to carry extra food, extra clothes and ice axe and crampons. 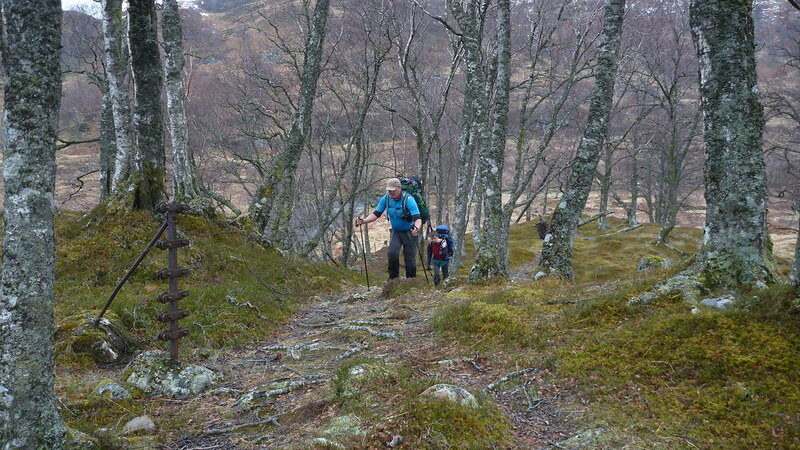 This made for a very heavy pack probably in excess of 50lbs for me and GM. 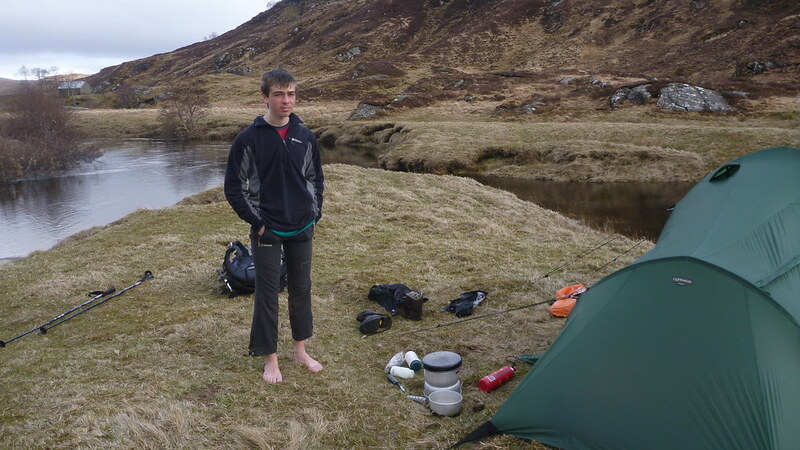 With this in mind, where did we plan to take TJS for his first Scottish adventure? 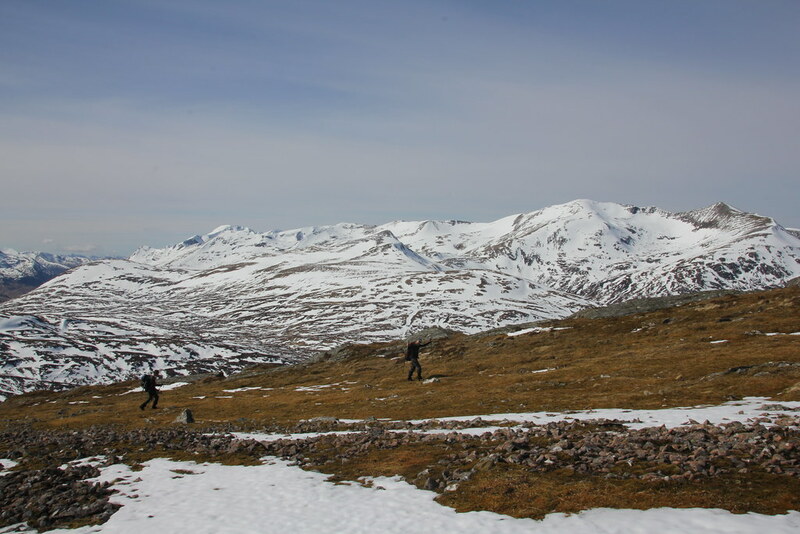 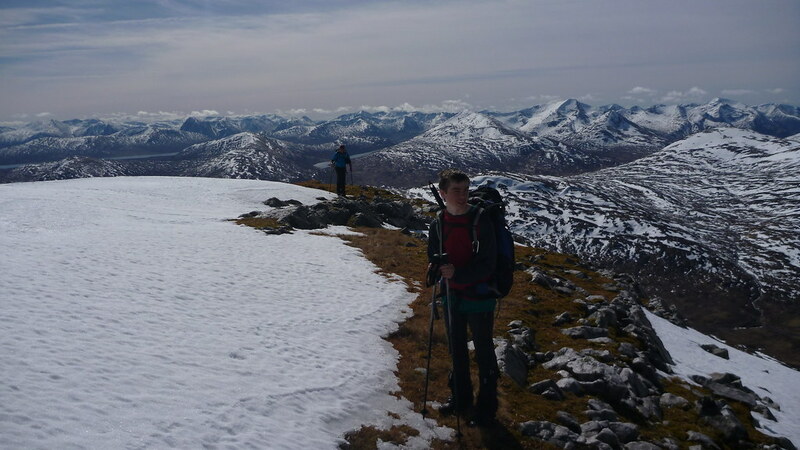 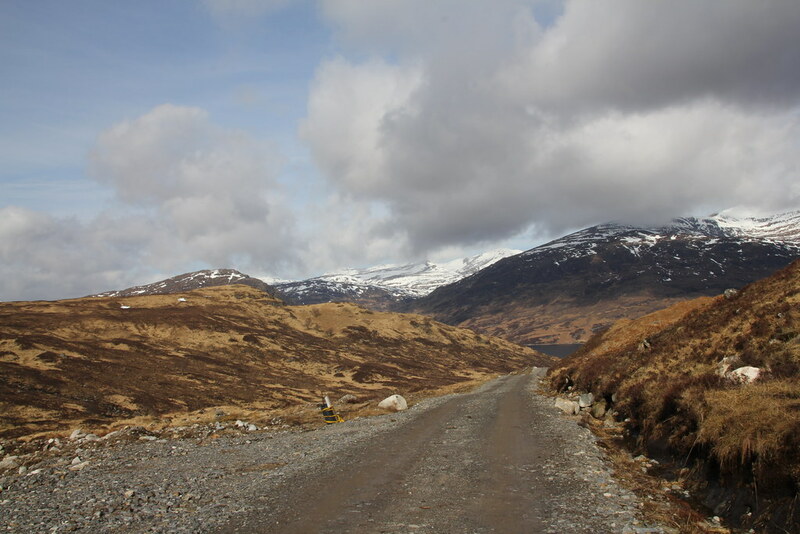 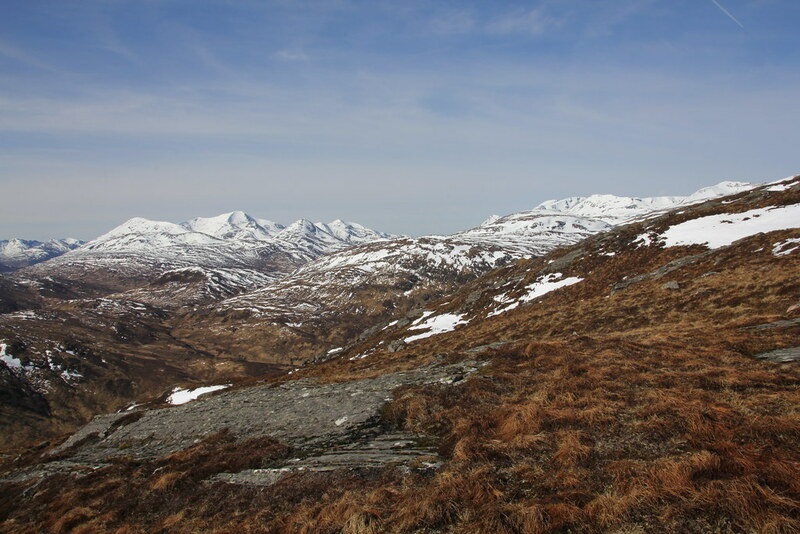 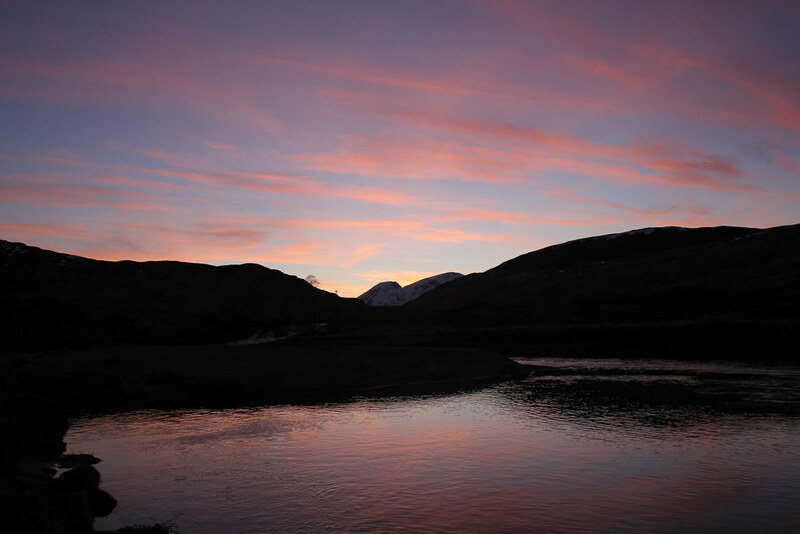 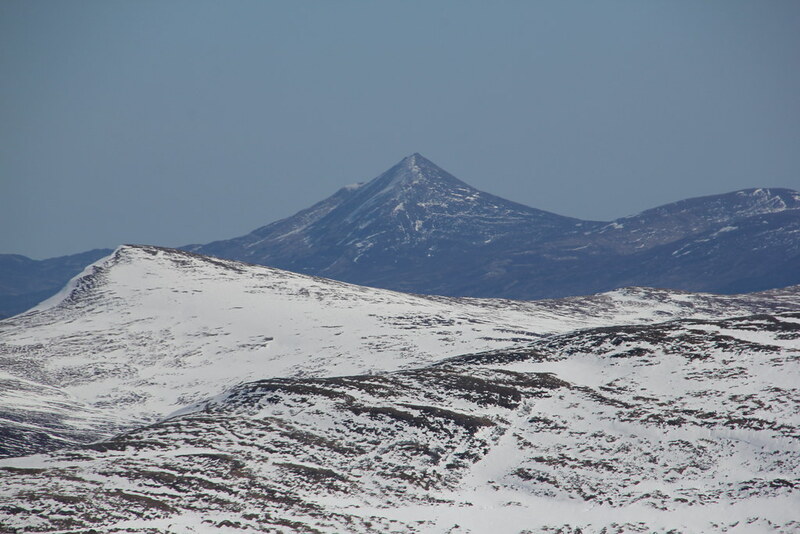 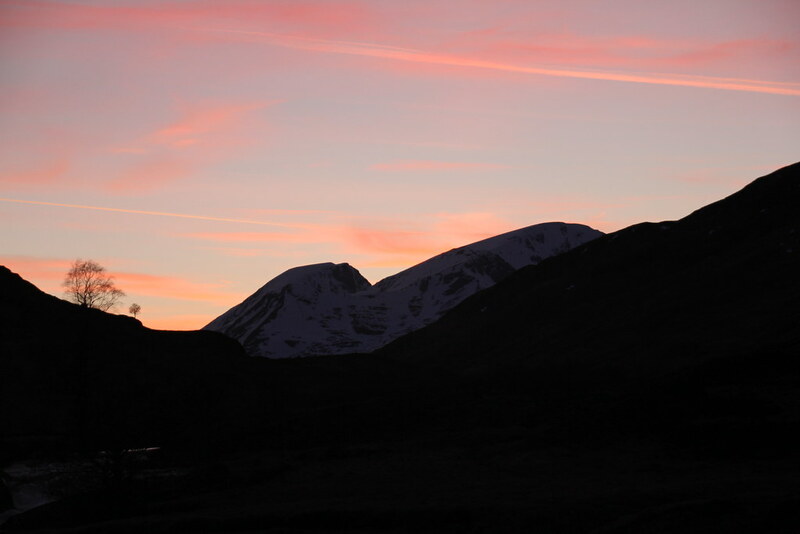 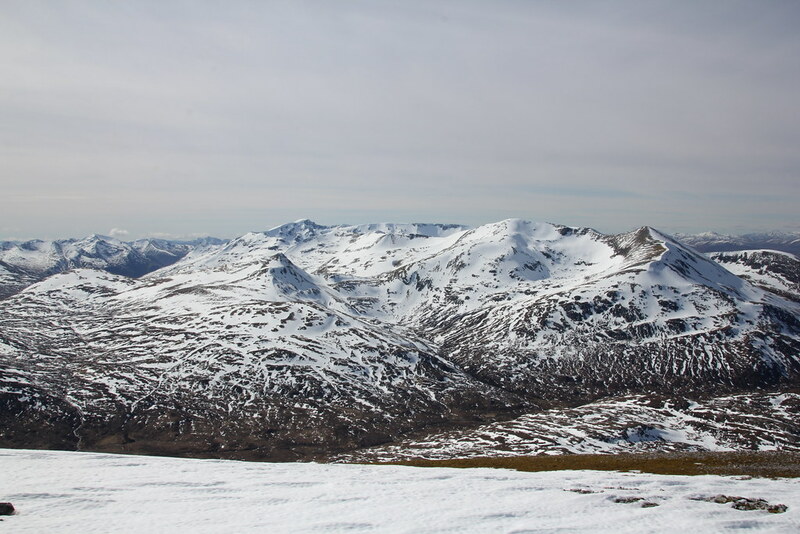 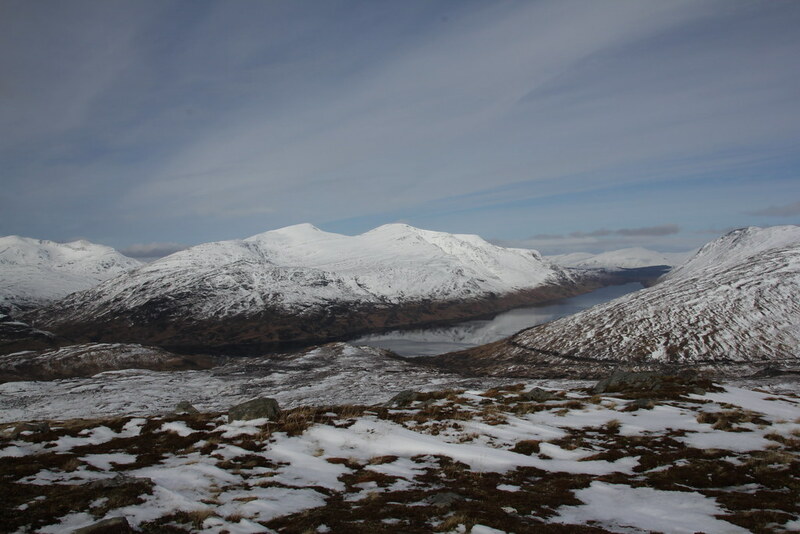 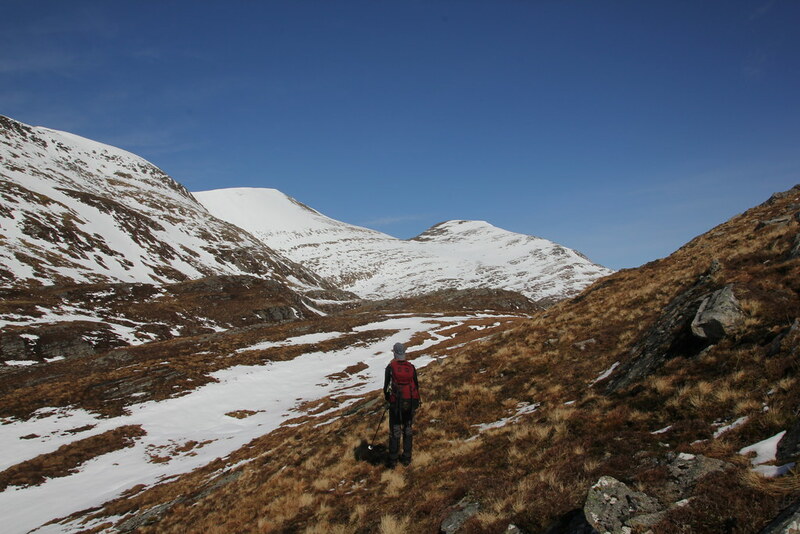 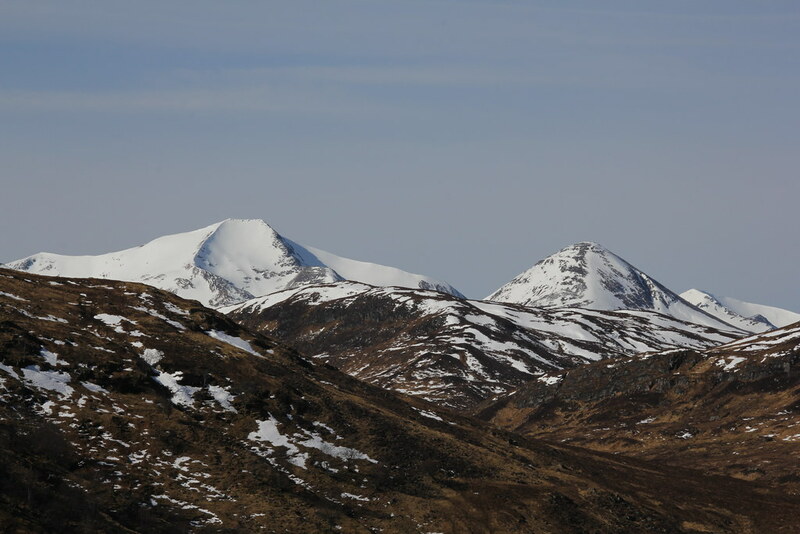 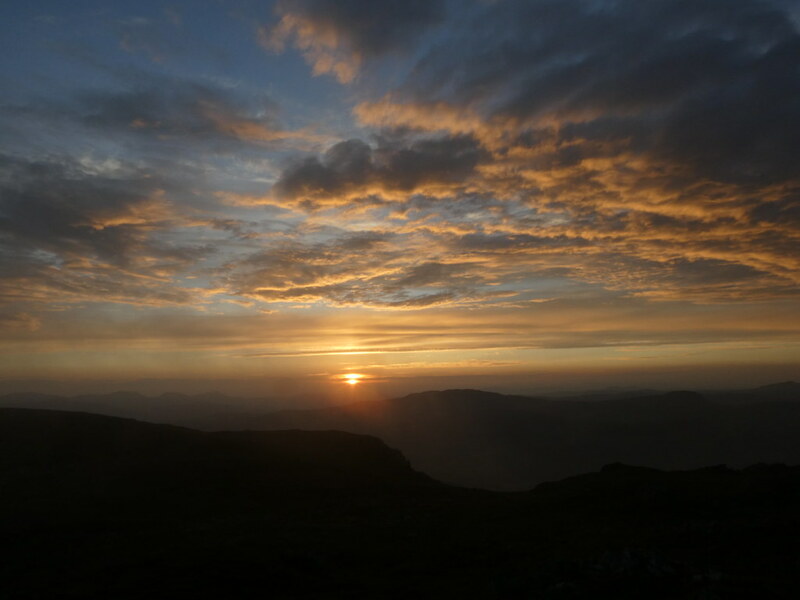 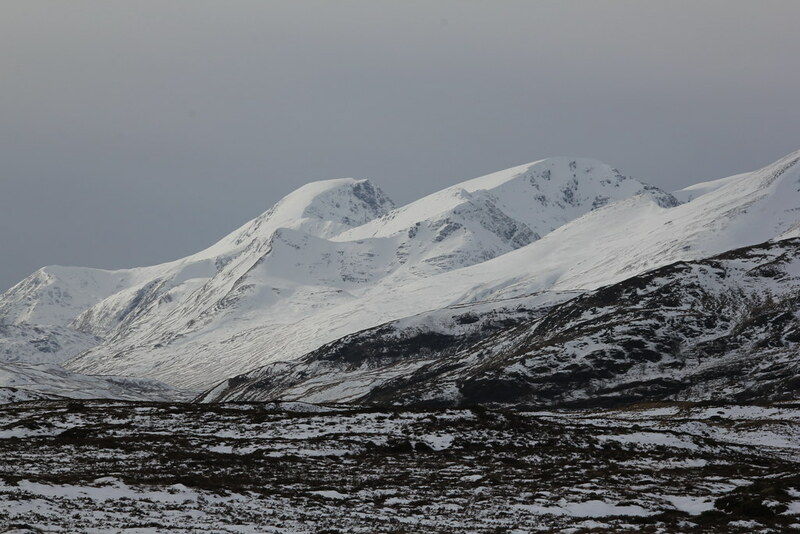 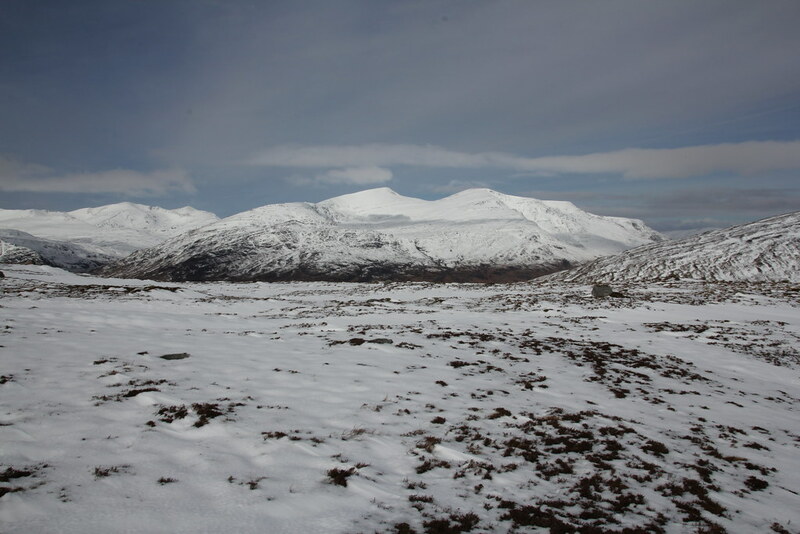 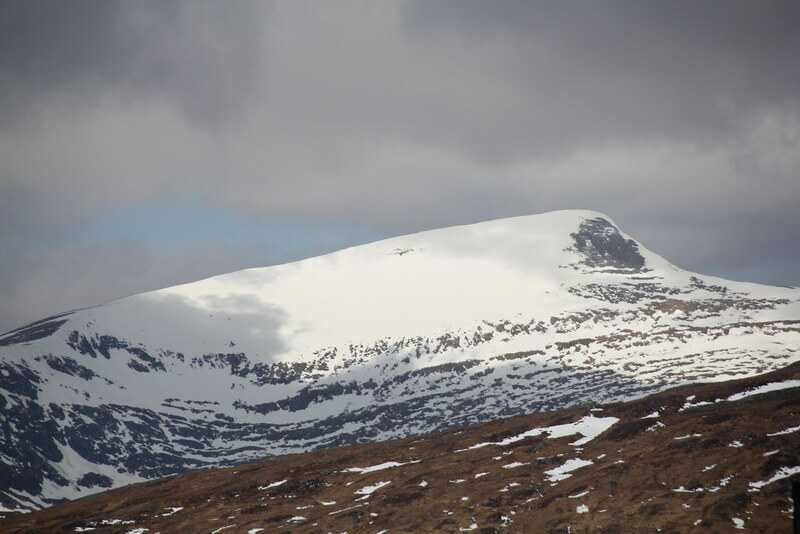 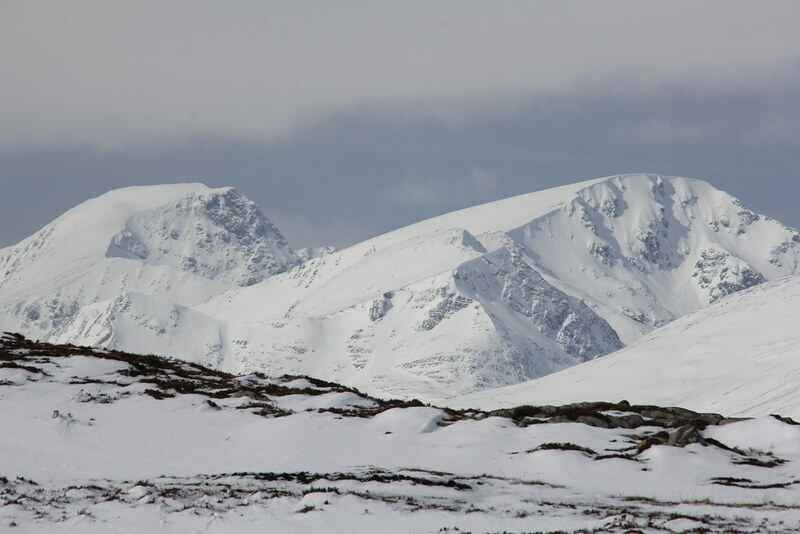 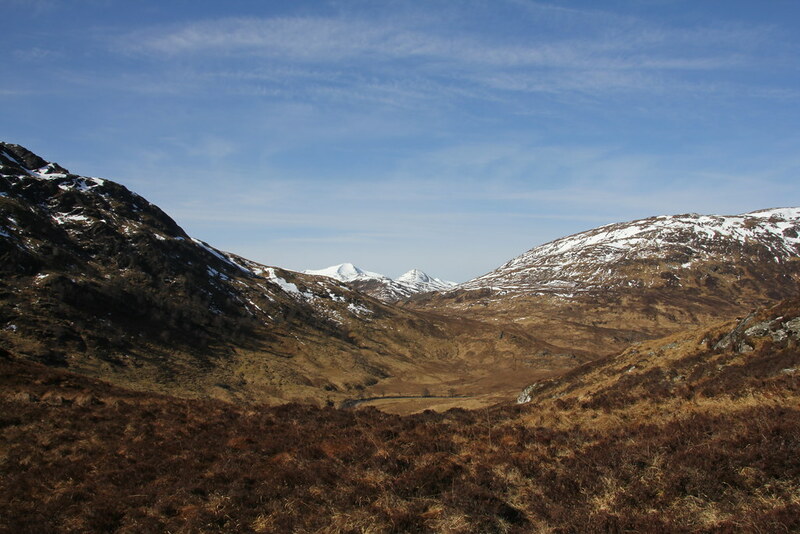 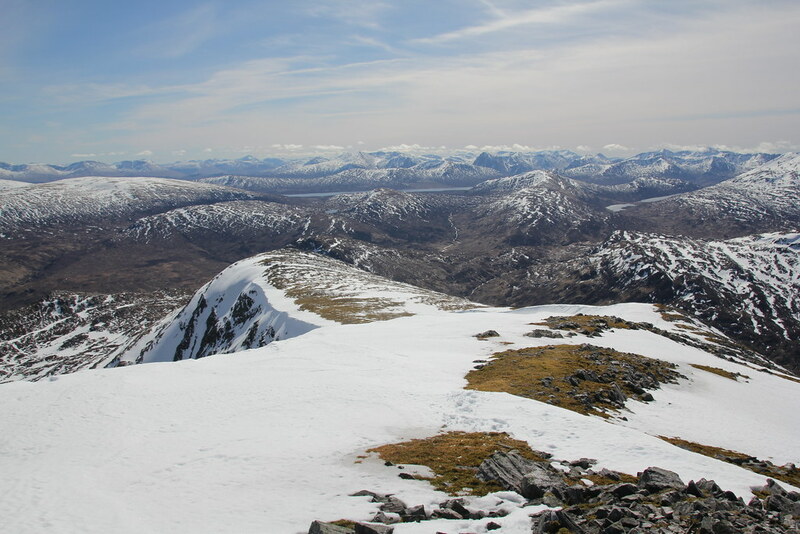 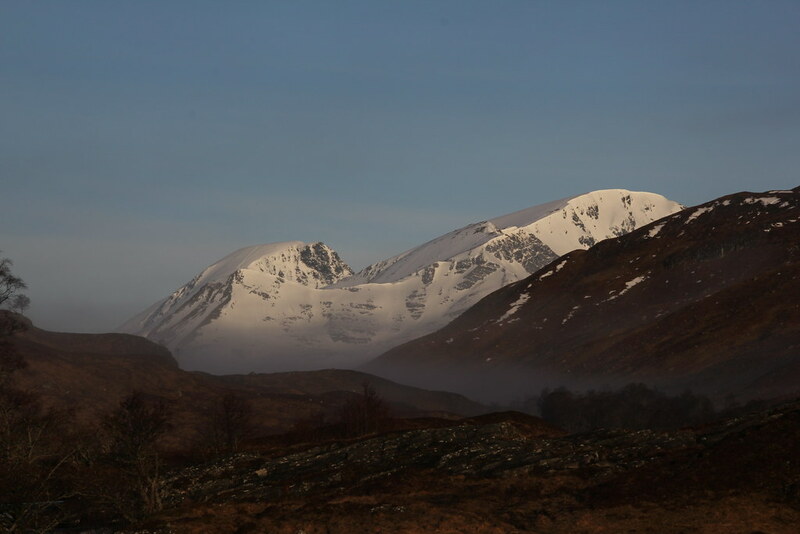 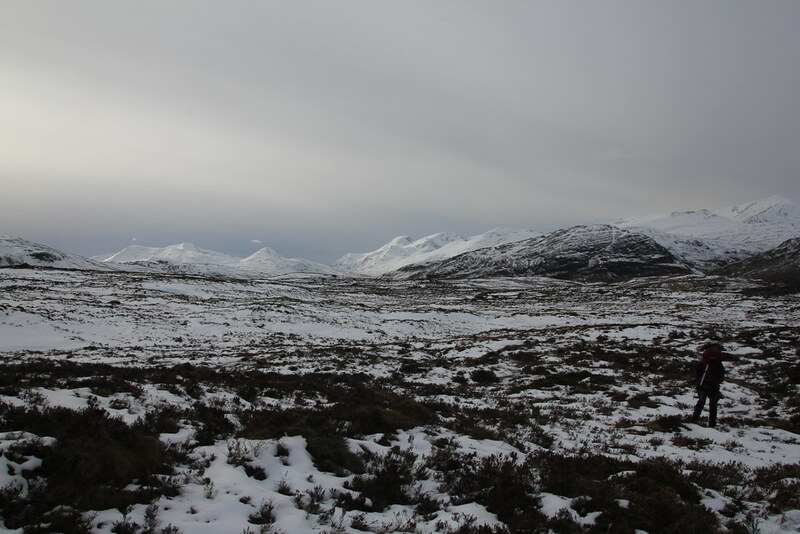 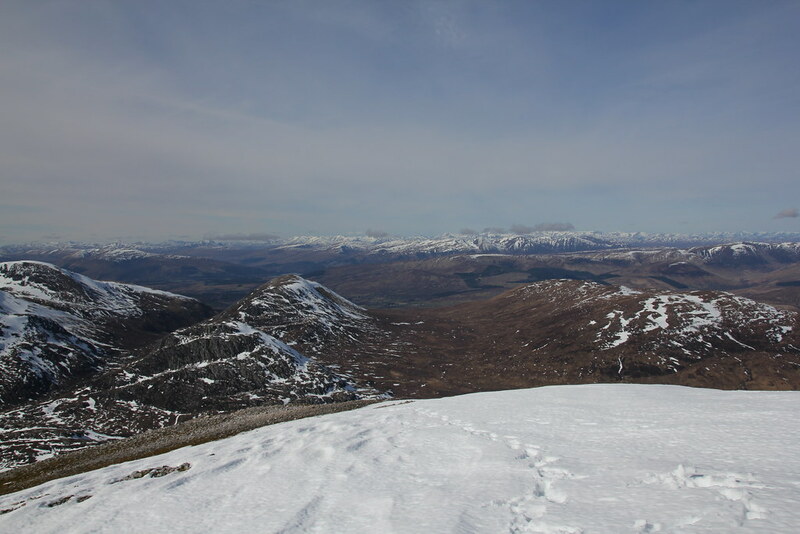 The most dense collection of high mountains in the UK in Lochaber! 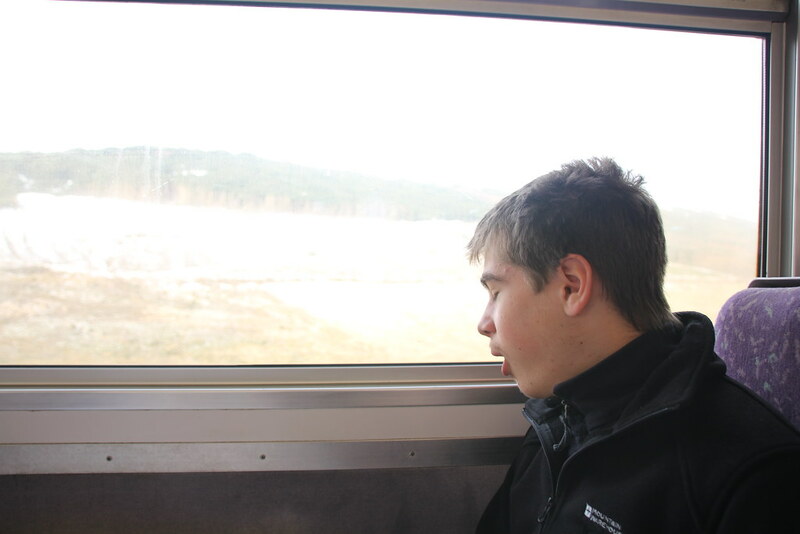 The trip had the added bonus of kicking off with a train ride. 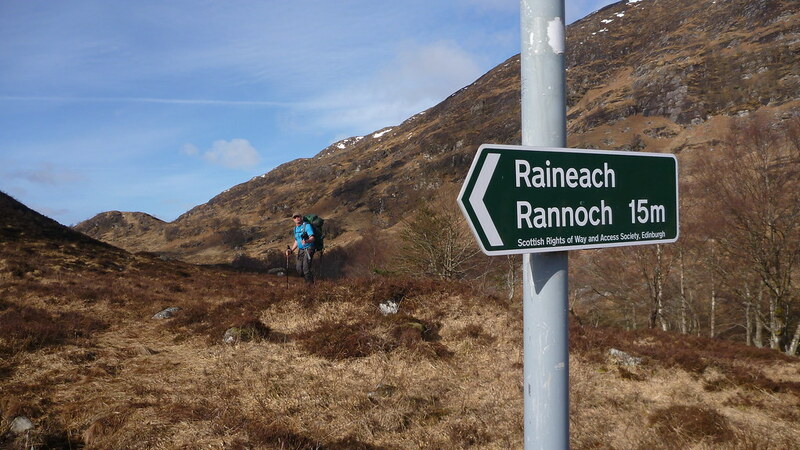 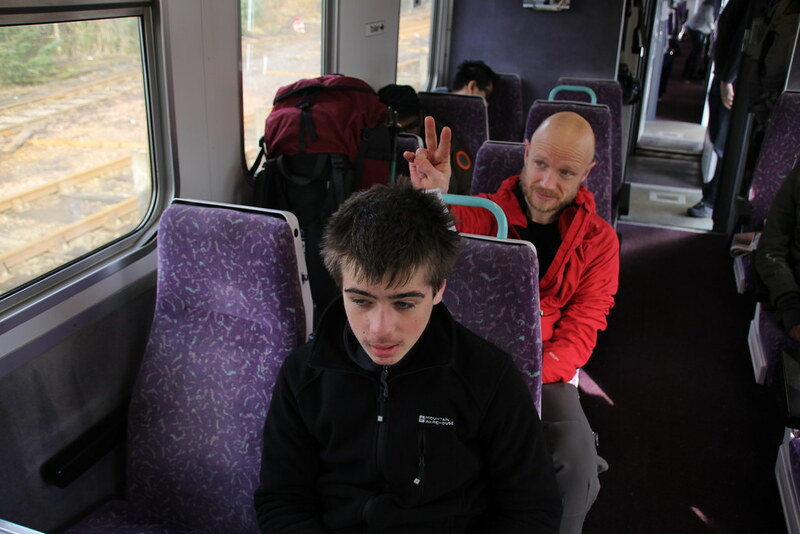 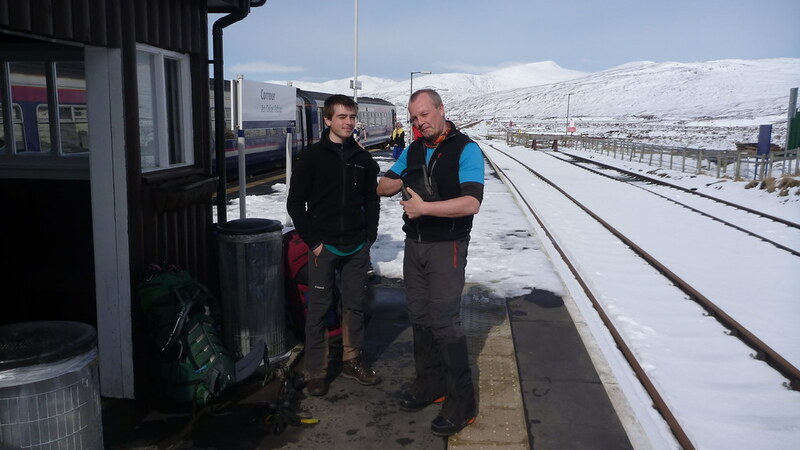 Our route was based on a start and finish at Corrour Station giving us a nice hour to chill out and enjoy the ride from Crianlarich. 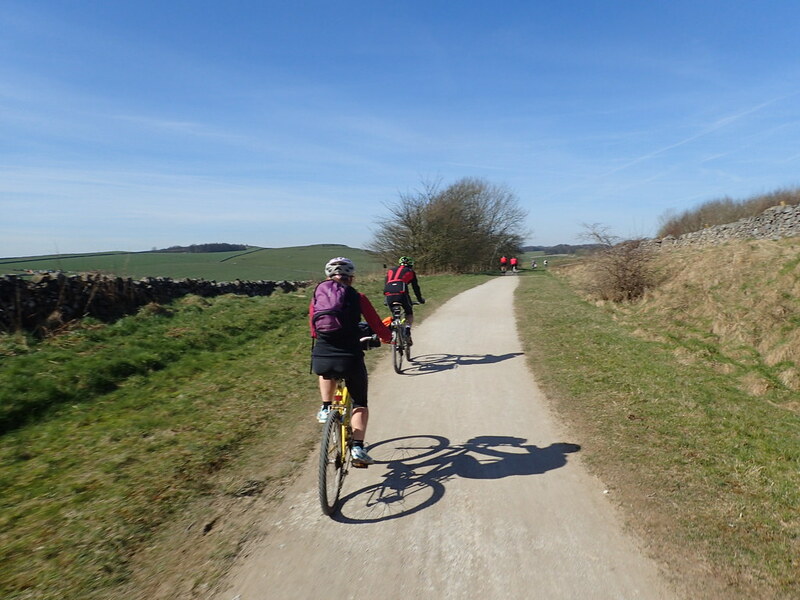 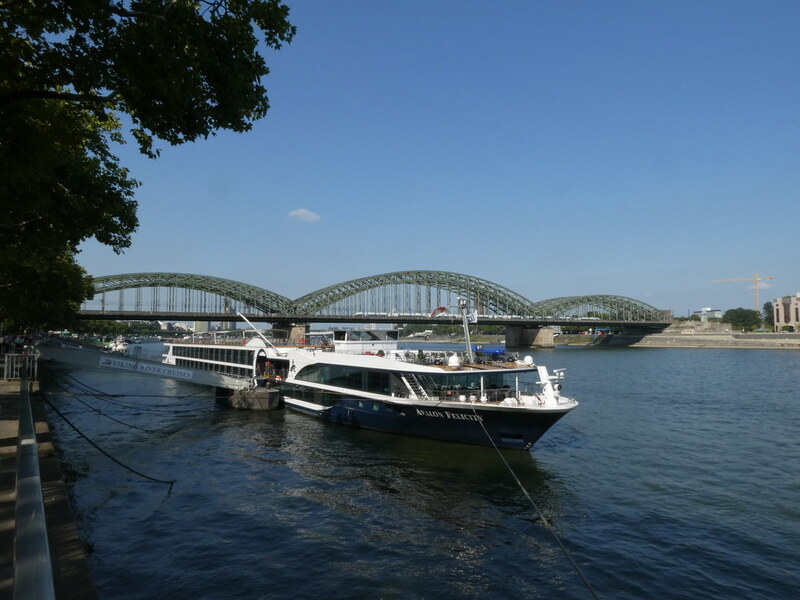 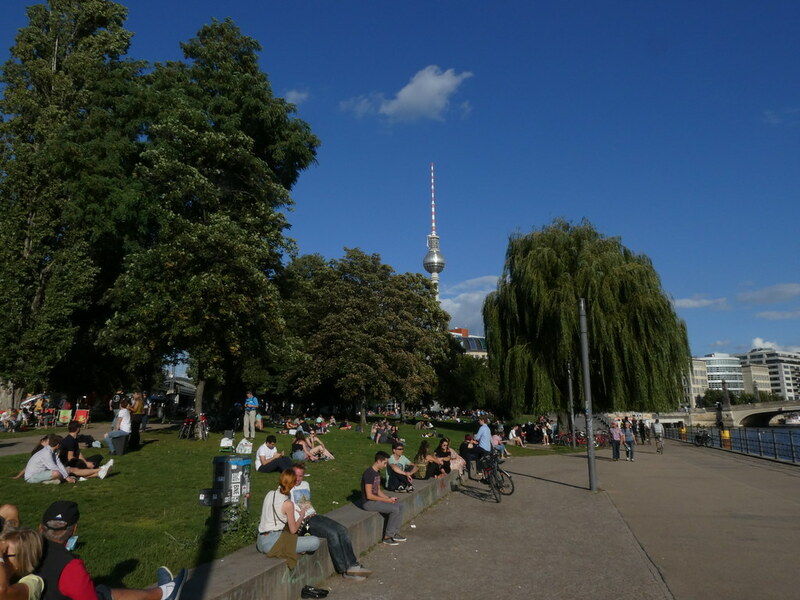 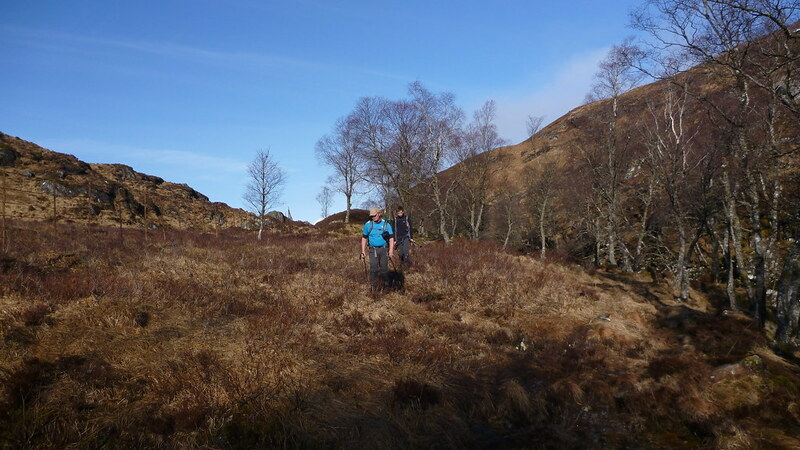 The weather in preceding few days had been appalling but today it was glorious. 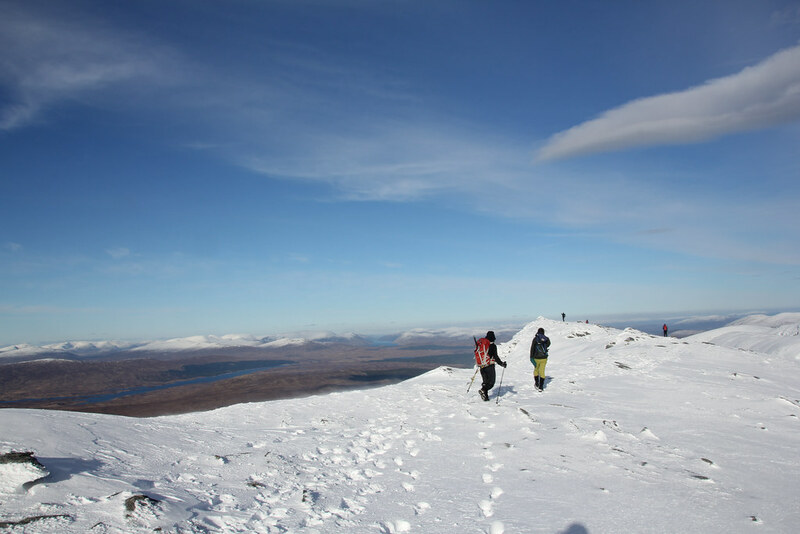 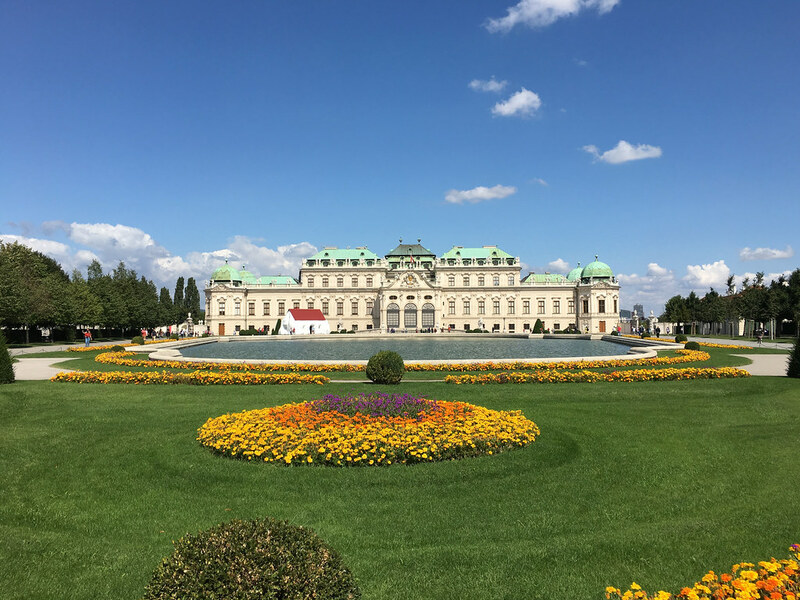 Blue skies and snow-capped peaks. 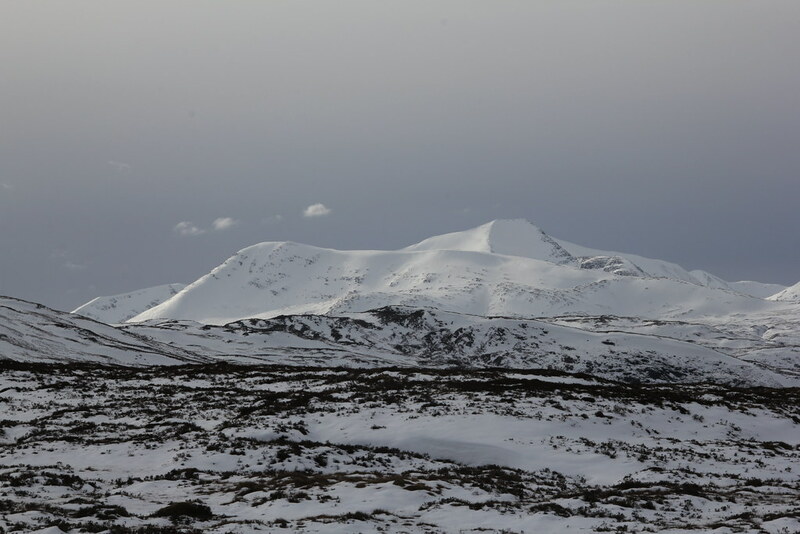 The train ride was spectacular with the Southern Highlands looking majestic and a little daunting for TJS. 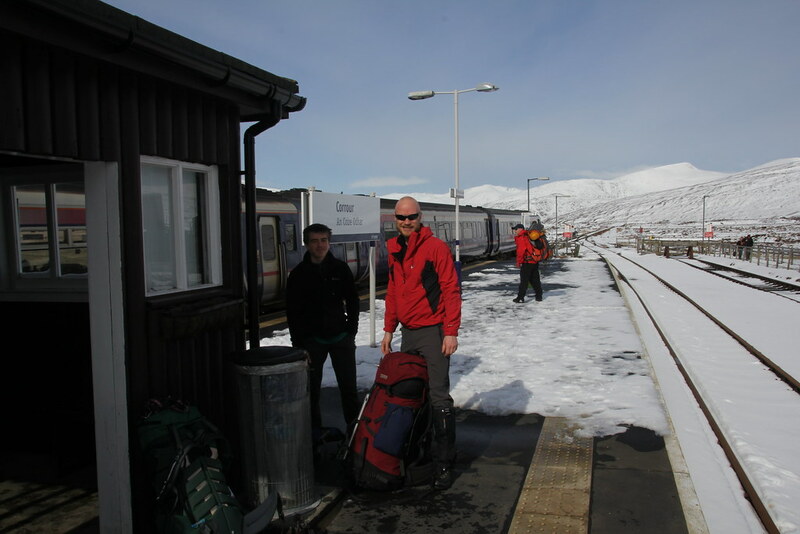 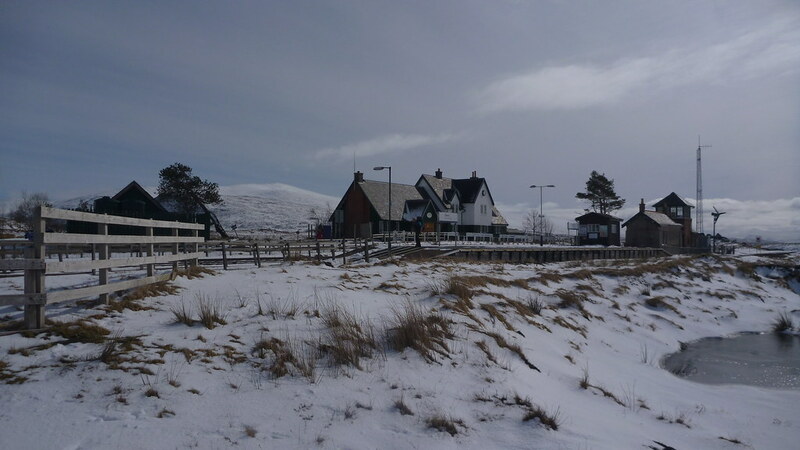 We arrived at Corrour and found snow lying right down at the station and on the platform. 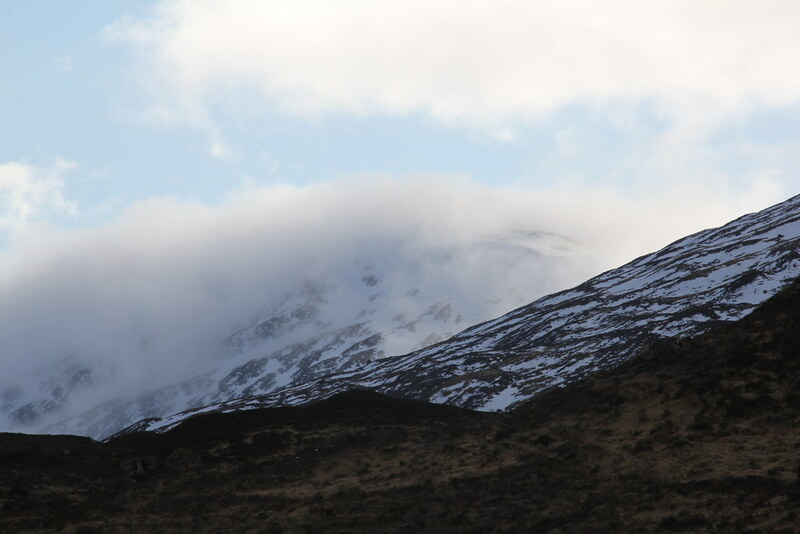 I’d expected snow but not this low down. 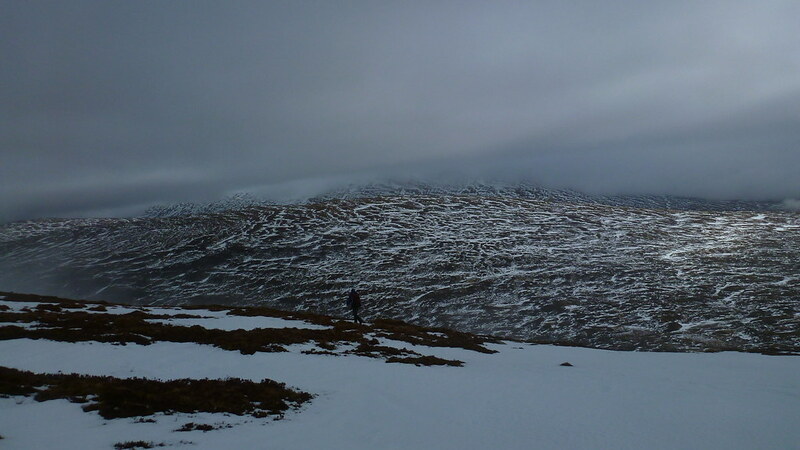 Daunting indeed. 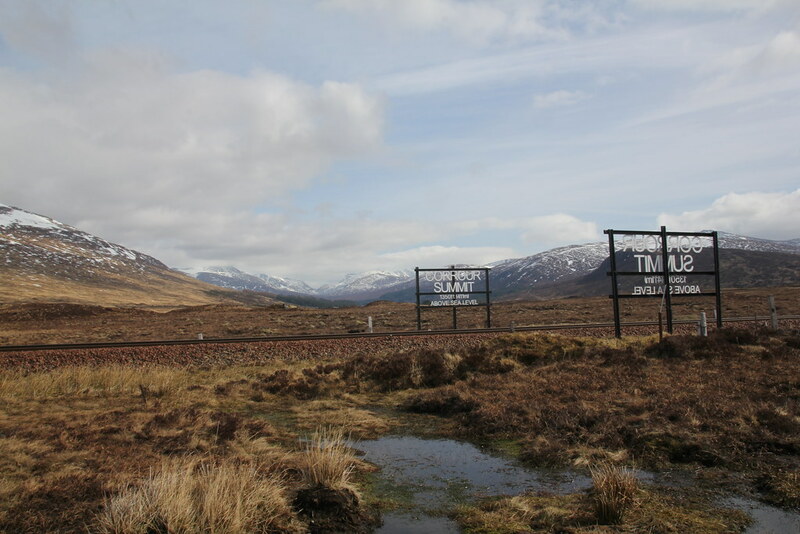 Corrour is an amazing place to exit a train. 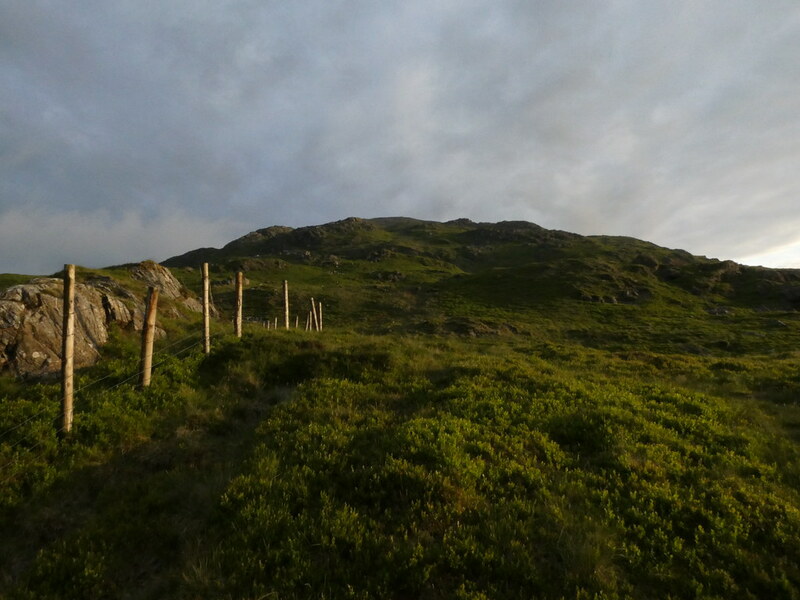 Right in the middle of the mountains with not a metalled road for miles. 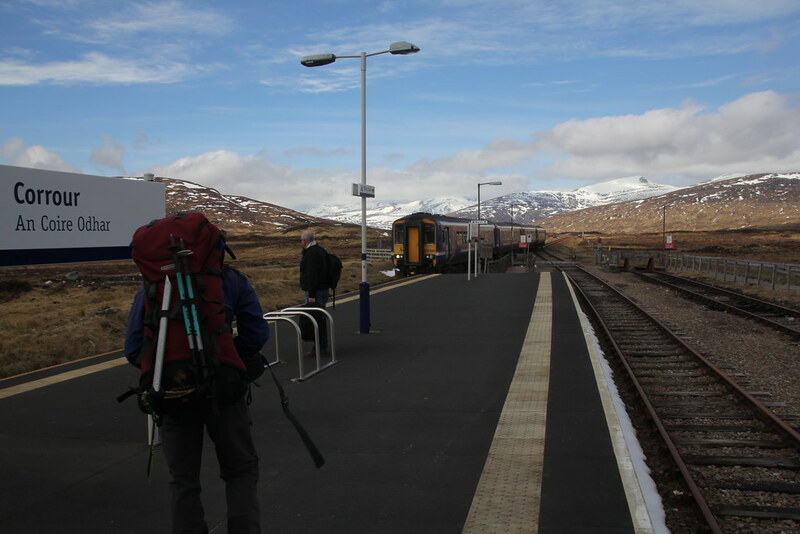 As the train disappears into the distance you feel abandoned and committed. 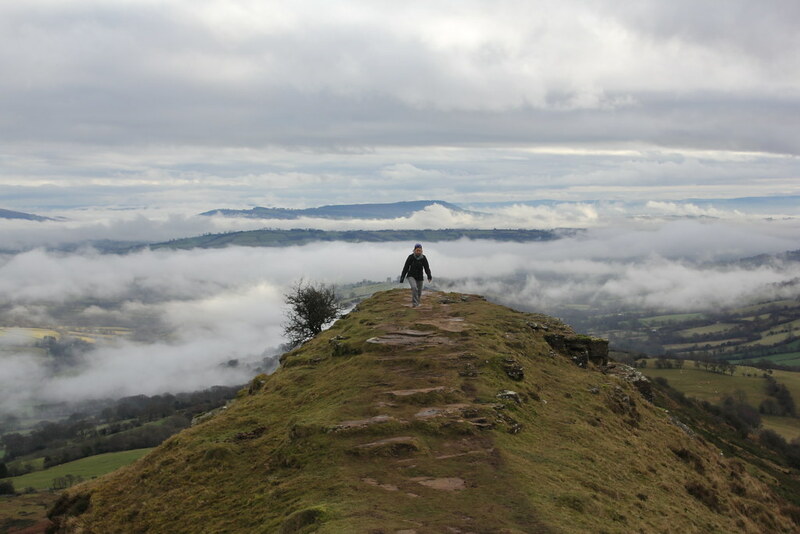 I felt daunted too! 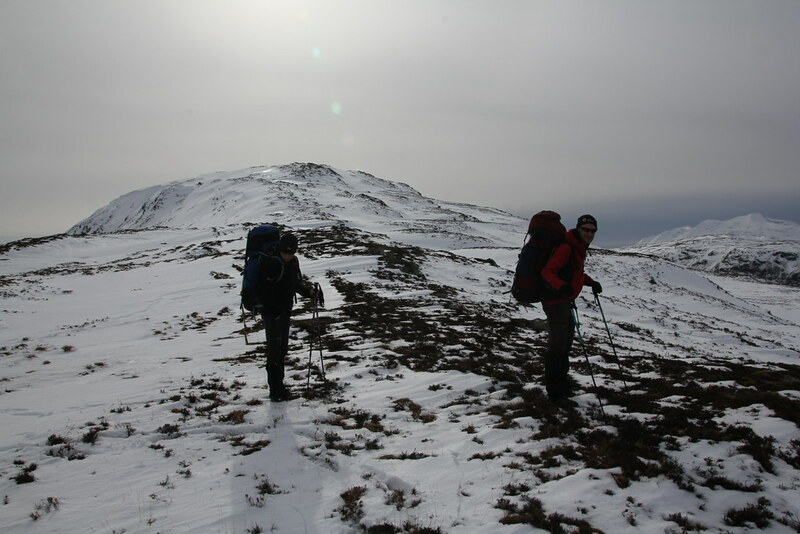 We hoisted packs and set off into the mountains. 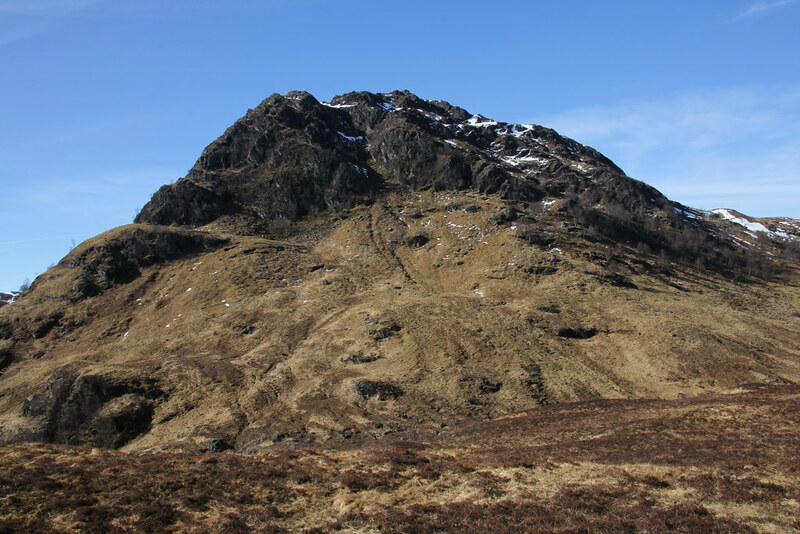 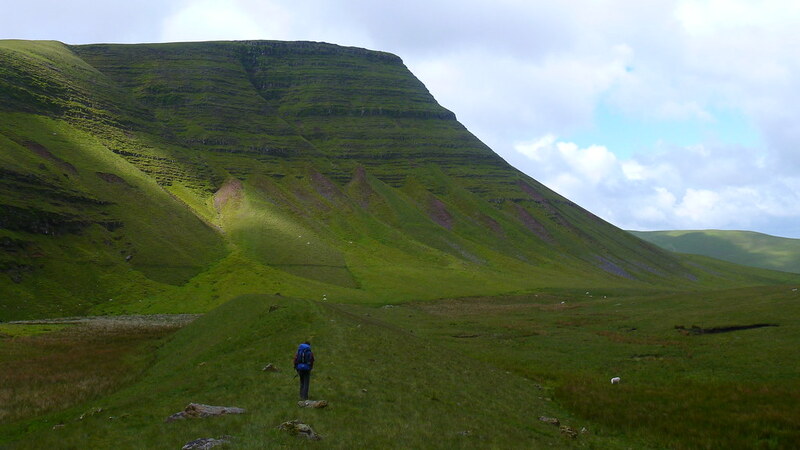 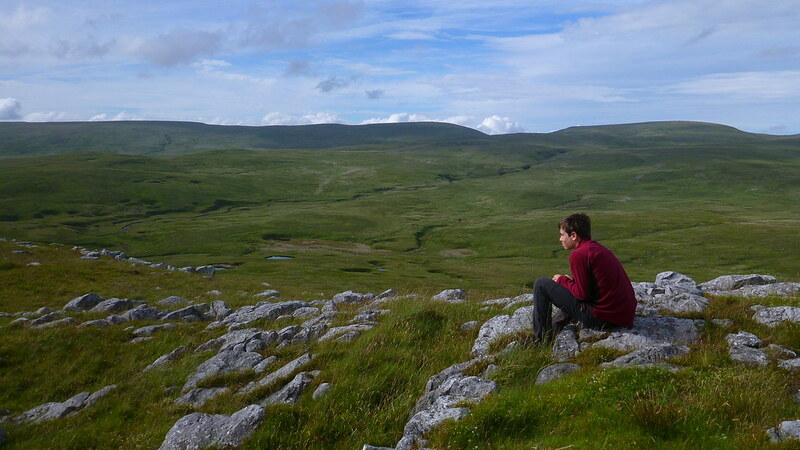 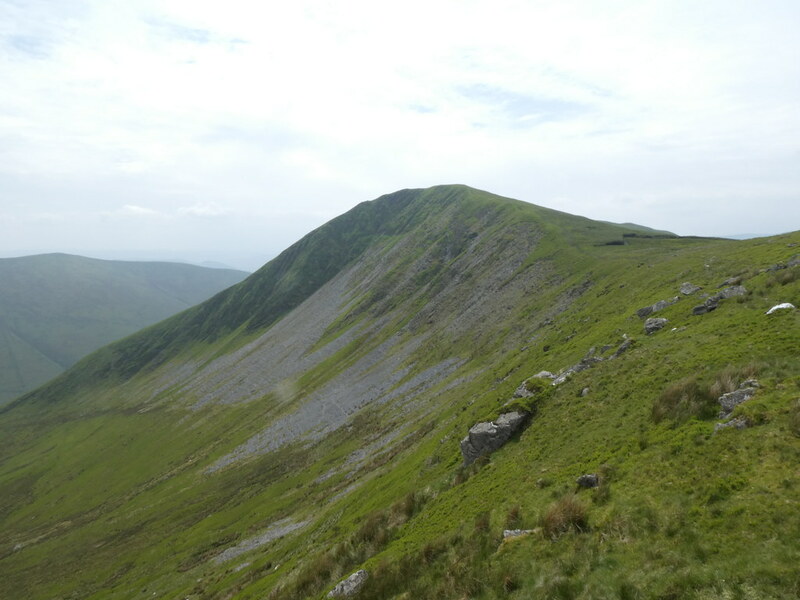 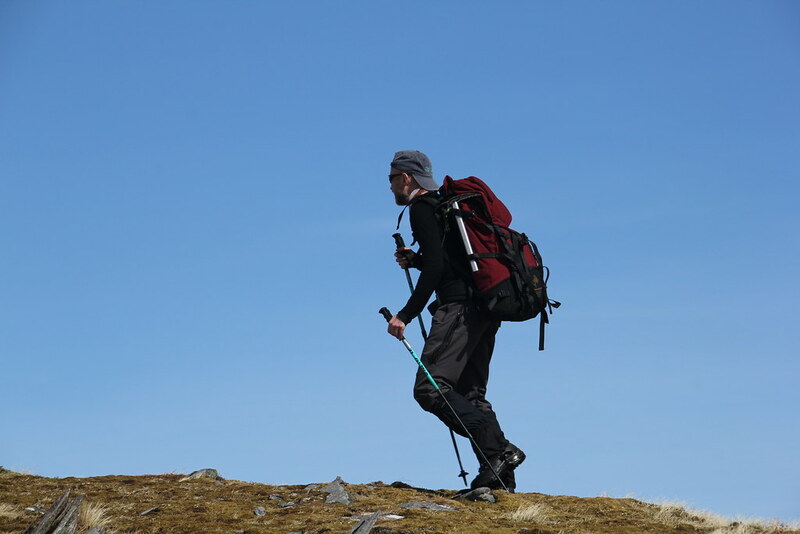 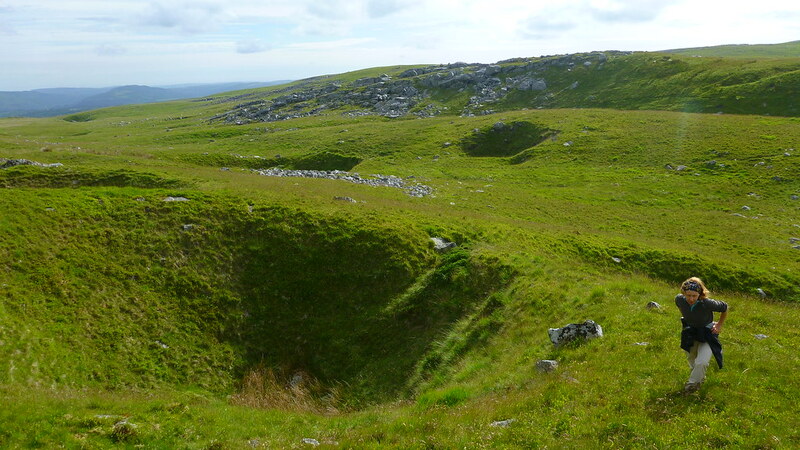 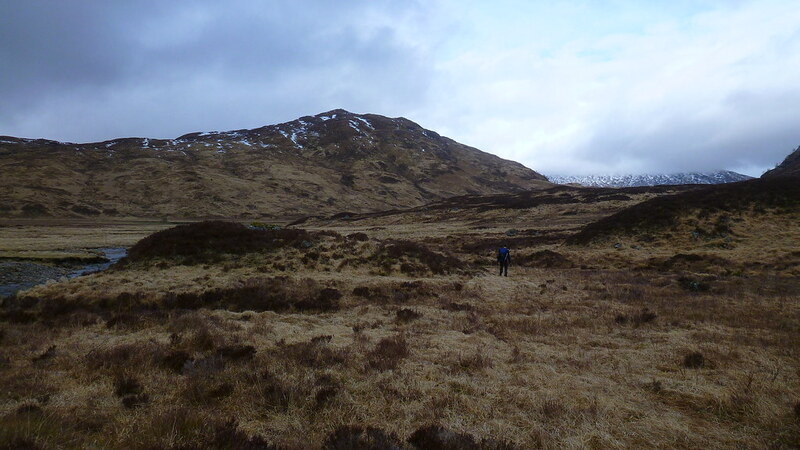 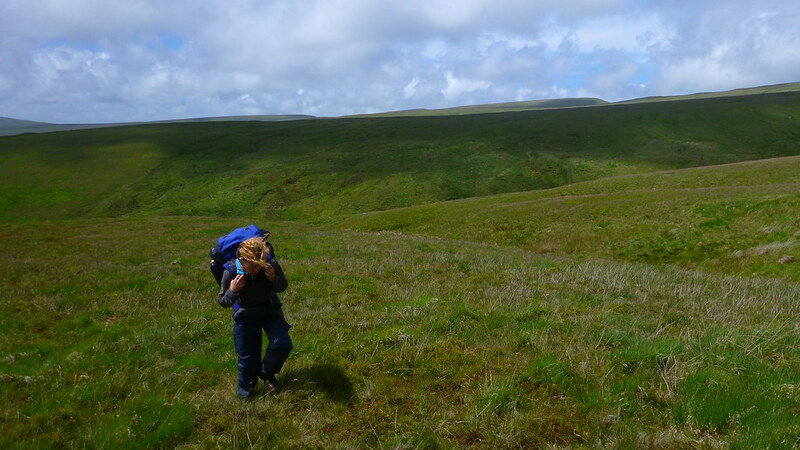 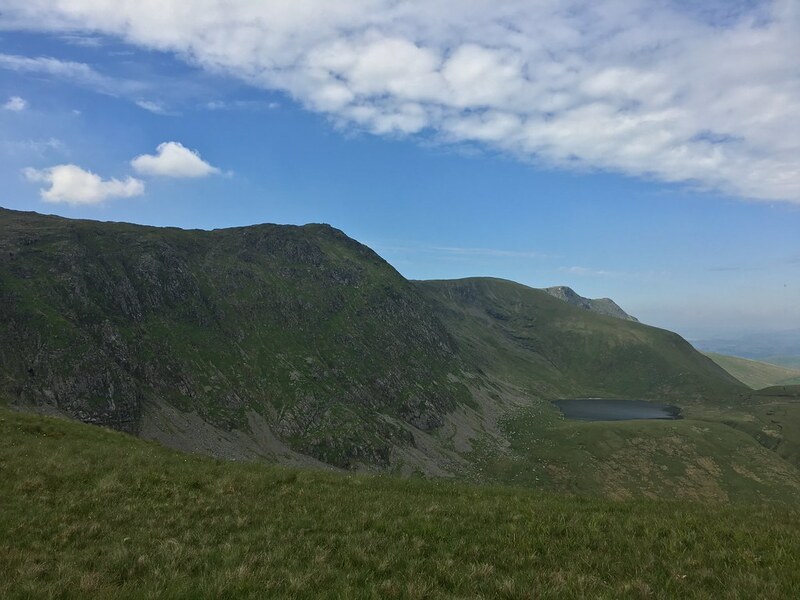 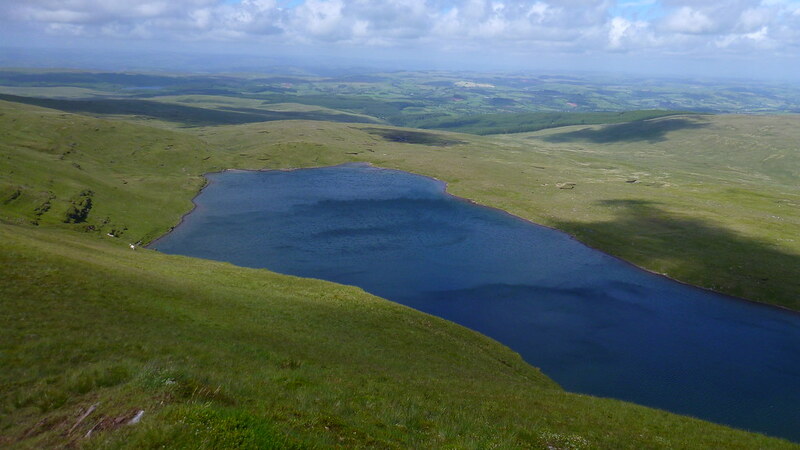 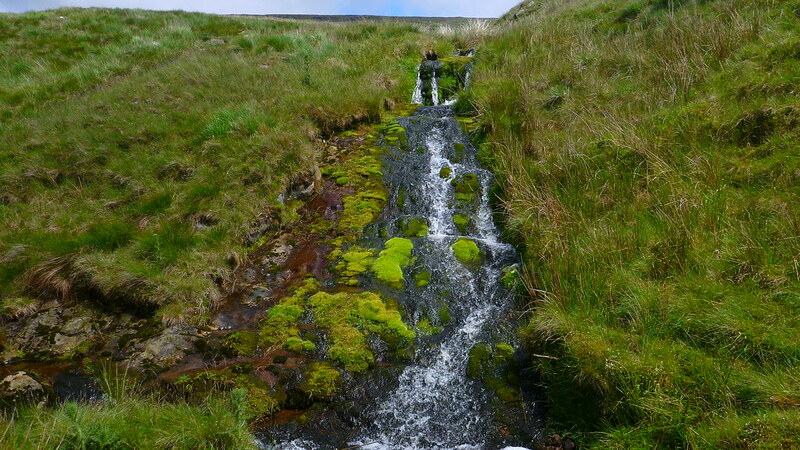 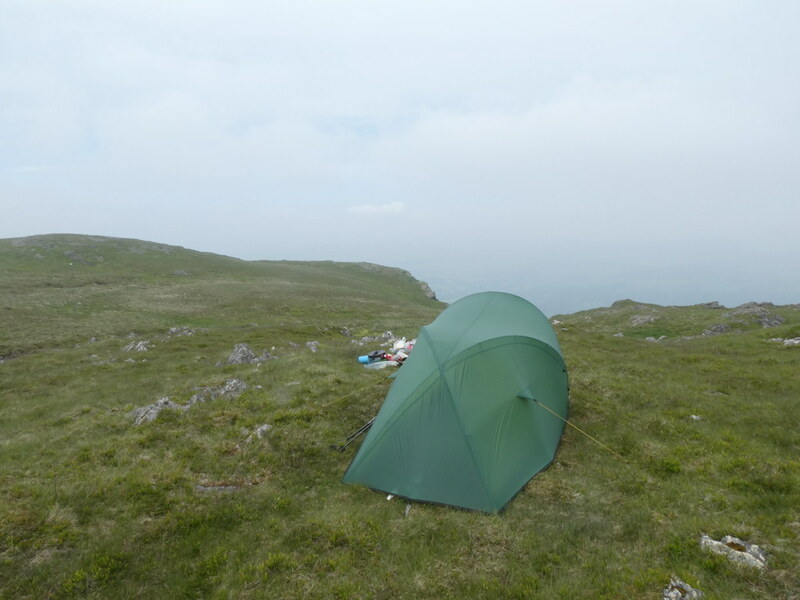 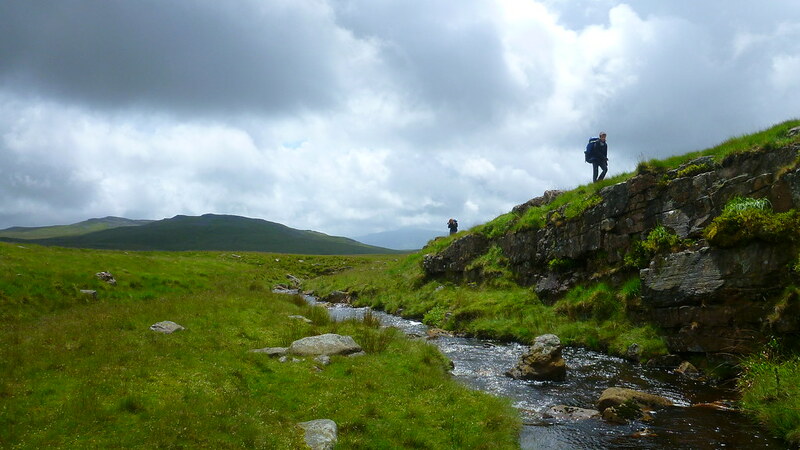 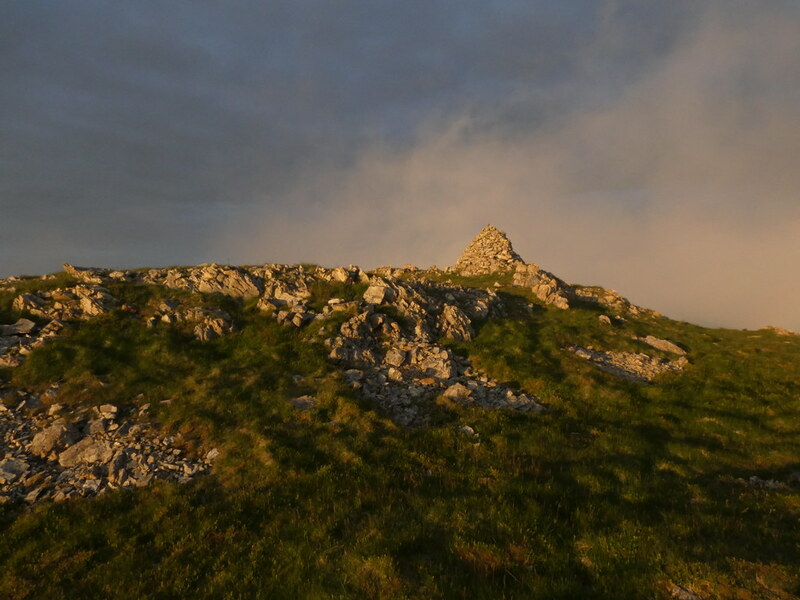 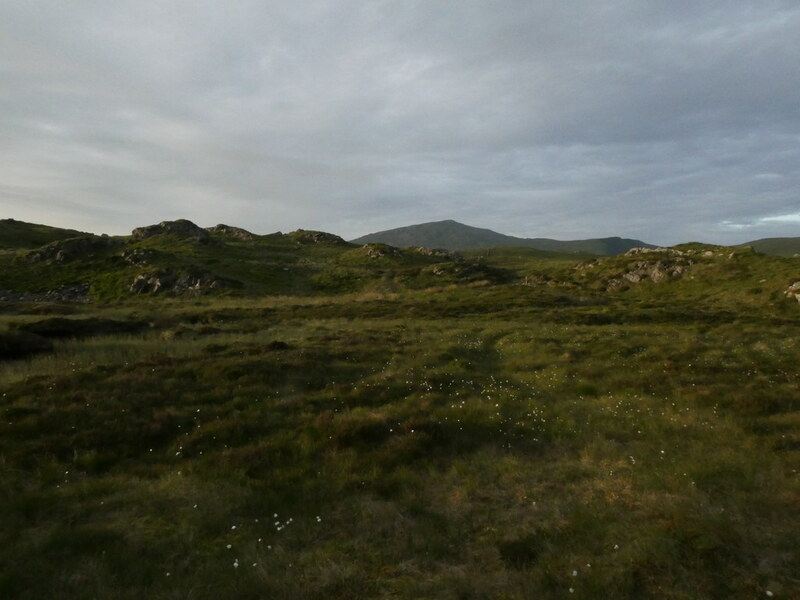 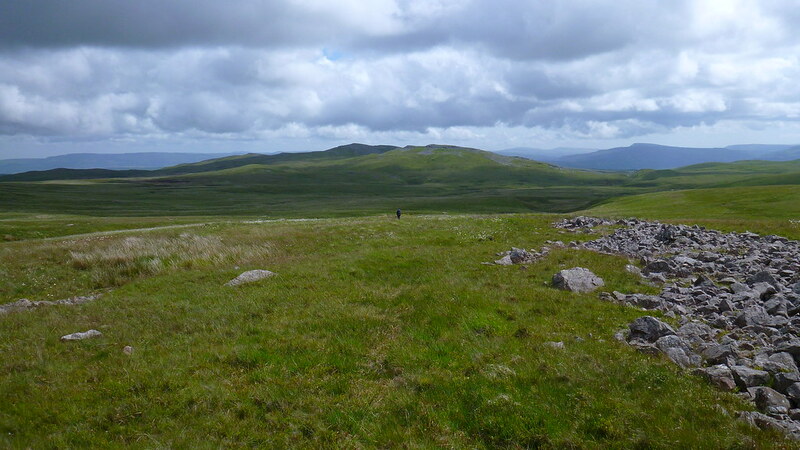 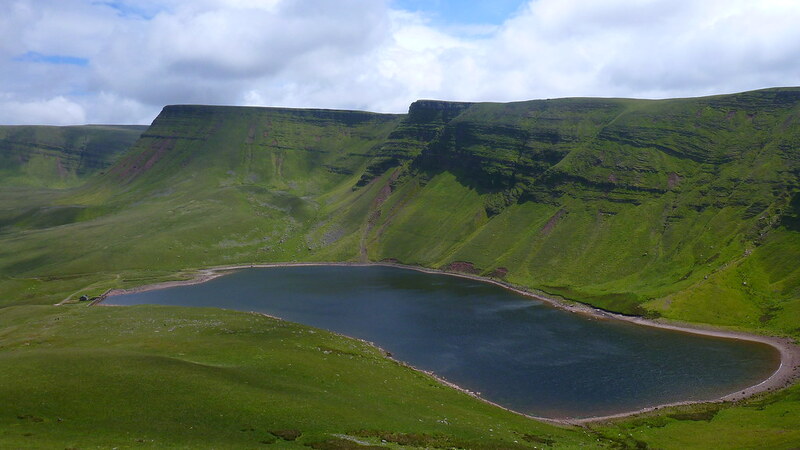 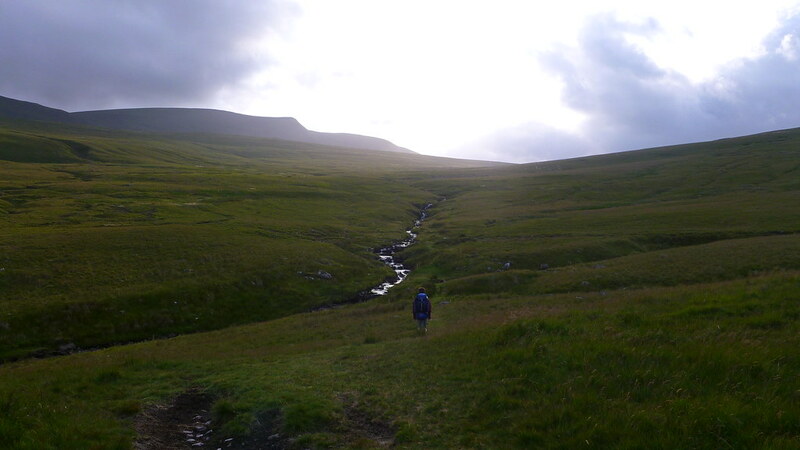 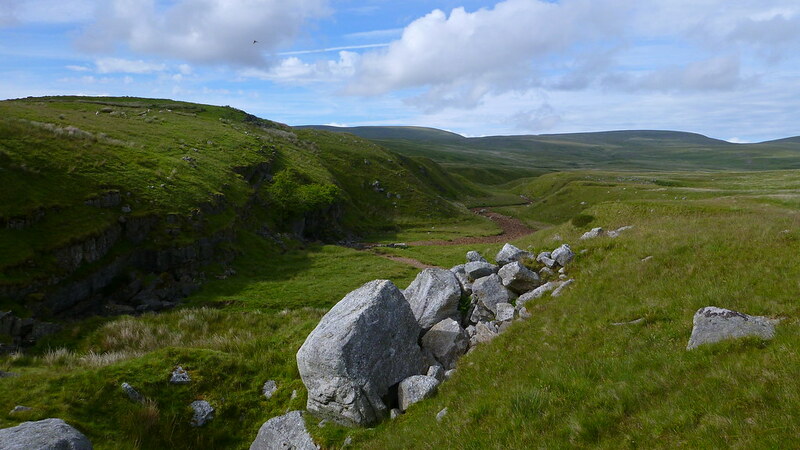 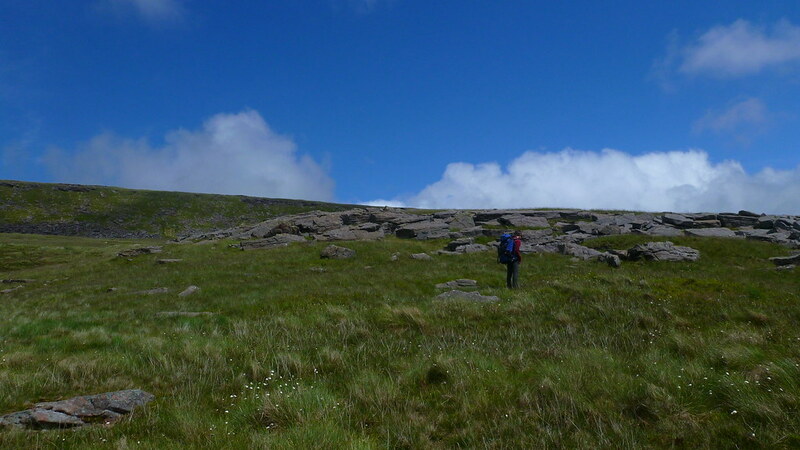 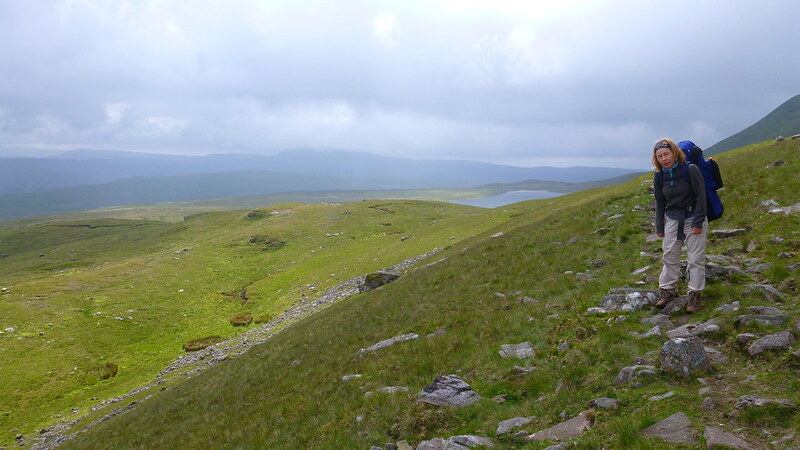 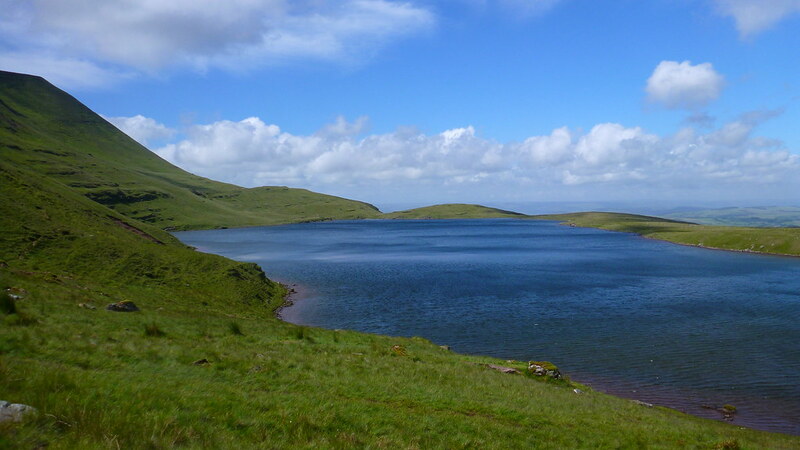 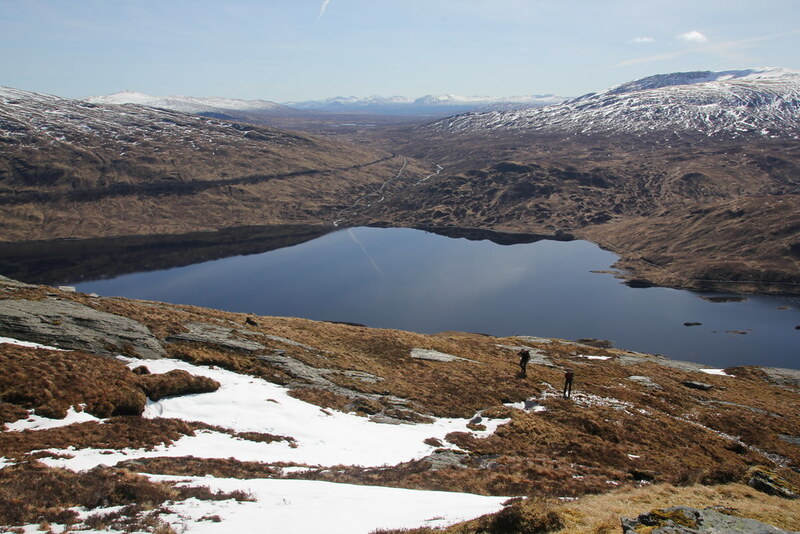 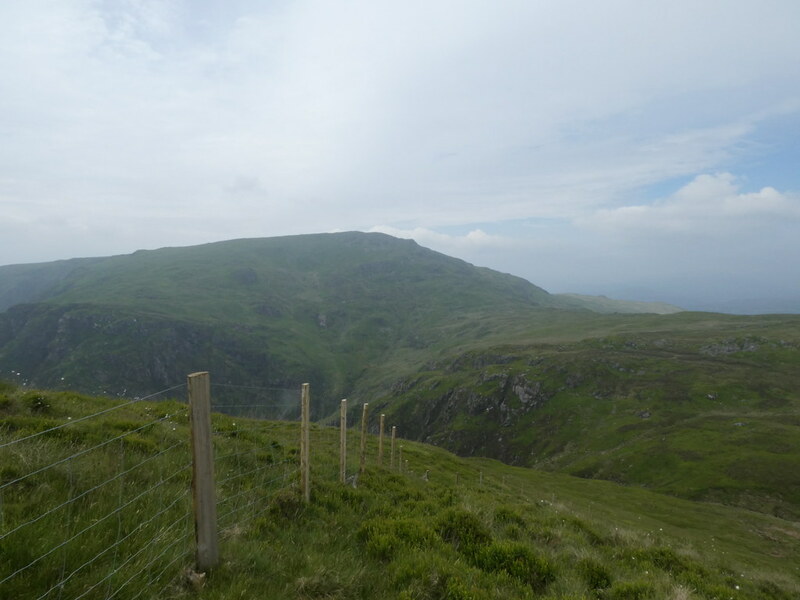 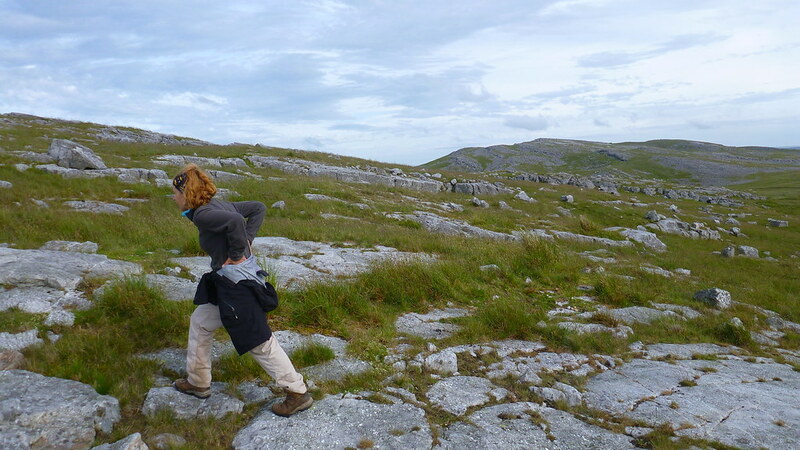 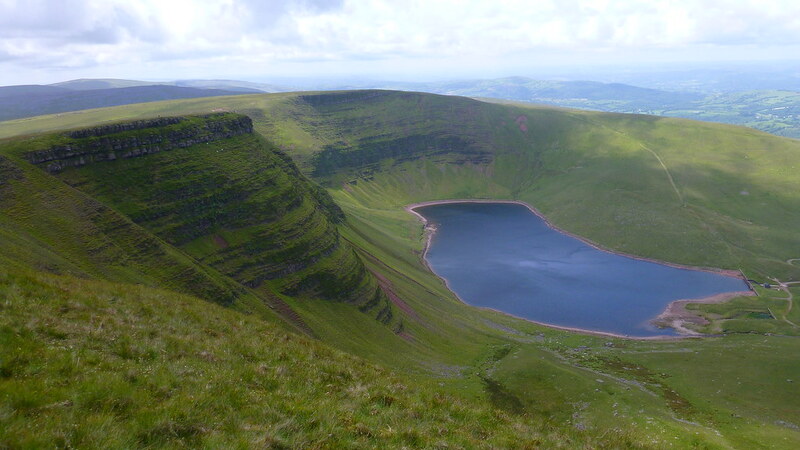 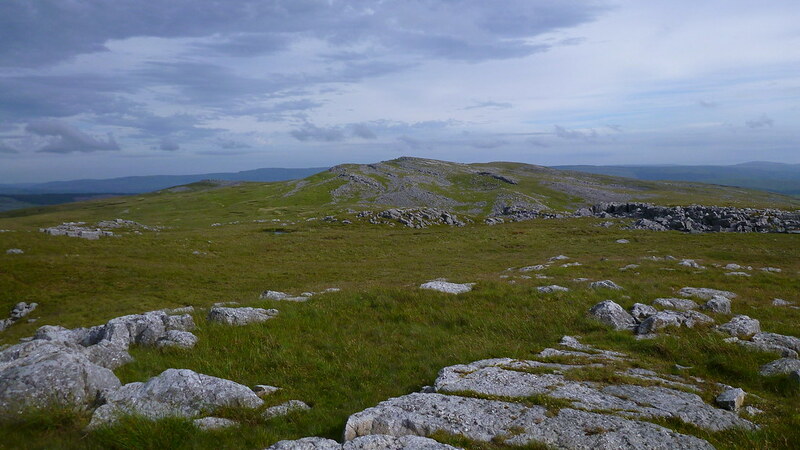 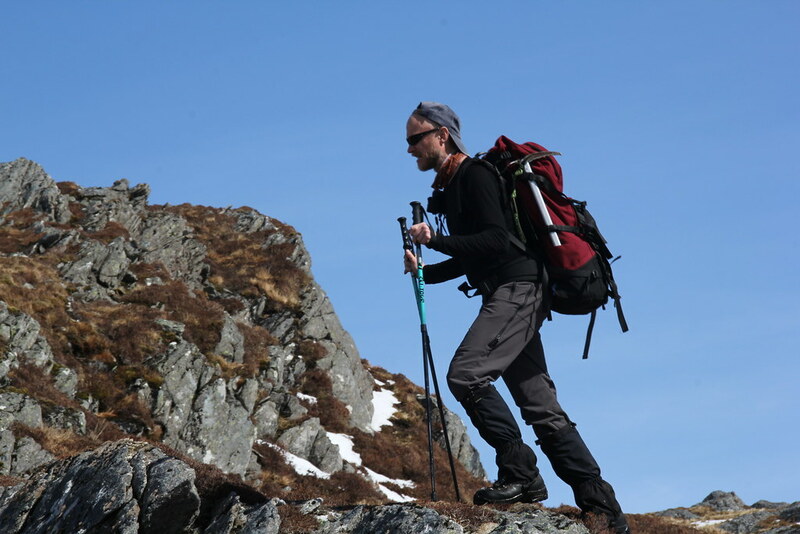 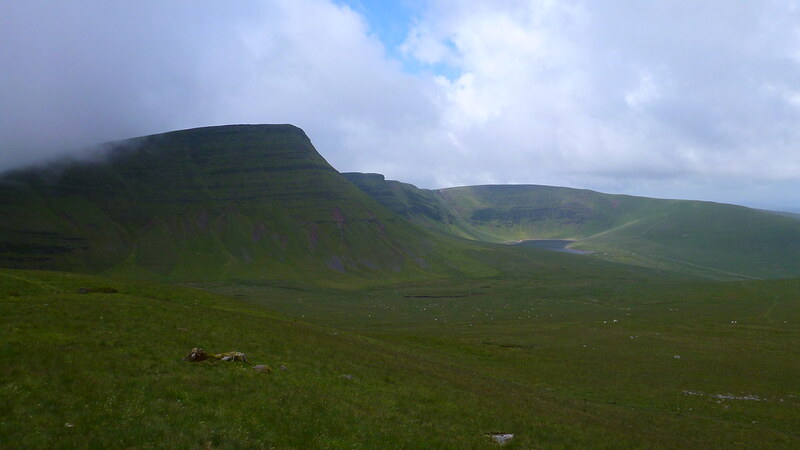 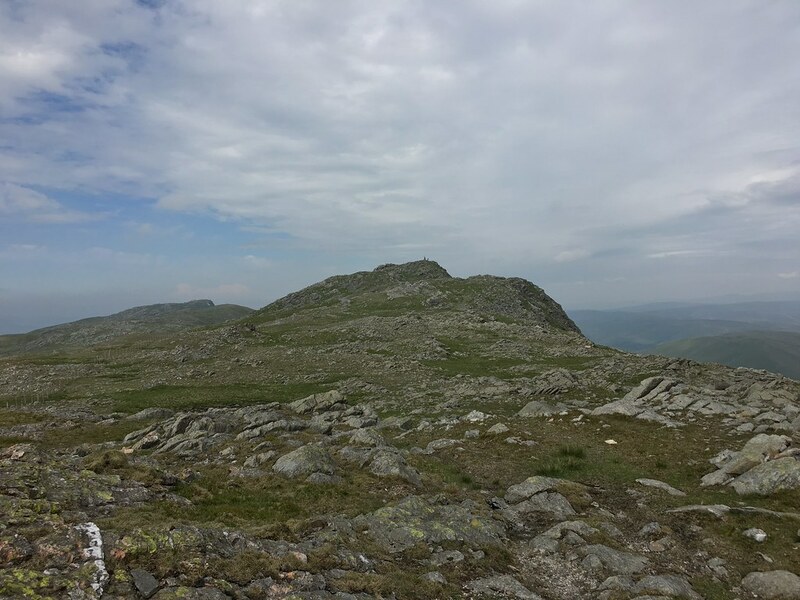 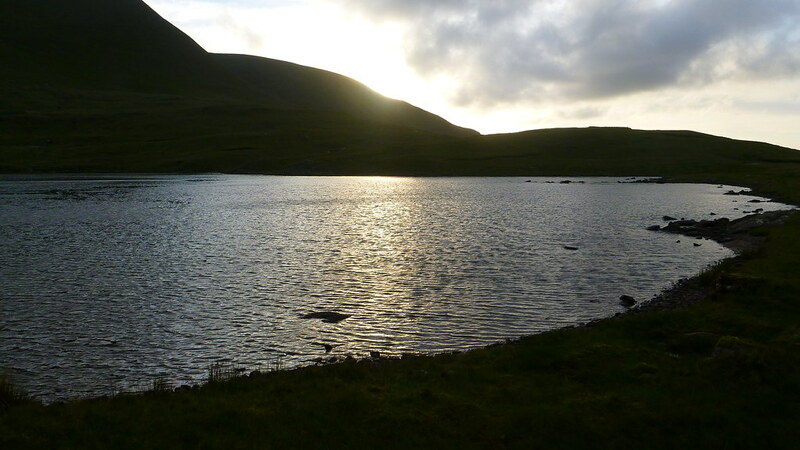 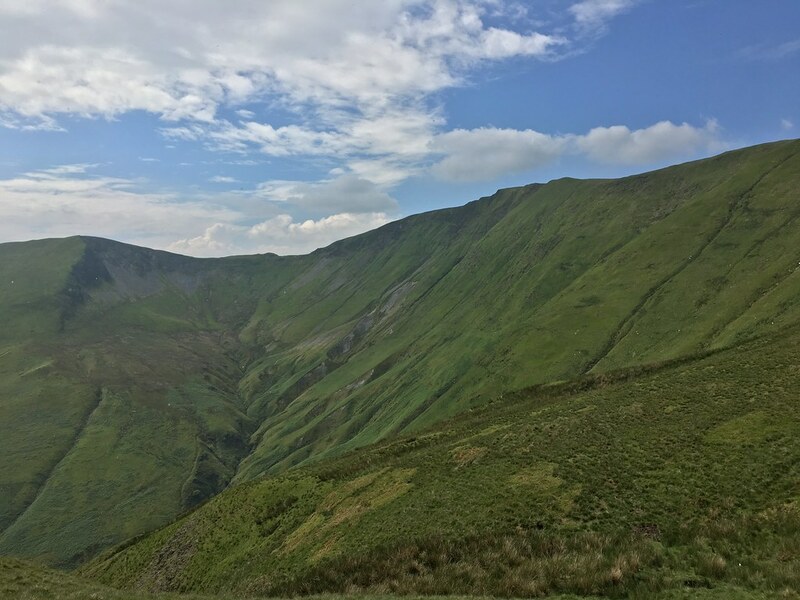 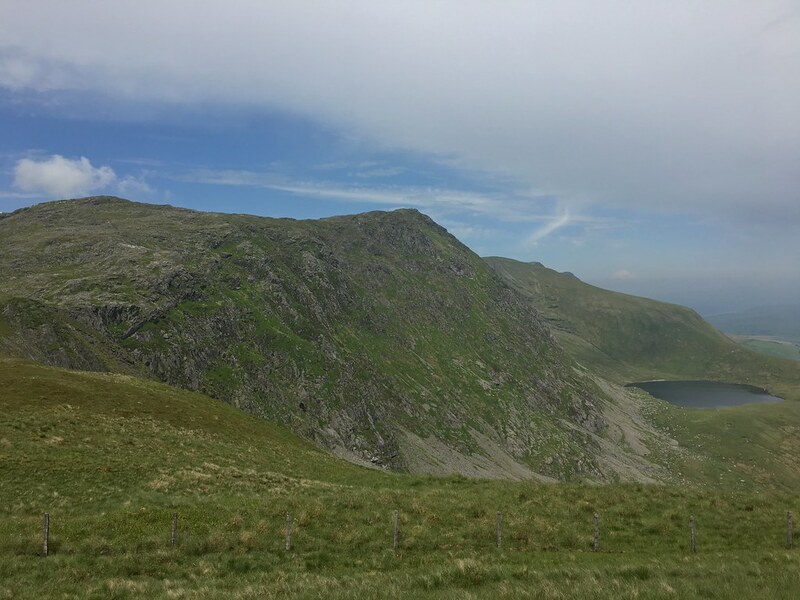 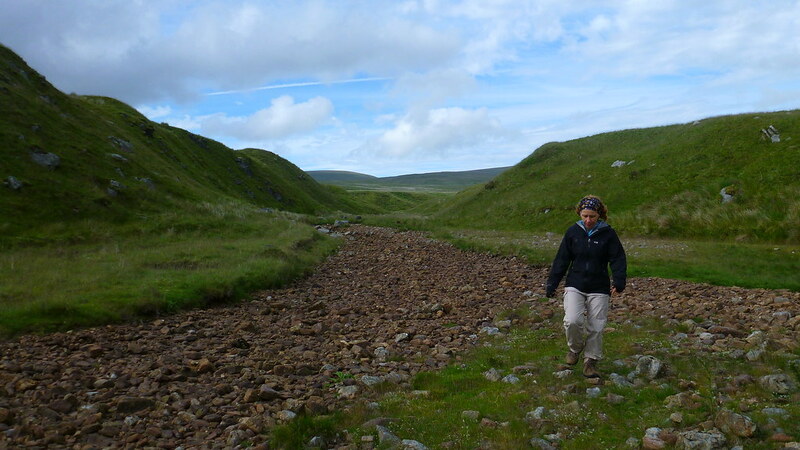 Our plan was to backpack over the very isolated and fine Corbett of Leum Uilleim. 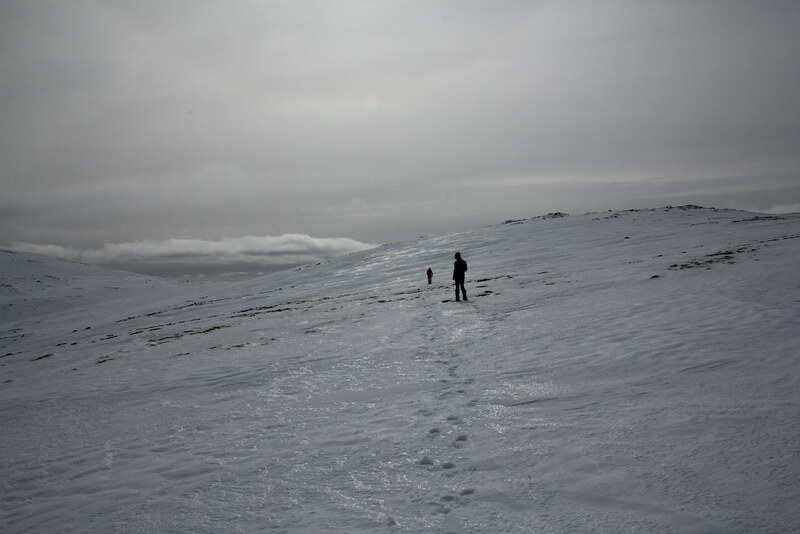 Immediately we were in deep unconsolidated and untrodden snow. 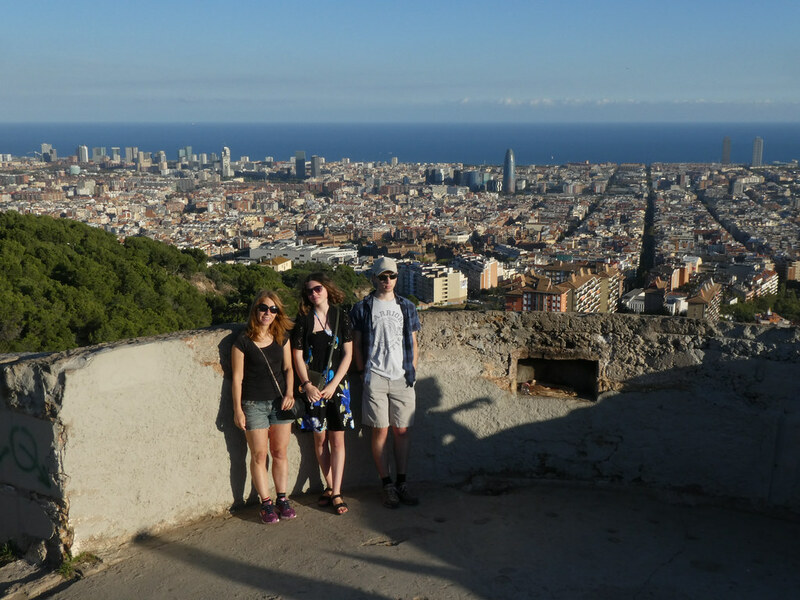 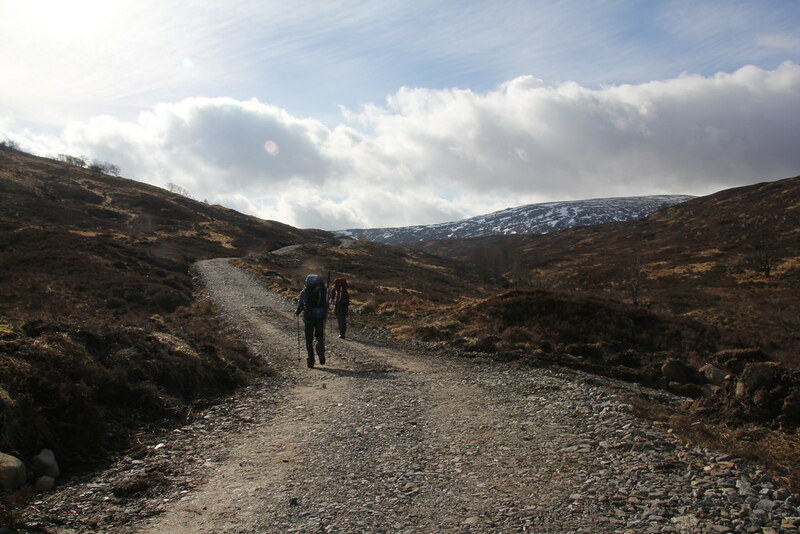 The views were magnificent but the going tough. 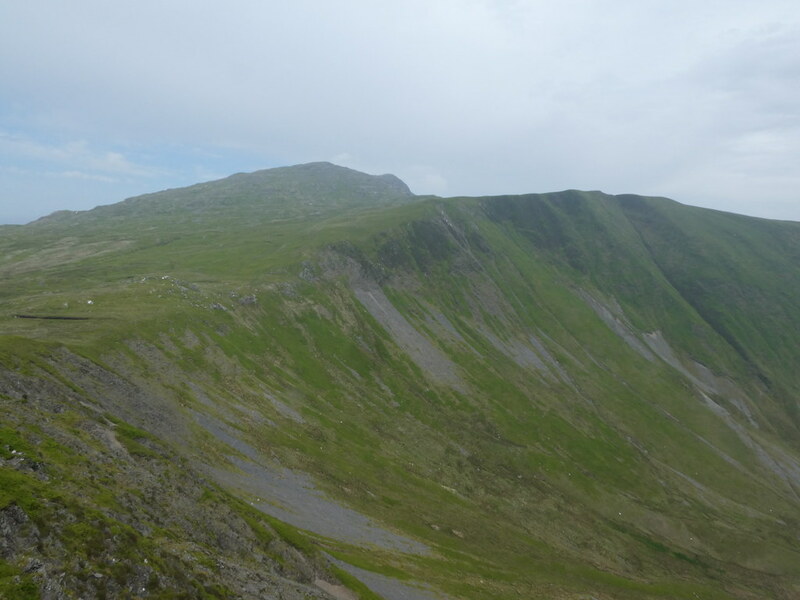 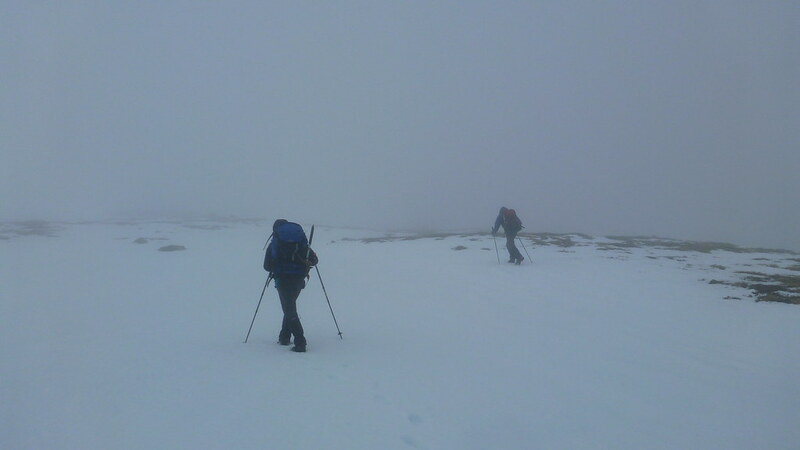 By the time we’d plodded up to the NE ridge at An Diollaid we were already feeling the strain. 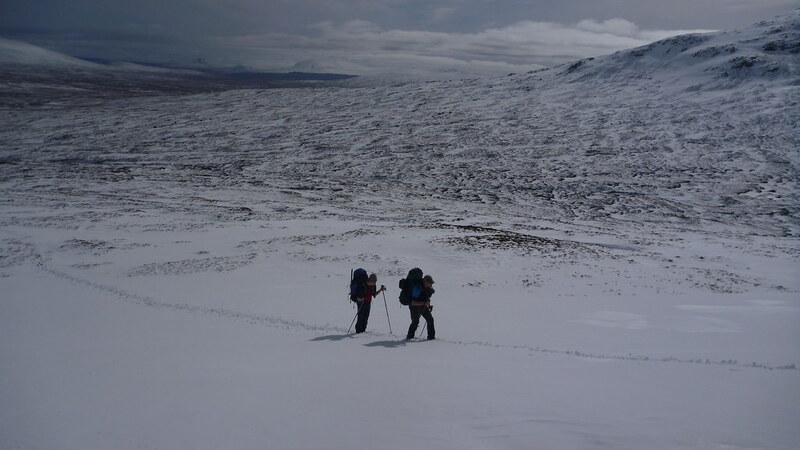 The snow cover was immense, huge fields of deep snow, hard going in places as you plopped through the crust from time to time. 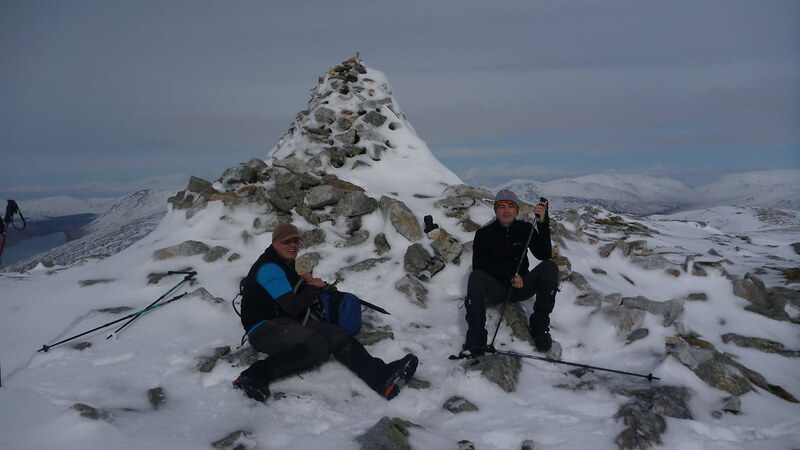 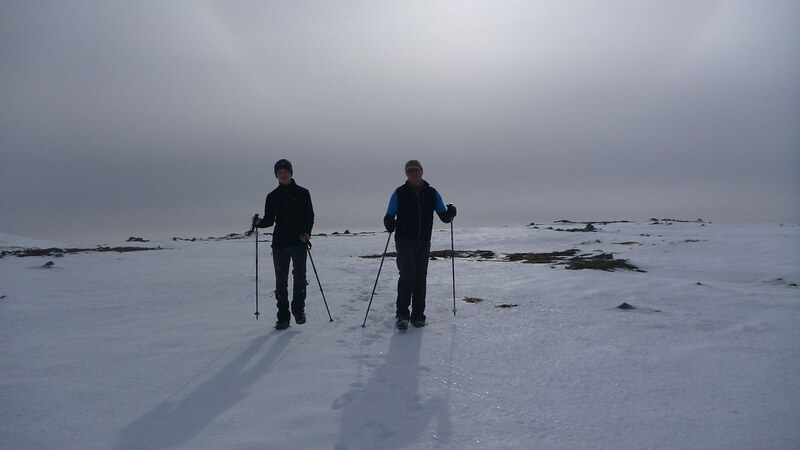 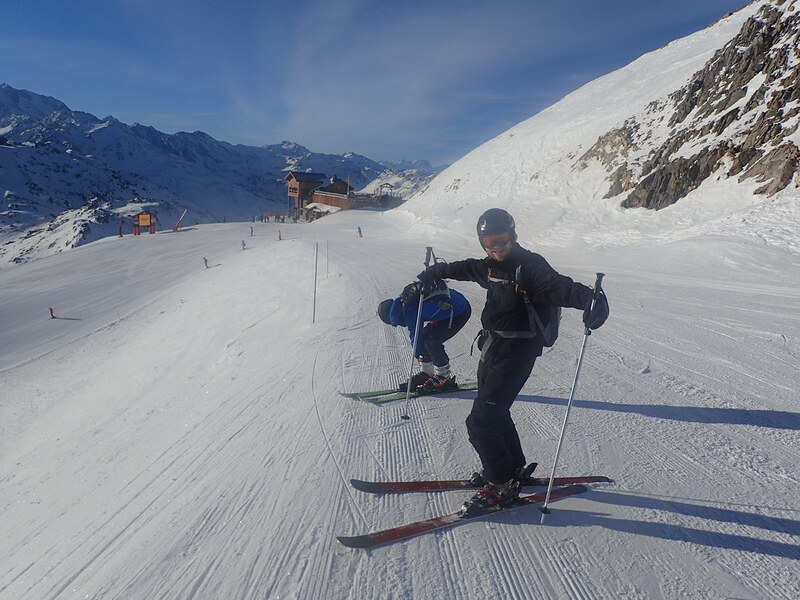 Both me and GM kept thinking how perfect the conditions were for ski touring! 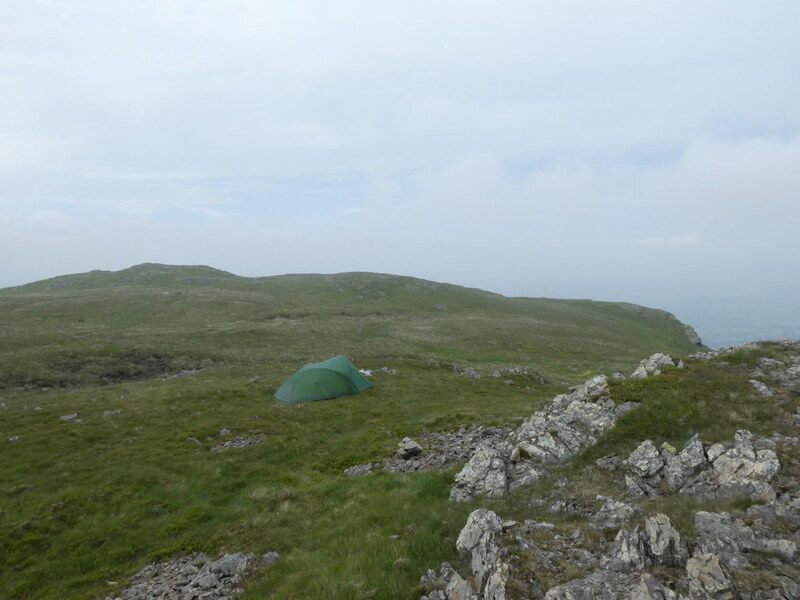 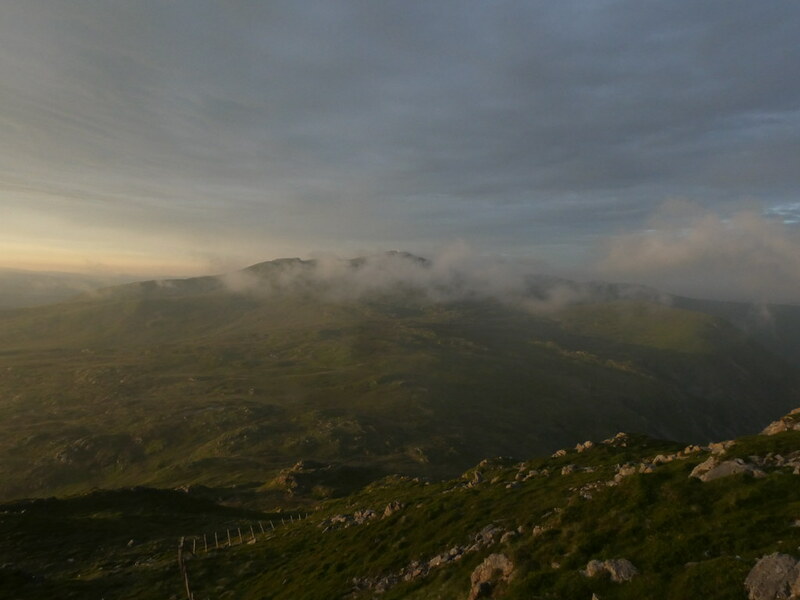 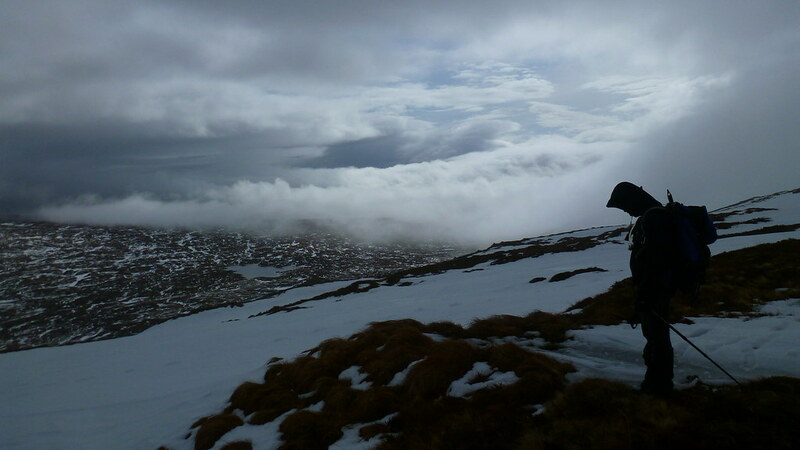 The cloud was beginning to thicken but the weather was still grand and the return down the ridge was equally fine. 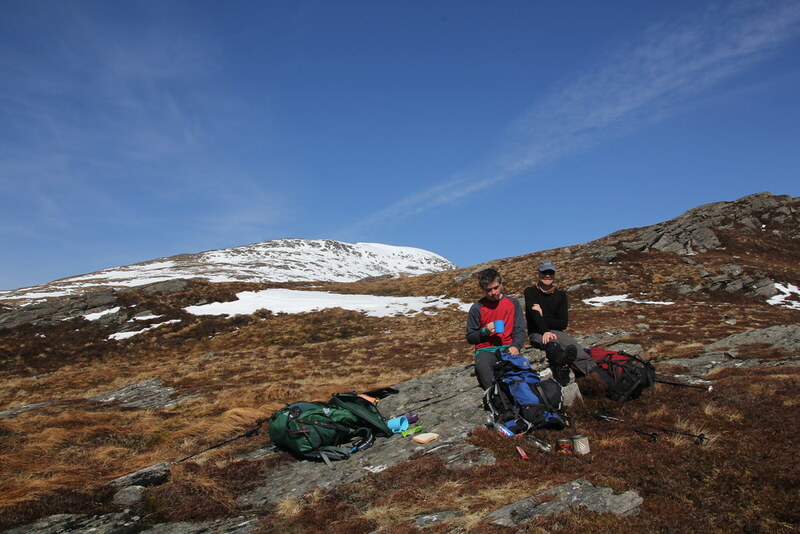 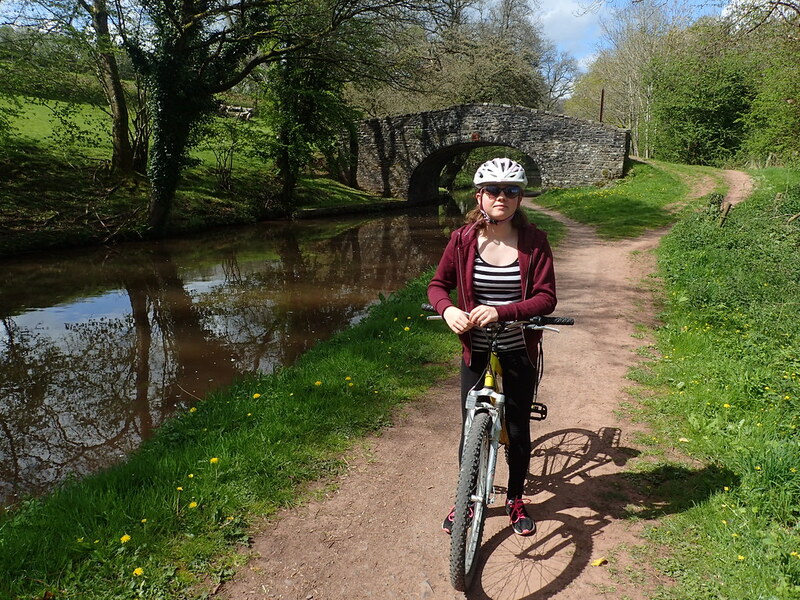 We reached the packs, scoffed some more food and headed off. 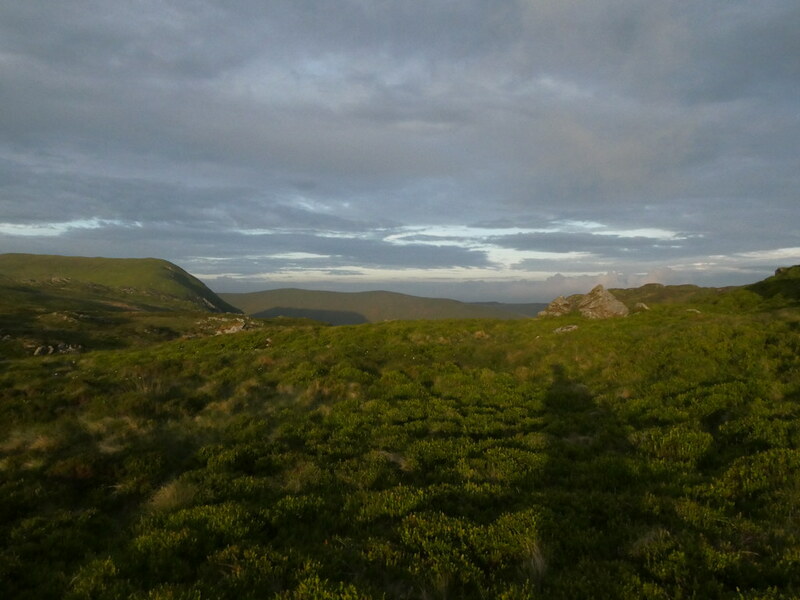 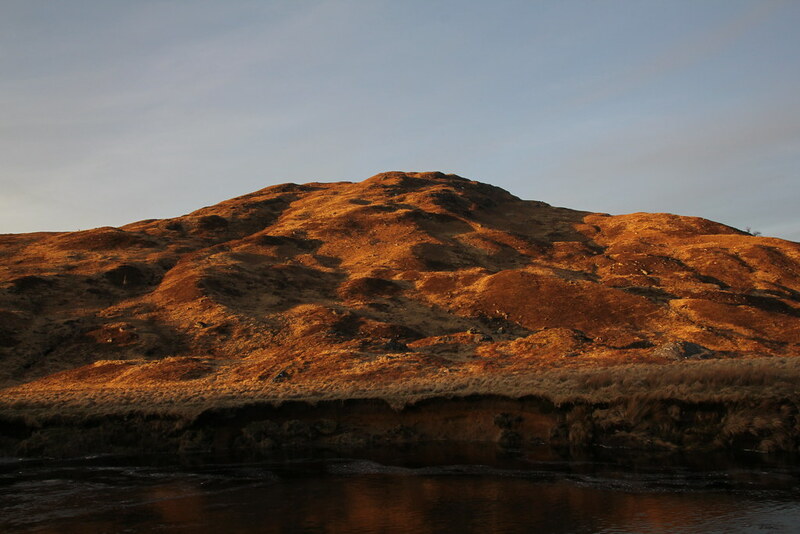 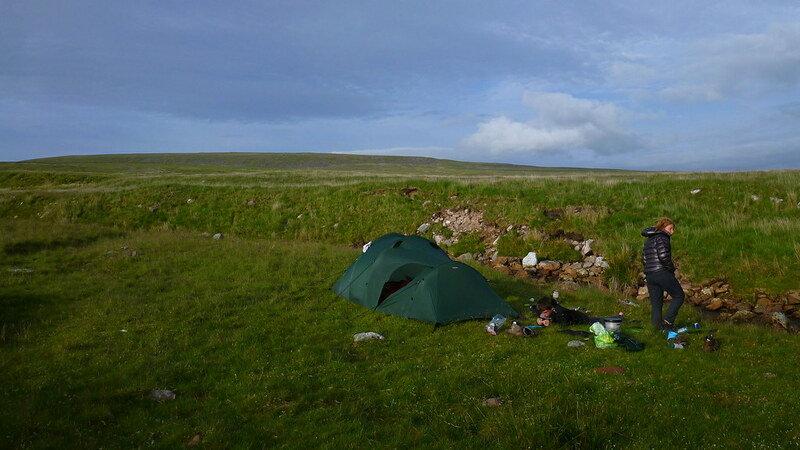 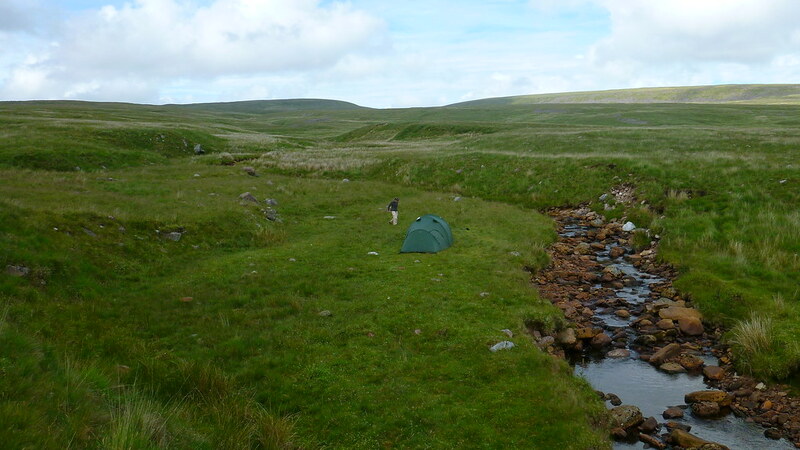 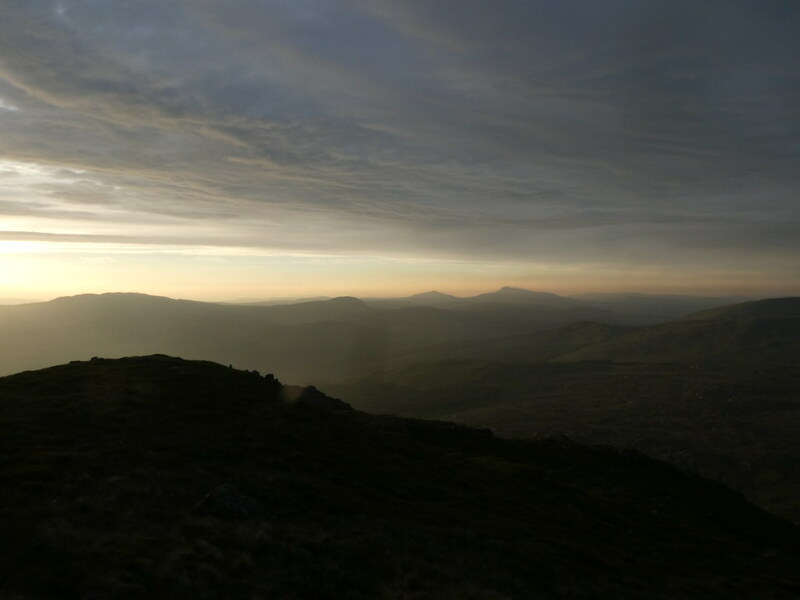 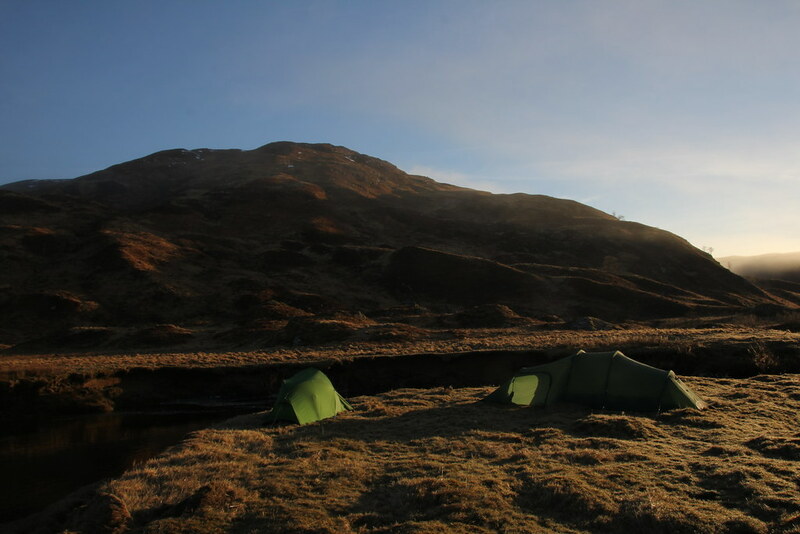 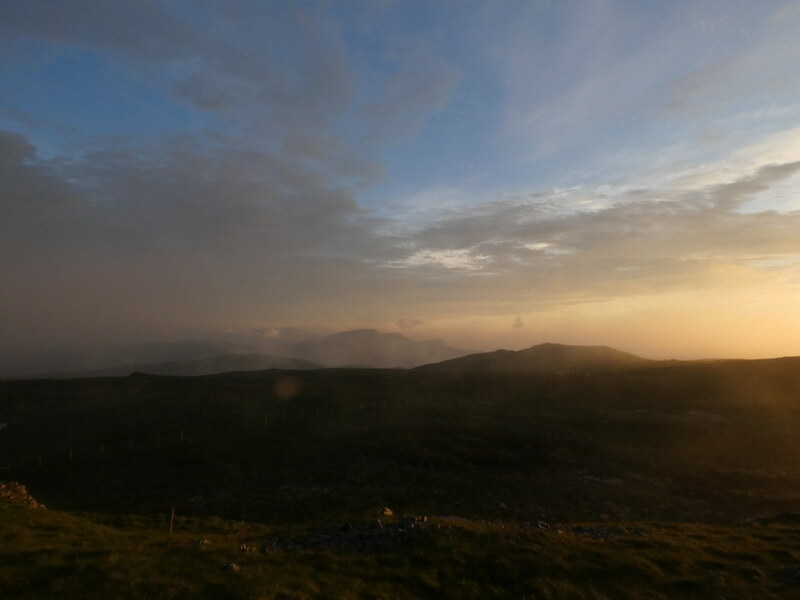 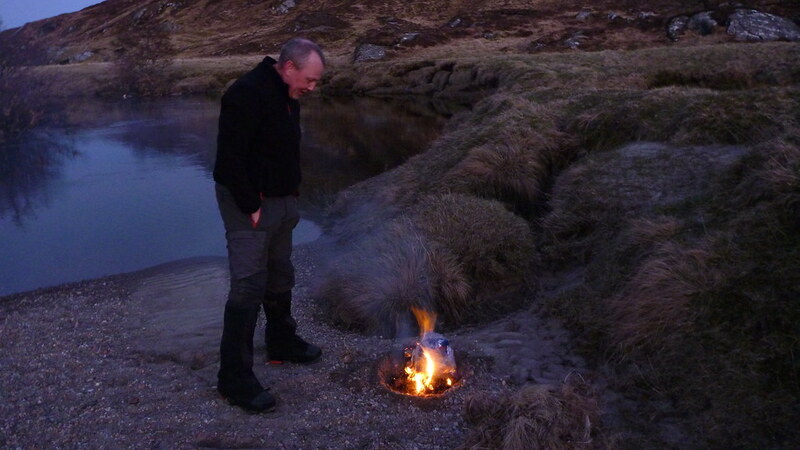 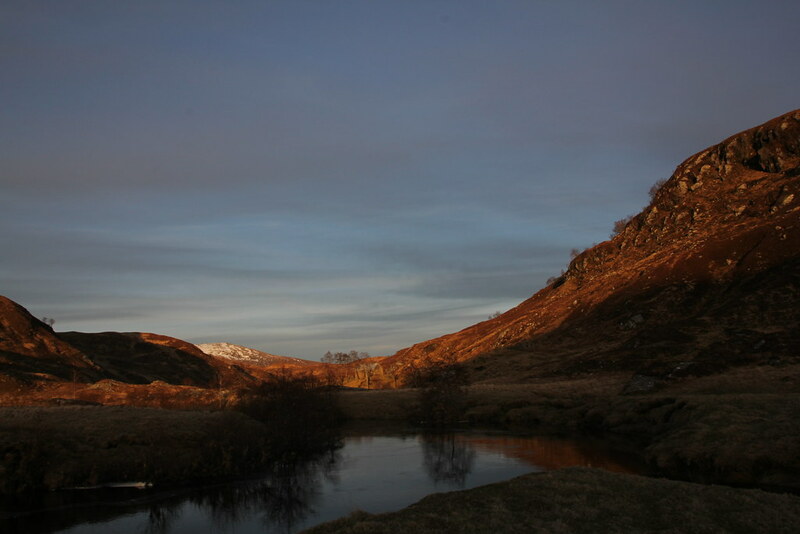 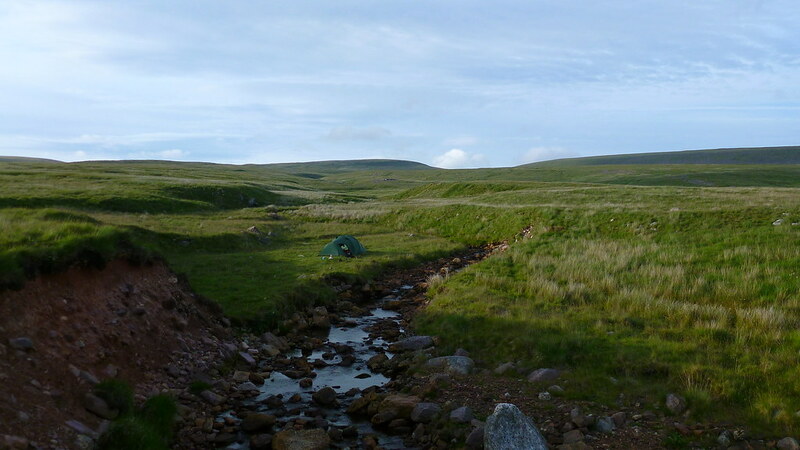 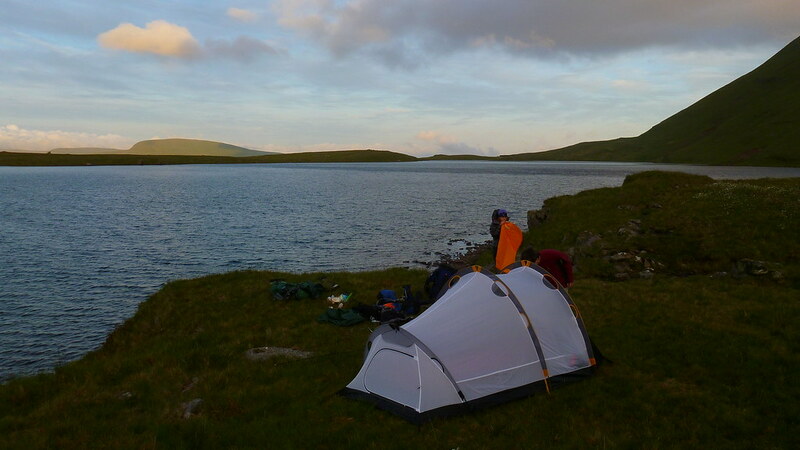 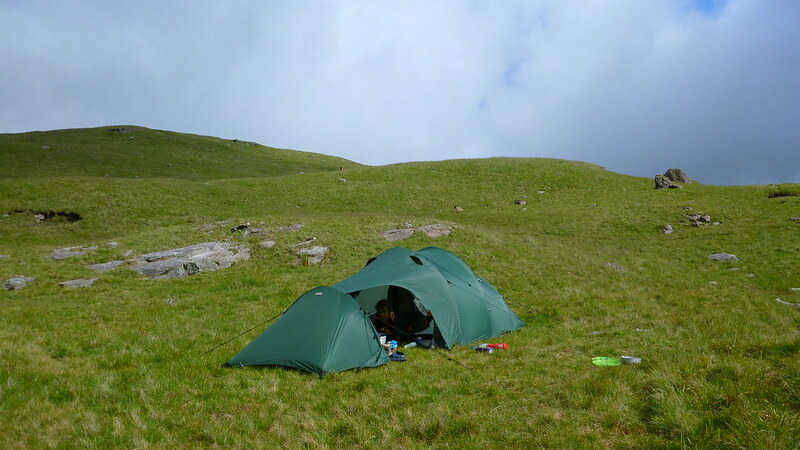 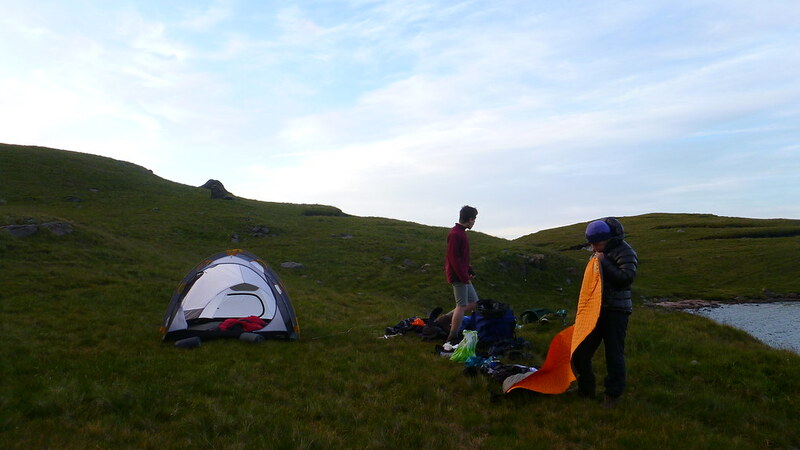 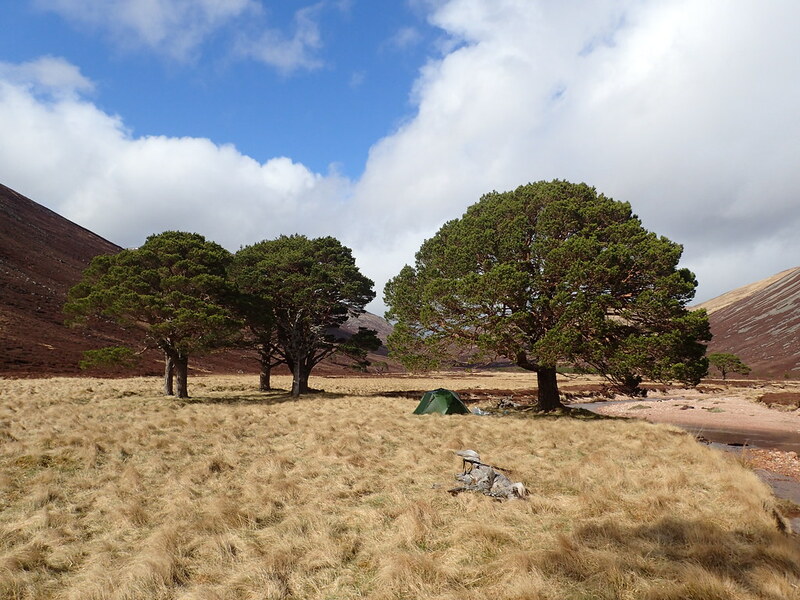 We had a plan to camp near Staoineag bothy and headed off to cut the corner off cross-country. 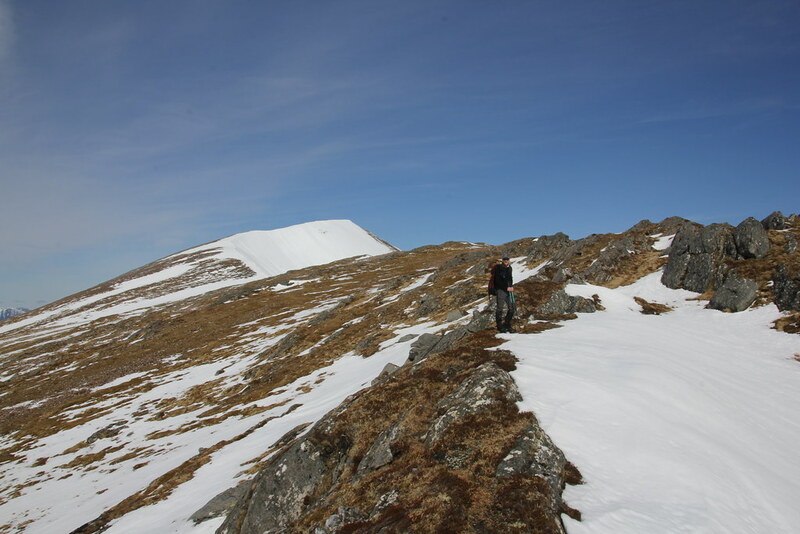 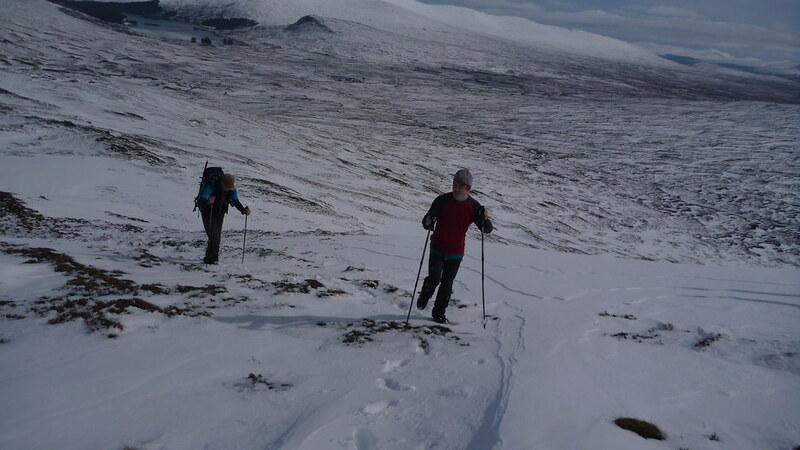 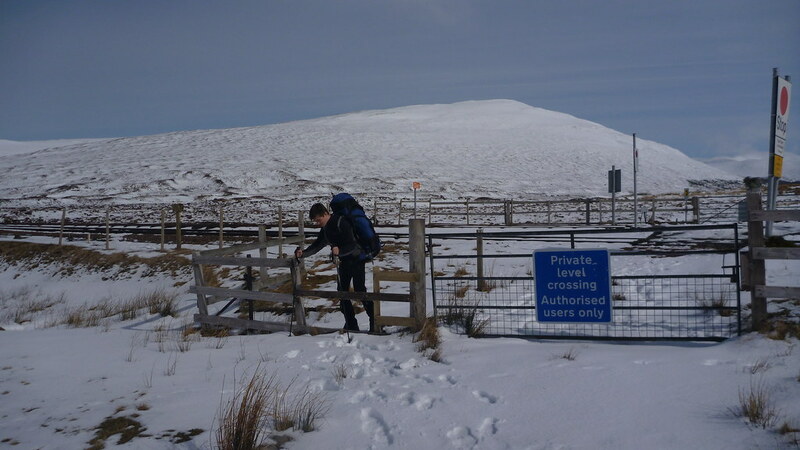 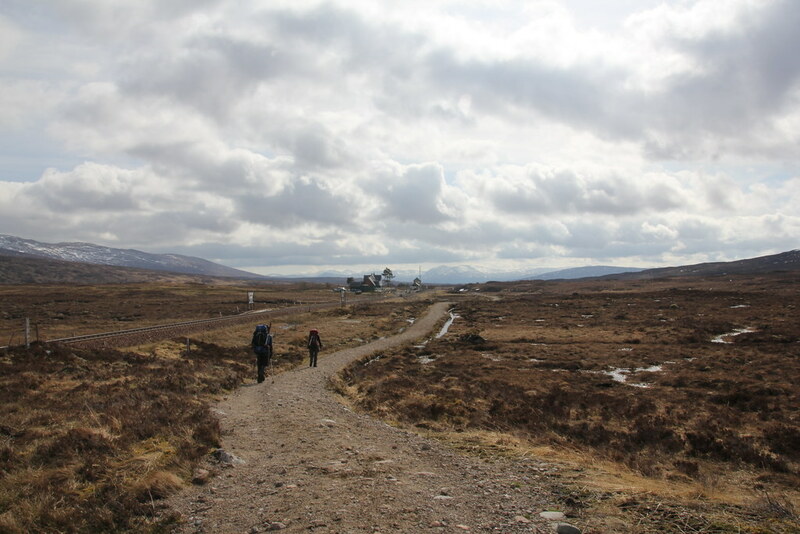 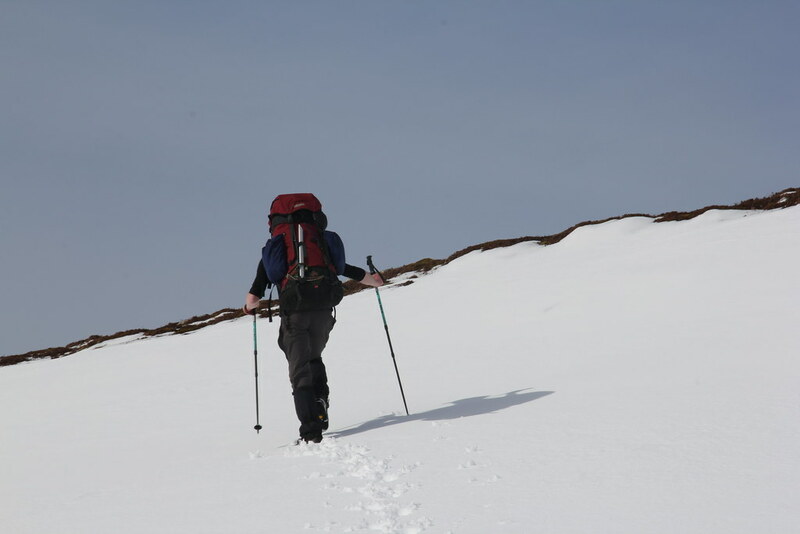 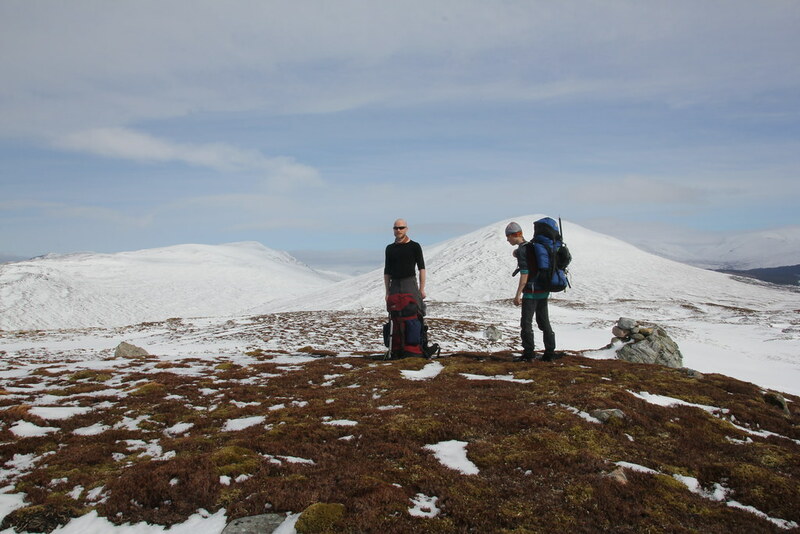 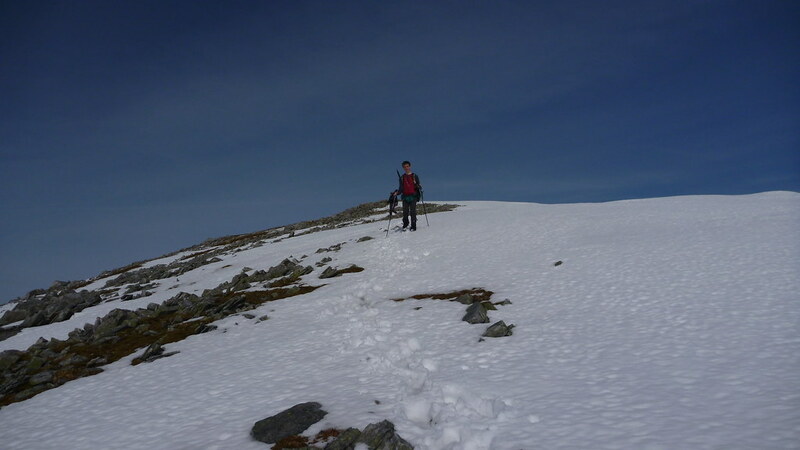 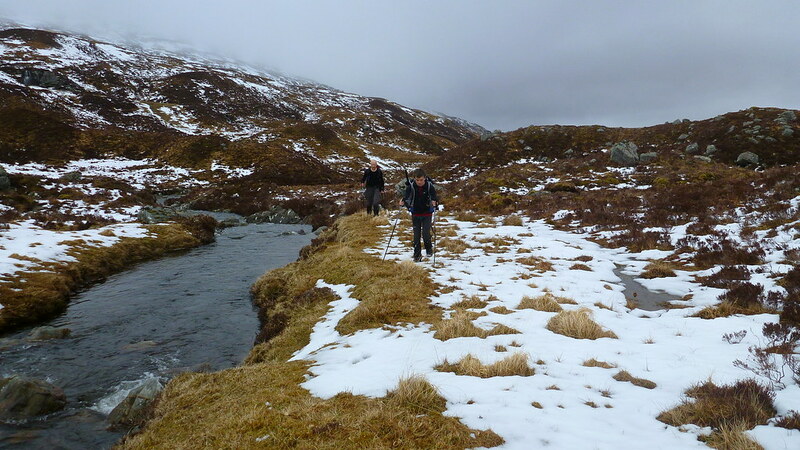 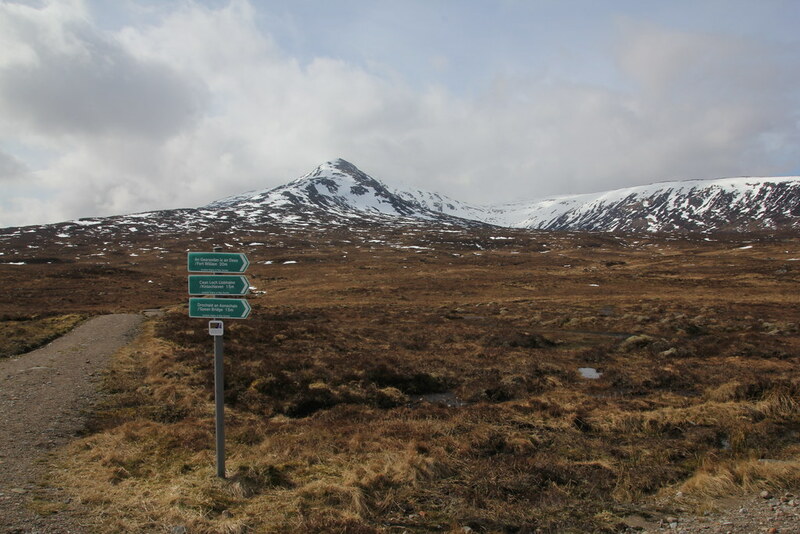 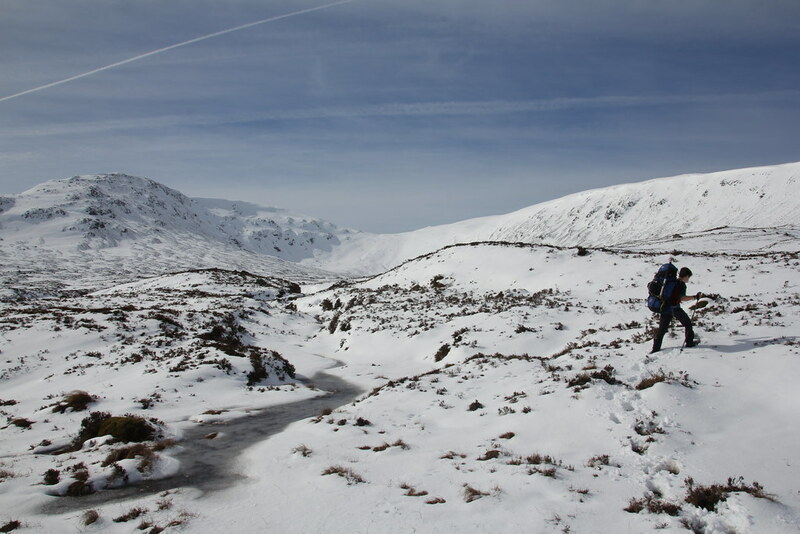 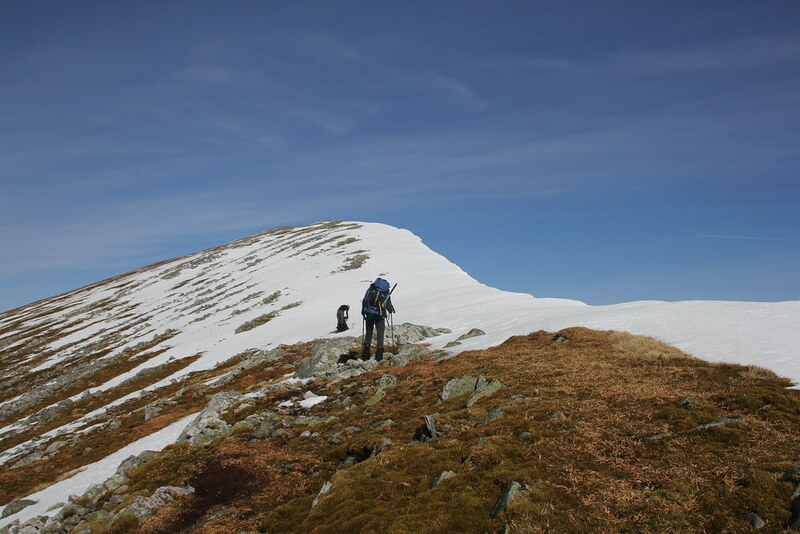 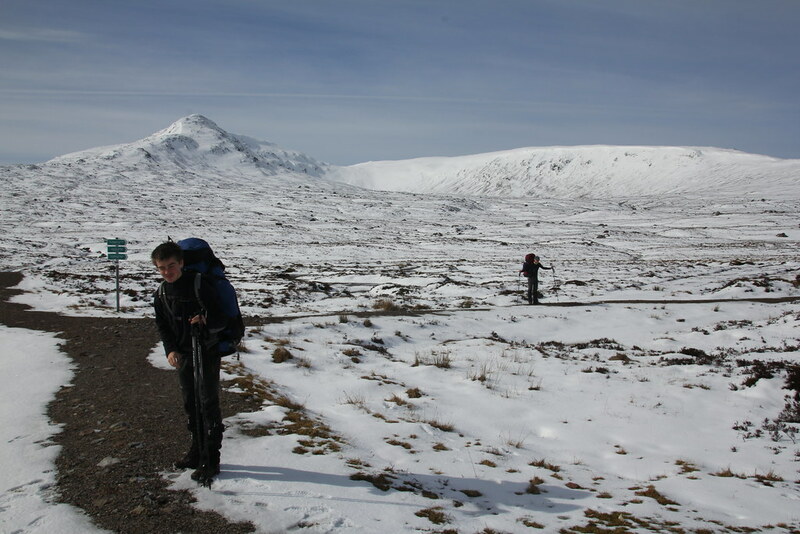 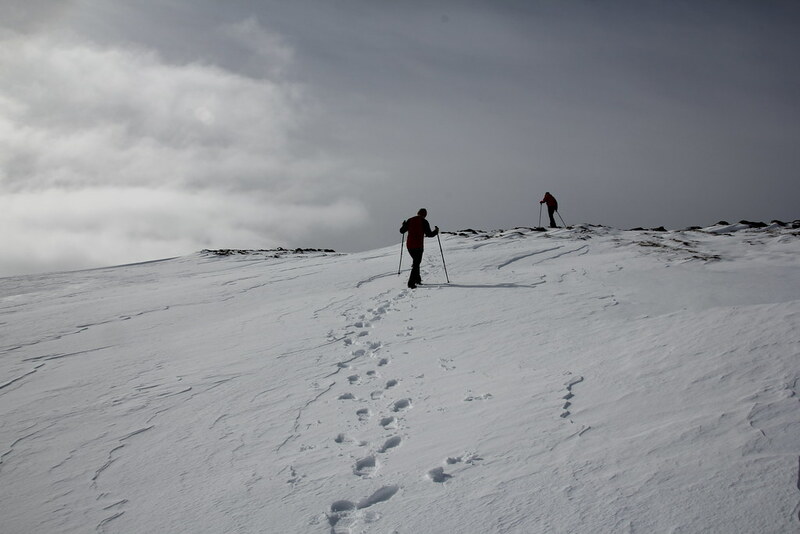 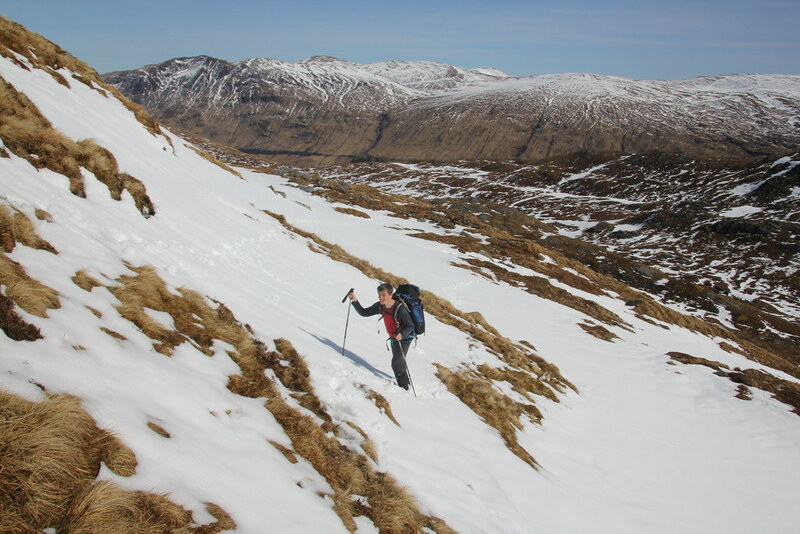 The snow was thawing and crossing slushy snow-covered Scottish bog with a heavy pack was no fun. 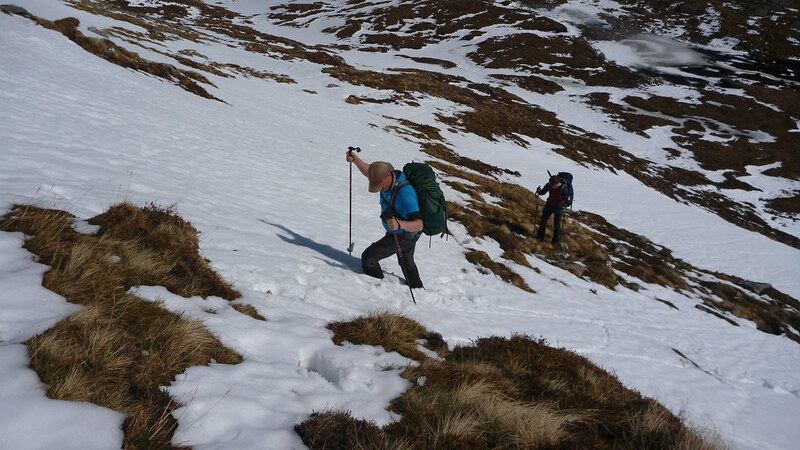 TJS was in particular finding it tough. 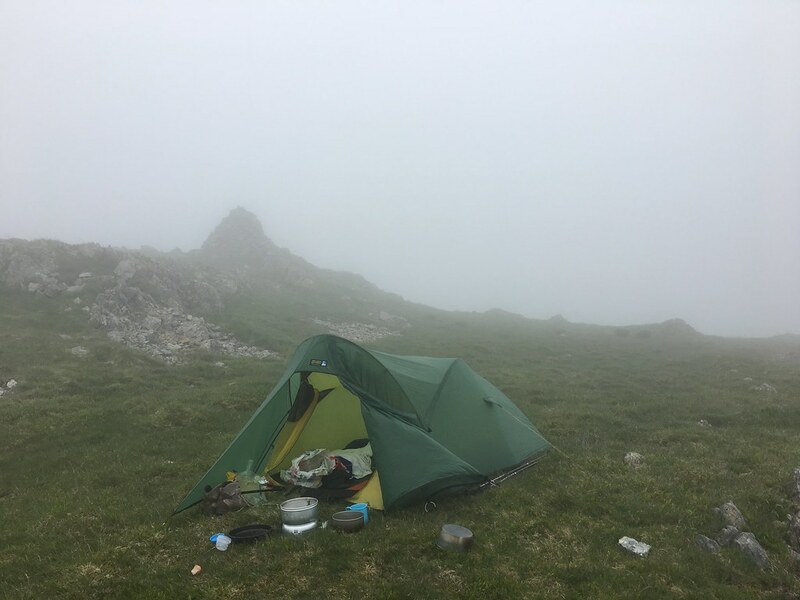 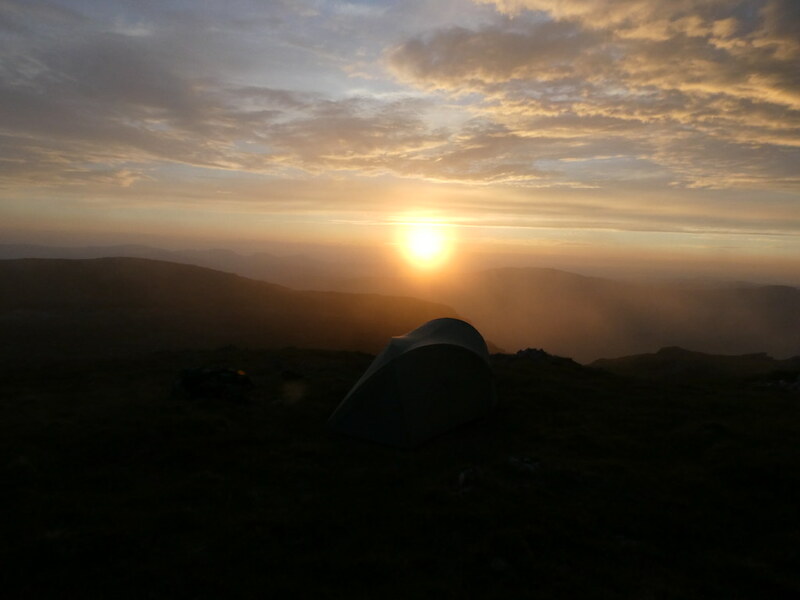 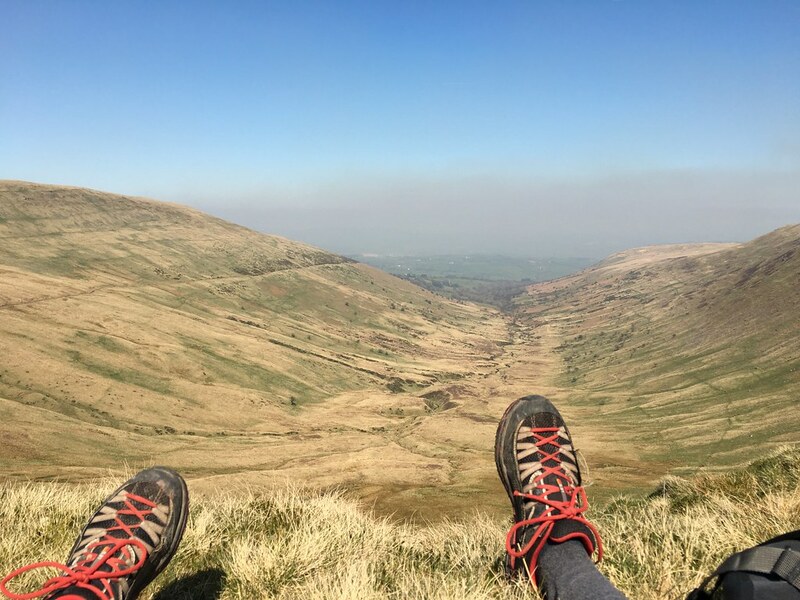 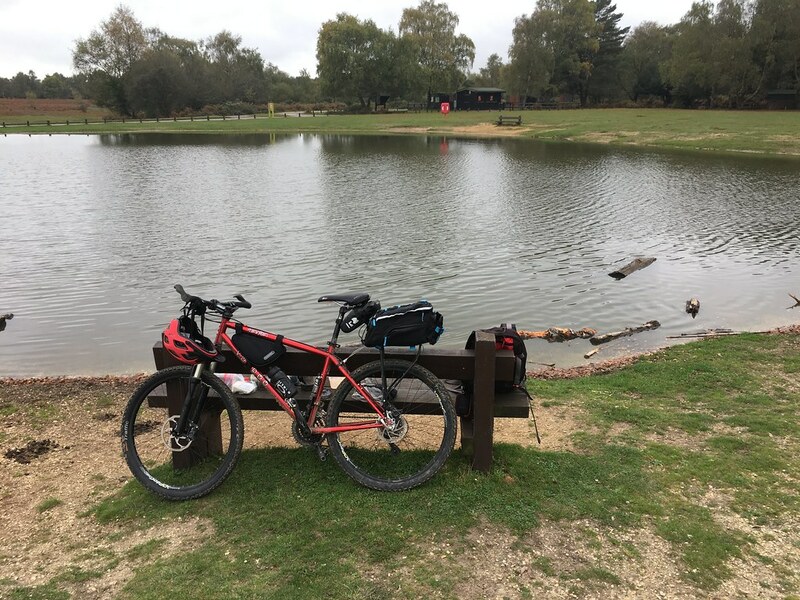 He’s only ever backpacked in summer before, a single night with a couple of days food, lightweight sleeping bag and minimal clothing. 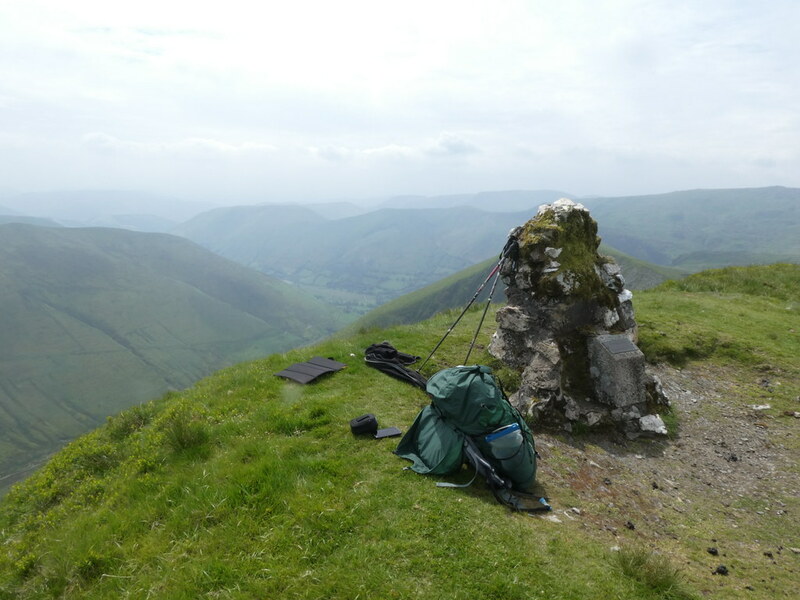 Even though me and GM were carrying the bulk of the weight his pack was still an order of magnitude heavier than he’s ever carried before and he was clearly suffering. 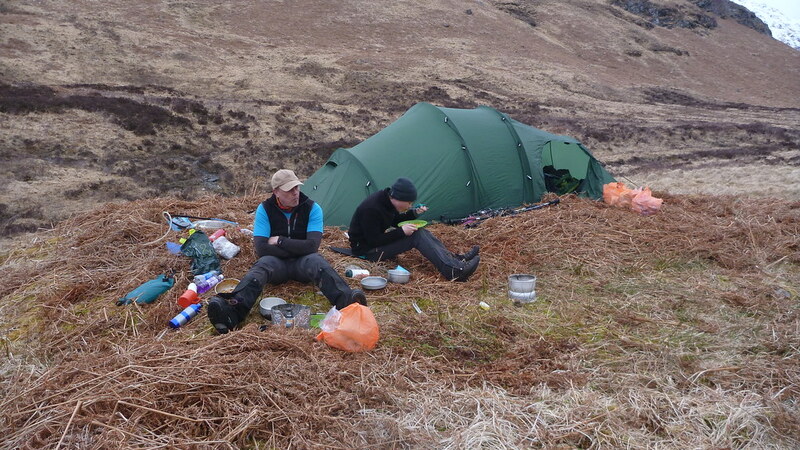 To be honest so were me and GM. 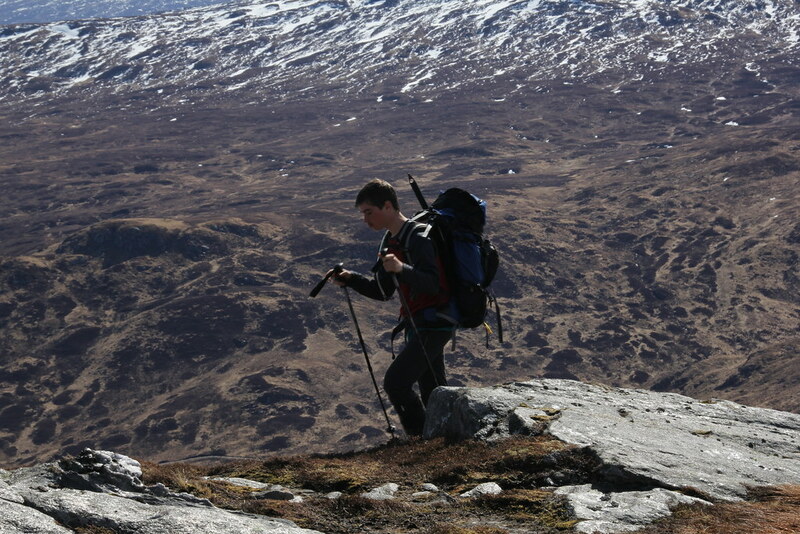 I had a new pack (A Granite Gear Nimbus Trace if you’re interested) and even though it’s substantially lighter than my old one it doesn’t help when you fill it with heavy stuff. 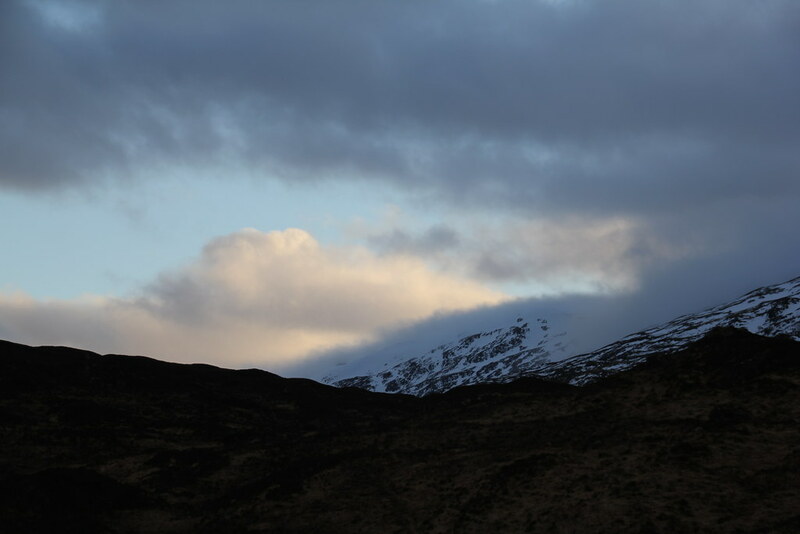 Still, the snow-capped mountain views kept our spirits up. 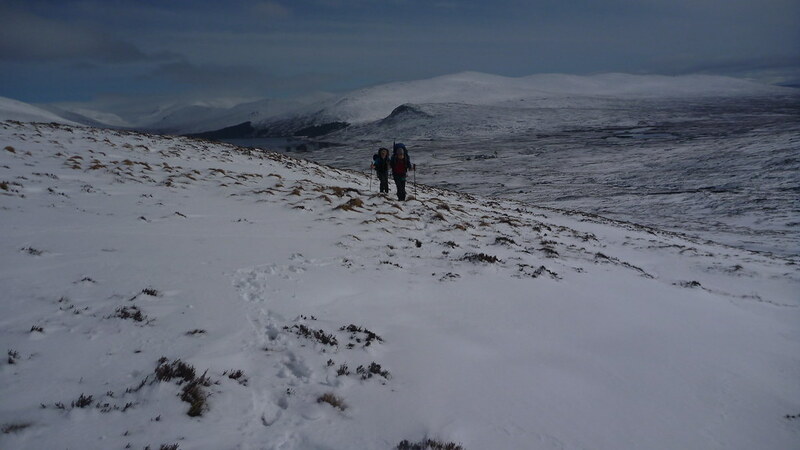 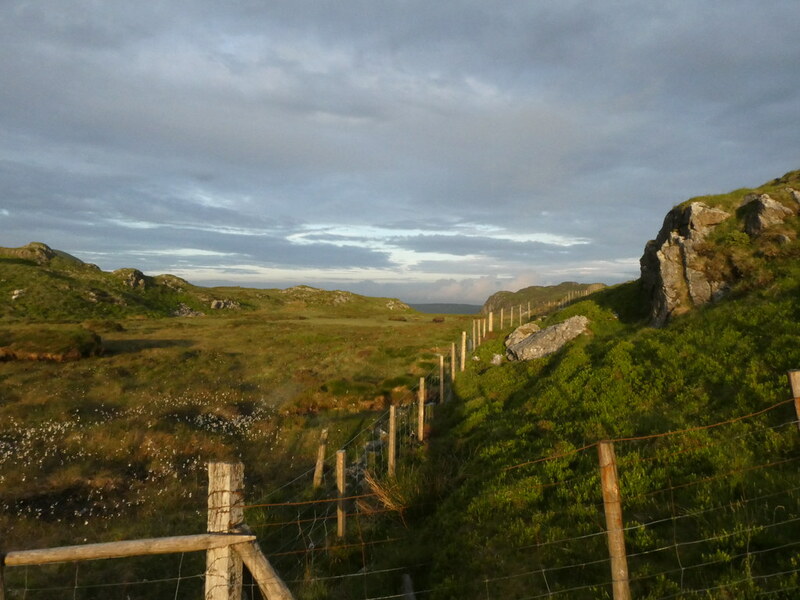 By the time we’d dropped down into Gleann Iolairean we were spent. 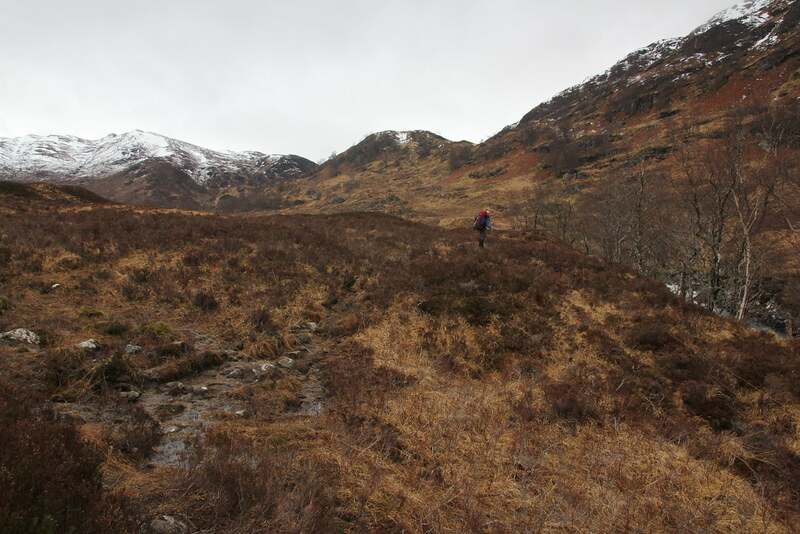 It’s a soggy valley, albeit a nice one with a grand view down Loch Treig, but GM found an elevated patch of bracken that was reasonably dry. 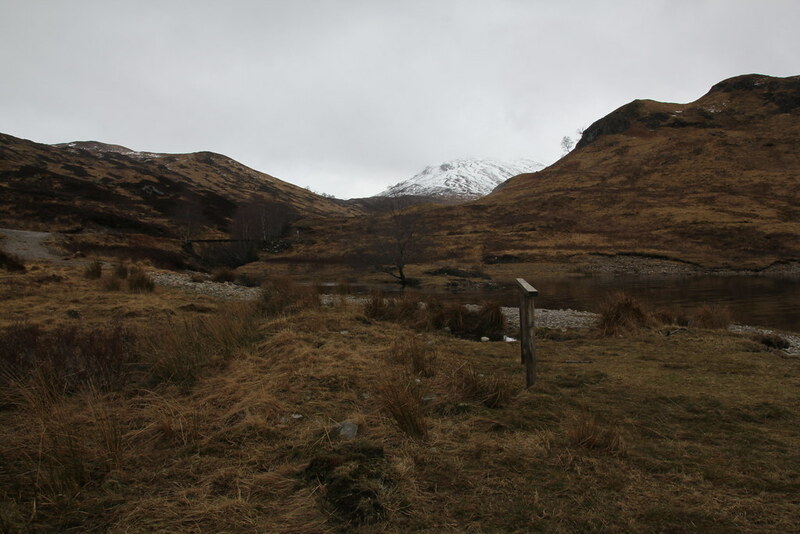 It was good enough and after re-enacting our own version of the Highland Clearances we were pitched. 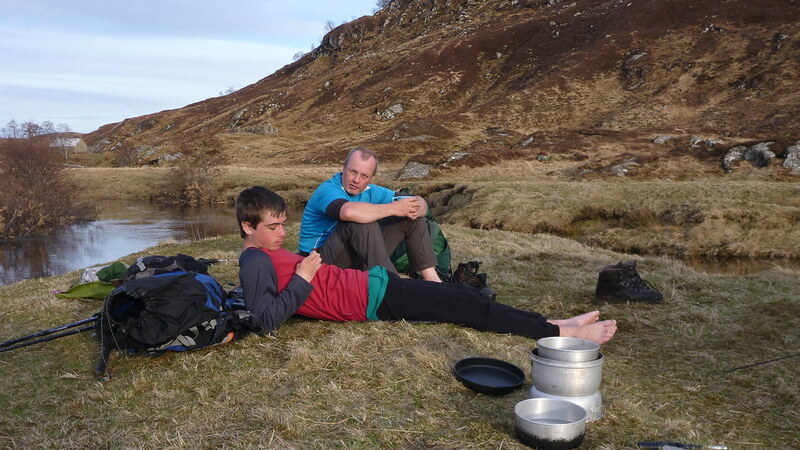 I’ve never enjoyed a brew as much as I did at that point!